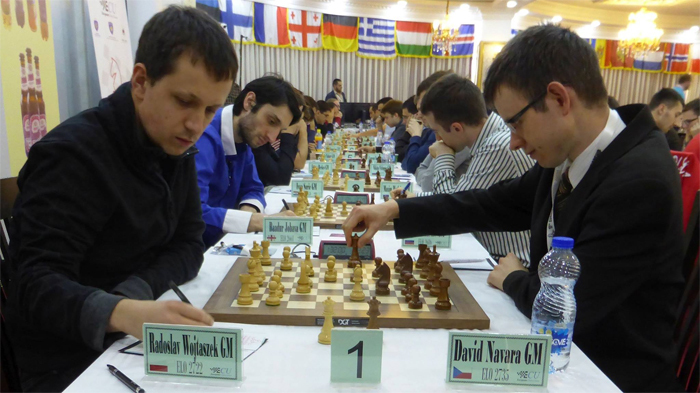 Heading into the final round – against what proved to be my toughest test of the weekend, a 2250 rated FIDE Master! This weekend proved to be a weekend of firsts. First time riding Amtrak without major delays. 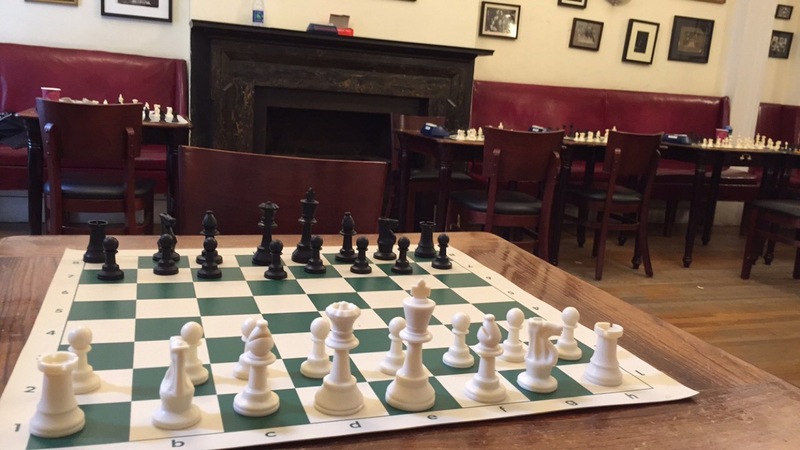 First time playing chess in the state of New York. 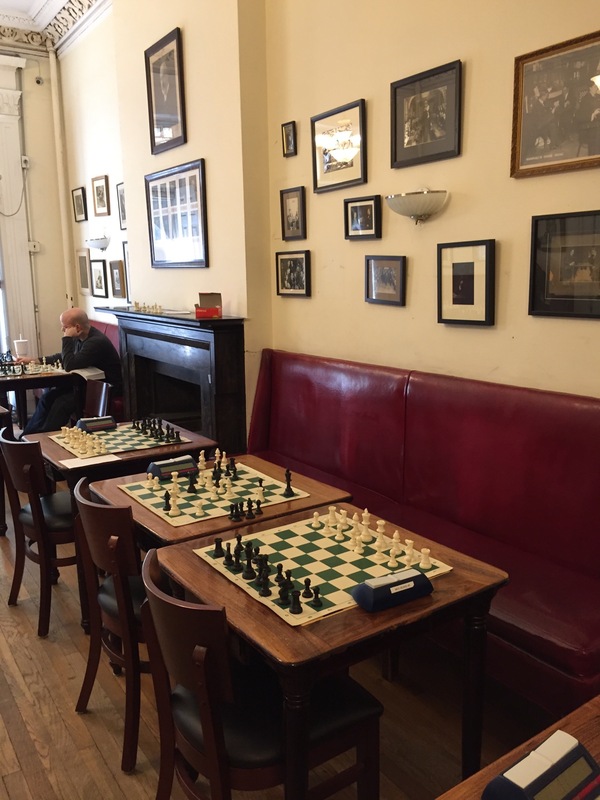 First time visiting New York City and the Marshall Chess Club. But amidst all of the distractions, my first time winning an adult tournament! Of course, I had more than my fair share of luck, but we’ll get to that later. 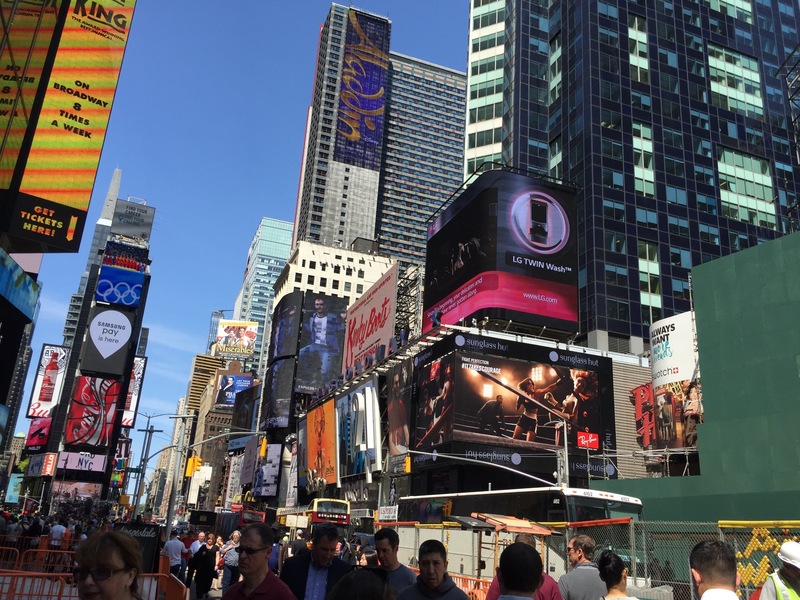 With the late rounds each day, I had plenty of time to explore the city and visit some nearby attractions. While blitz in Washington Square Park was definitely the most entertaining for me, cliched visits to the Empire State Building and the Flat Iron were also highlights of the trip. As a foodie, New York proved to offer more than I could try. Thanks to some prior research, I thought I had a pretty good sampling of the local cuisine – late night pizza, meatball subs, Japanese barbeque, tacos, doughnuts, and bagels. I don’t think I’ll ever have as many choices when it comes to food near a tournament venue than I did here in New York City. 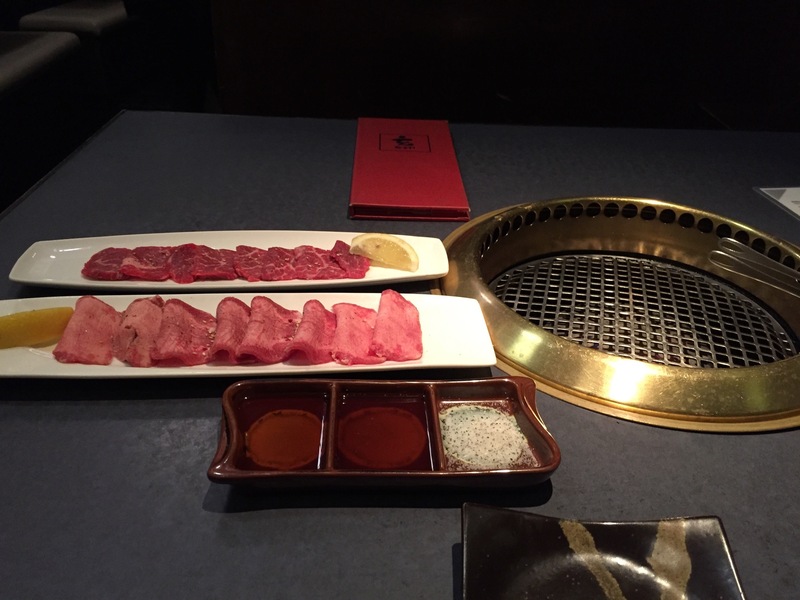 After finishing the tournament with three consecutive wins, there was only one way to celebrate – Japanese Barbeque! But enough chit-chat. Let’s talk chess. After not having played tournament chess in over a month and a half, I was a little worried my prior training wouldn’t be sufficient. It took a round 2 loss and a close win in round 3 to finally get into gear, playing much better on the last day to close out the tournament. Even though the tournament was strictly U2300 and had two time controls (40/90 with 30-second increment, 30-minute sudden death), I thought the format was close to what I’ll see in New Orleans this June. For the first 40 moves of each game, I got to simulate the US Junior Open time controls (90 minutes with 30-second increment). In reflection, I wish I could have been faster on the clock, but for my first tournament back in a while, I’m thinking that upcoming tournaments in DC and Charlotte can help me improve my time management. Lastly, I must confess, the scholastic players I faced at the Marshall Chess Club were among the most underrated group of kids I’ve ever played. The tactical prowess of my round 2 opponent was particularly impressive (and proved lethal! ), and I was nearly held to a draw by the 2016 K-3 co-National Champion! I can only wonder how strong I would be if I grew up in the area… Either way, I thought that my games against juniors gave me a good sense of what I’m up against next month. 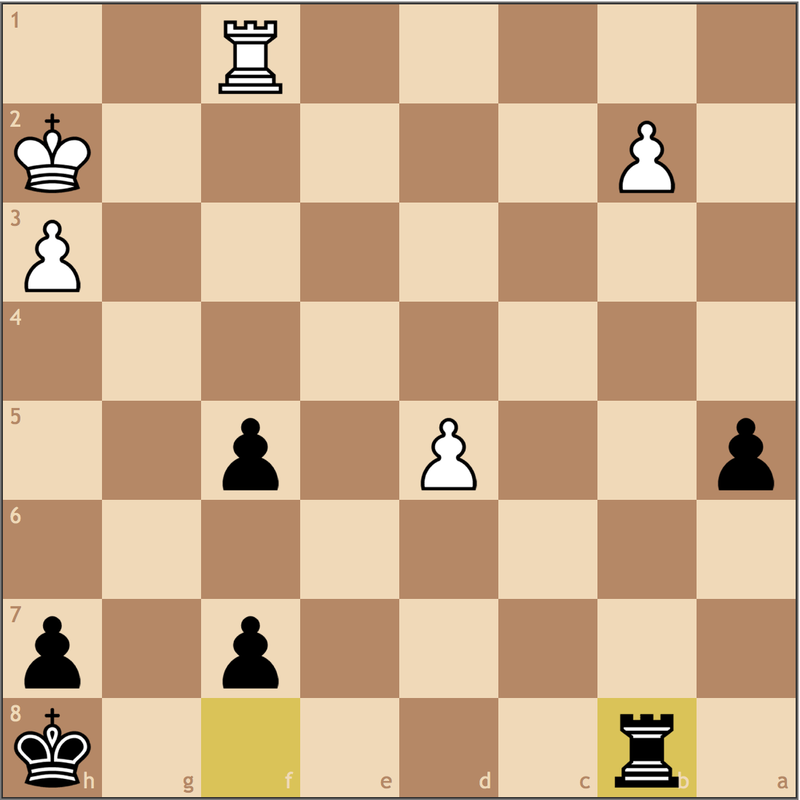 Aside from winning the event, I’m most proud of scoring 3/3 with the Black pieces. 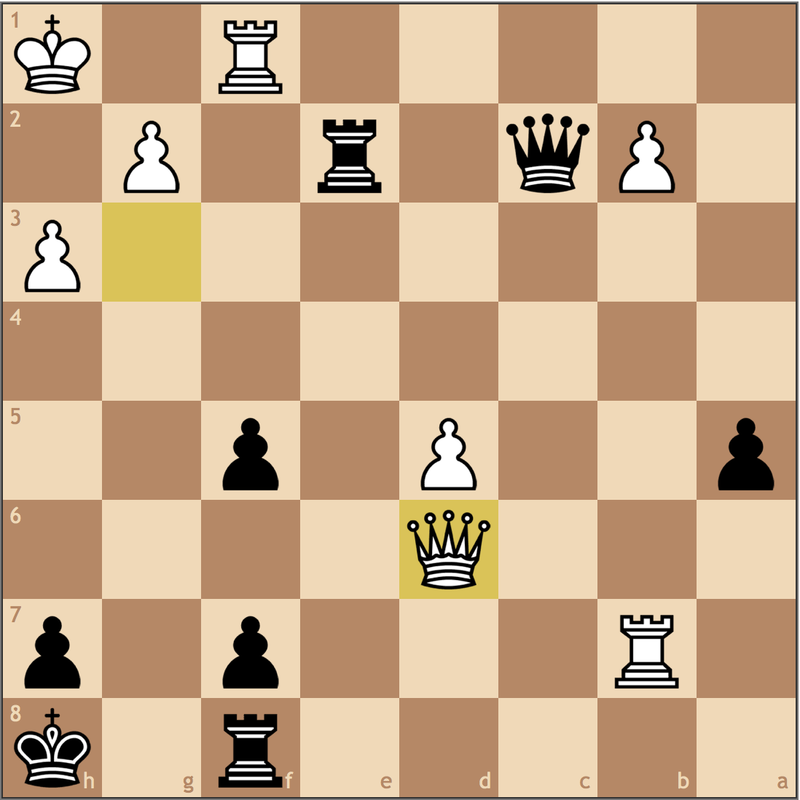 I honestly can’t remember the last time I achieved a perfect score at a tournament with Black, and I think it was this persistence that helped me capture a tie for first (especially since I started with 3 Blacks in 4 games!). That being said let’s take a look at some of the important moments of the tournament! Up to this point, I had mostly been experimenting, using an idea that an opponent once used to beat me only a couple months ago! 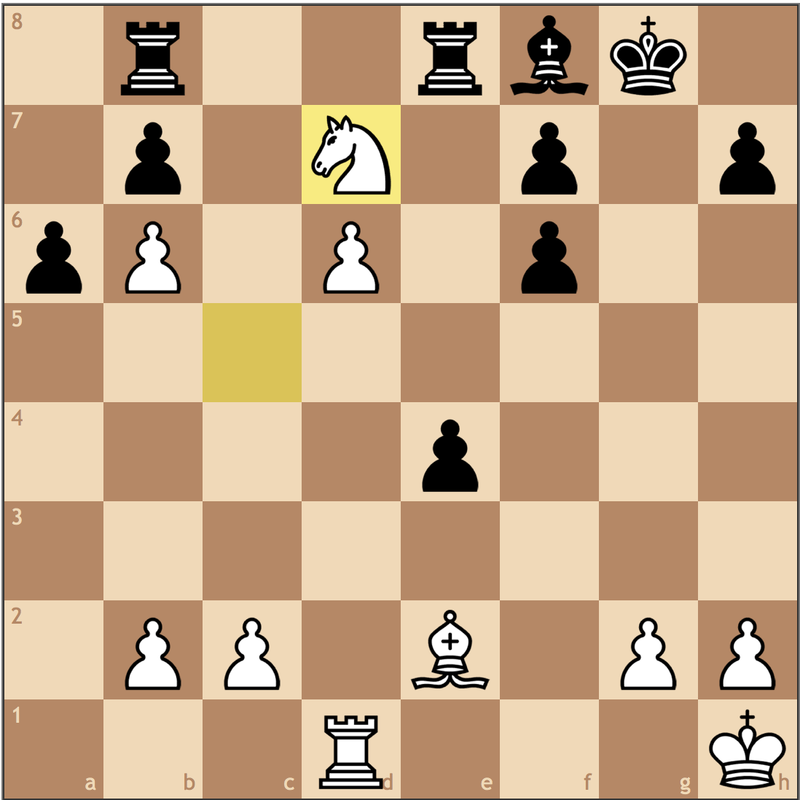 My opponent’s play has been a little awkward, and it’s unclear where the knight’s future on e4 will be. Meanwhile, my plan is concrete. I will push …f7-f5 and lay claim to the center. 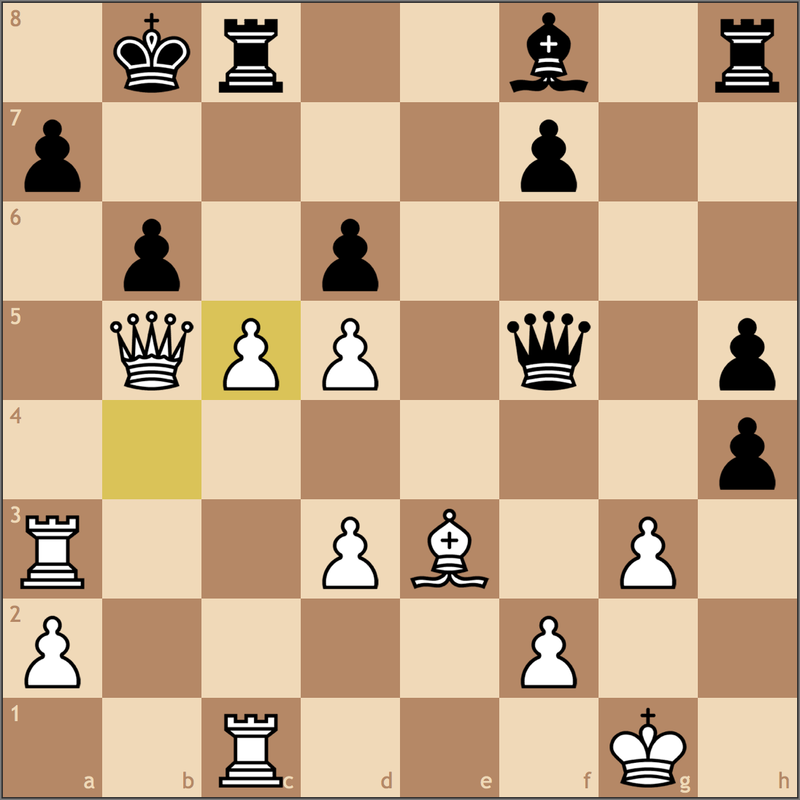 Once this happens, my opponent will have no counterplay as d3-d4 will always be met by e5-e4, shutting down White’s g2 bishop. In chess, you can’t be afraid of going into complications. With my last move, White has a choice. He can give me the center, allowing me to displace both of his knights, or he can sacrifice the knight on e4 for a few pawns, hoping the position will hold long enough to make for an endgame advantage. After a significant amount of time, my opponent made his decision, and in retrospect, probably correctly. Very double edged, but White can’t afford to sit back anymore. 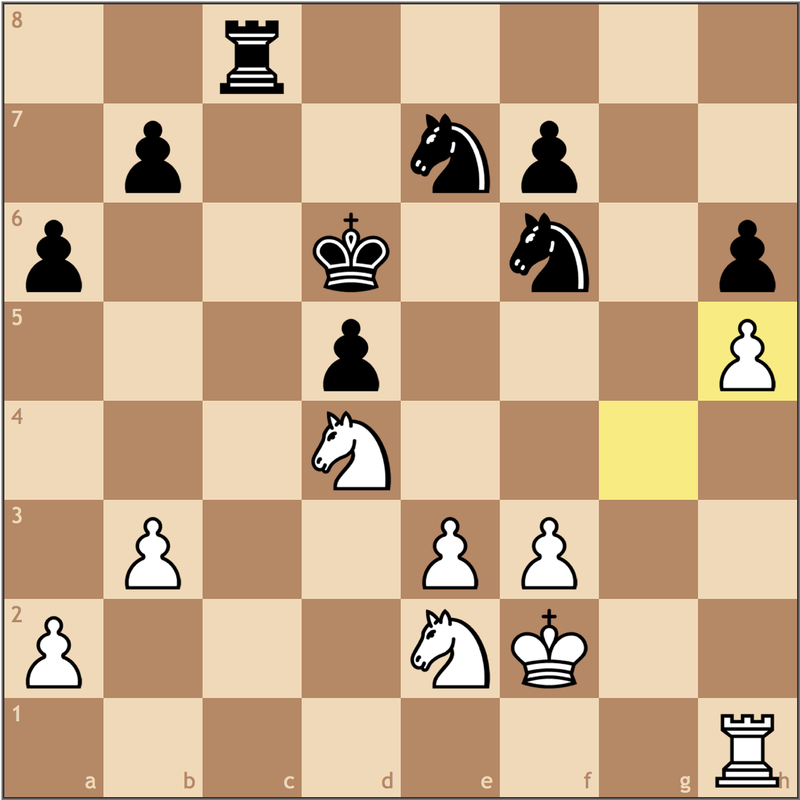 In exchange for the knight, White can get three pawns, but the position implores White to find activity, and already this is not so simple. 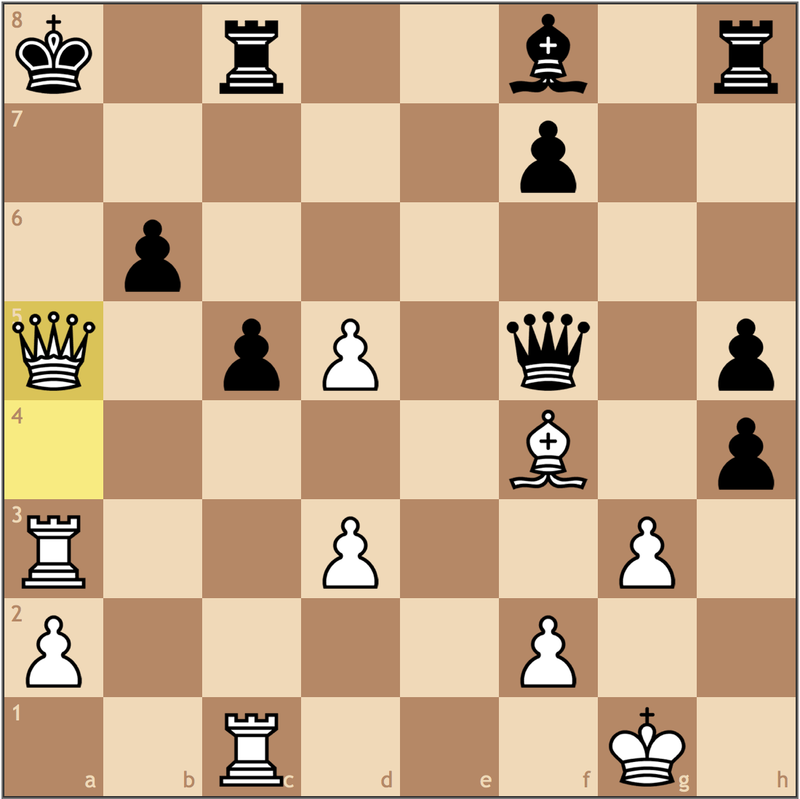 When I played 14…f5, I saw this move and assessed that I was better as the queen quickly becomes misplaced. What I didn’t consider, however, was 17. 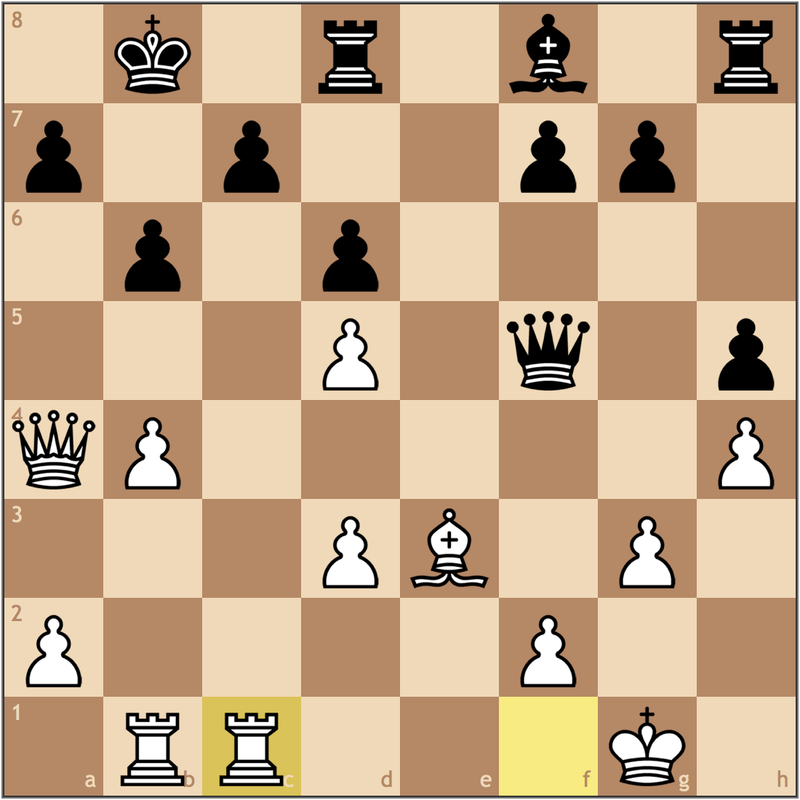 Nd2 (Stockfish’s recommendation) with “equality” in a position with lots of options. Backward knight moves are tricky to find, and especially when an active-looking check is a possibility, psychologically it can be very difficult to play the more prudent move. This would be the first of three positions where valuing a check is the deciding factor. 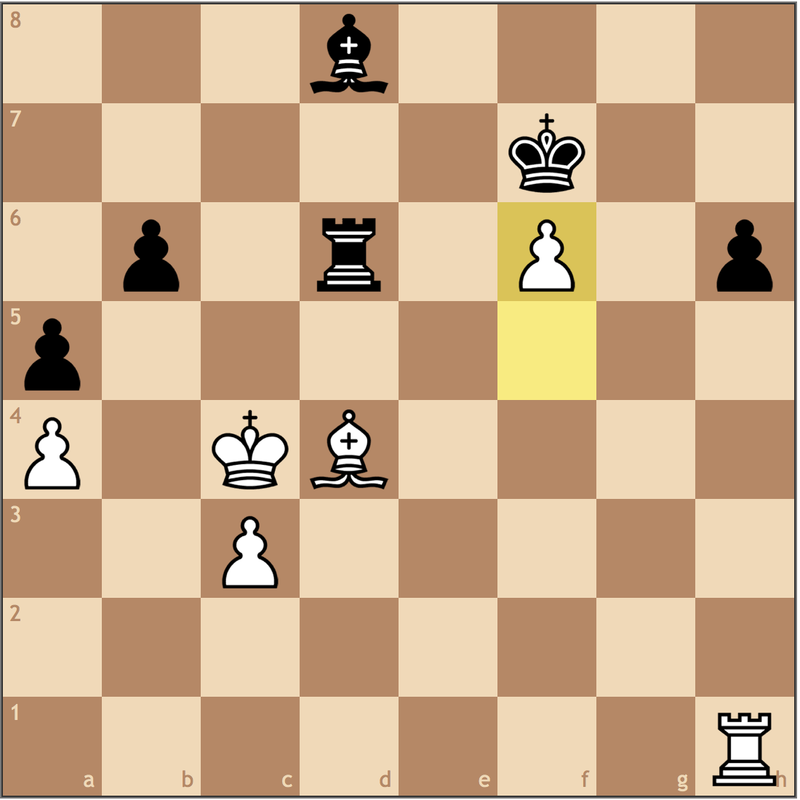 Under immense pressure, my opponent cracks in the form of a blunder! But already, it’s very difficult to find moves. 18. 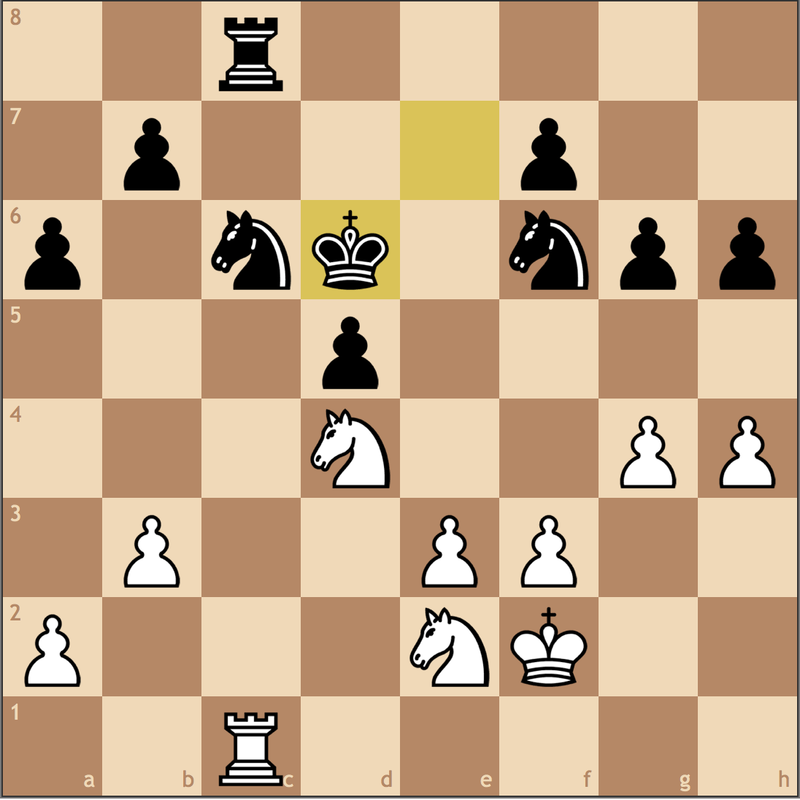 Nd2 is White’s best move, but Black is better with ideas of …Bd7-f5 once the d-pawn drops, and already, it’s becoming difficult to hold the d6 pawn. And now the endgame is winning for Black since he has the bishop pair and I don’t. I played out the ending, but it’s not too difficult to convert. Unfortunately for my opponent, this would prove to be his final victory of the weekend, but he played some inspired chess in each of his games, and I wouldn’t be surprised if he reached master level in the near future. After not much time to rest, I hurried into my third round game somewhat deflated. Though I got a decent advantage out of the opening, I misplayed the middlegame, trading queens too early and allowing my opponent to reach an equal position. 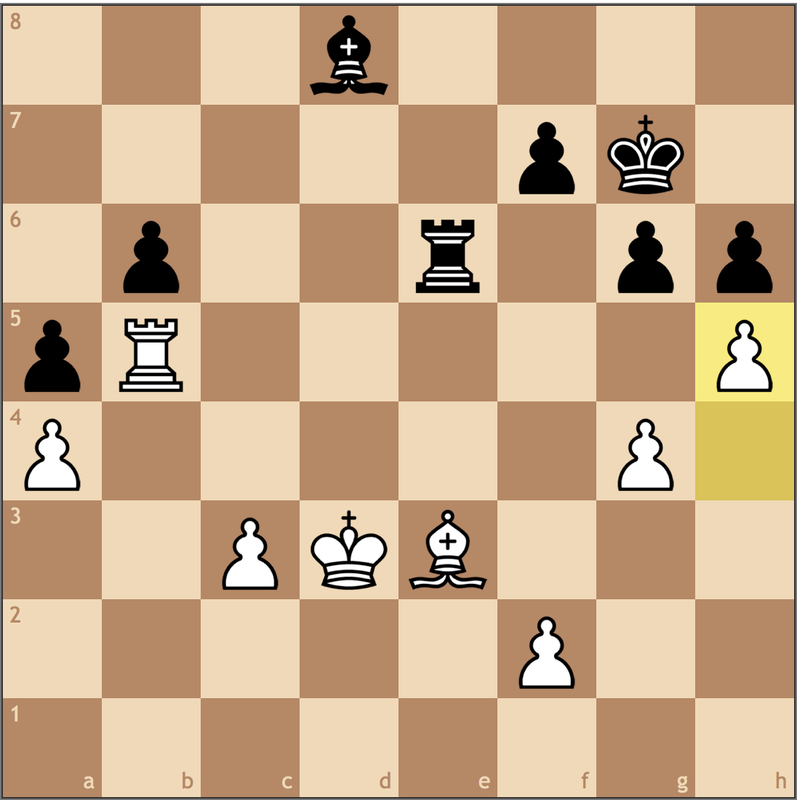 Luck was on my side, though, and in this critical moment of the game, my opponent chose the howler, 45.Be3?? Already, the game is dead lost. 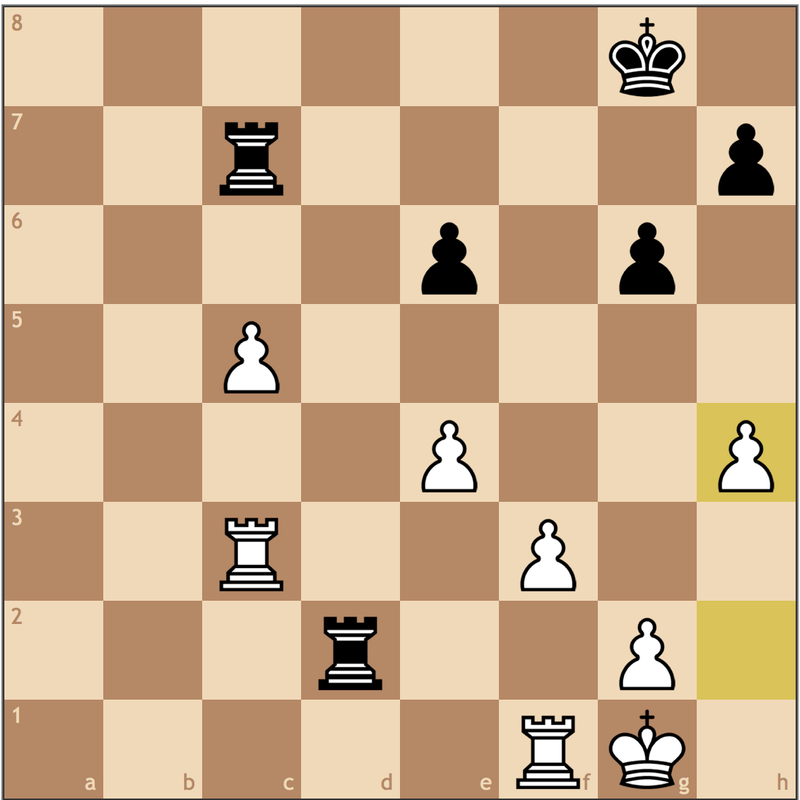 My opponent, the recently crowned K-3 National Champion, valued a check as the best move in the position, seeing that 45… Bxe3 46. Kxe3 Kc2+ 47. Ke2 was at least a draw. But as the old saying goes, “patzer see a check, patzer play a check”, and I had already seen the simple refutation to this line. Winning. 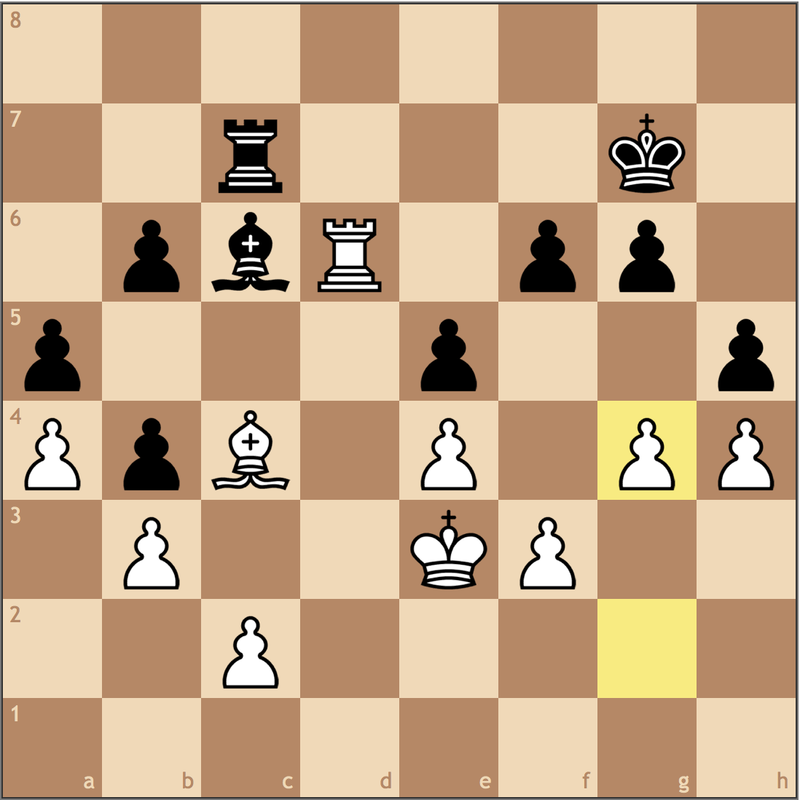 If White were to capture on d2, I would play …Re6+, capturing the rook after the king leaves the e3 square. 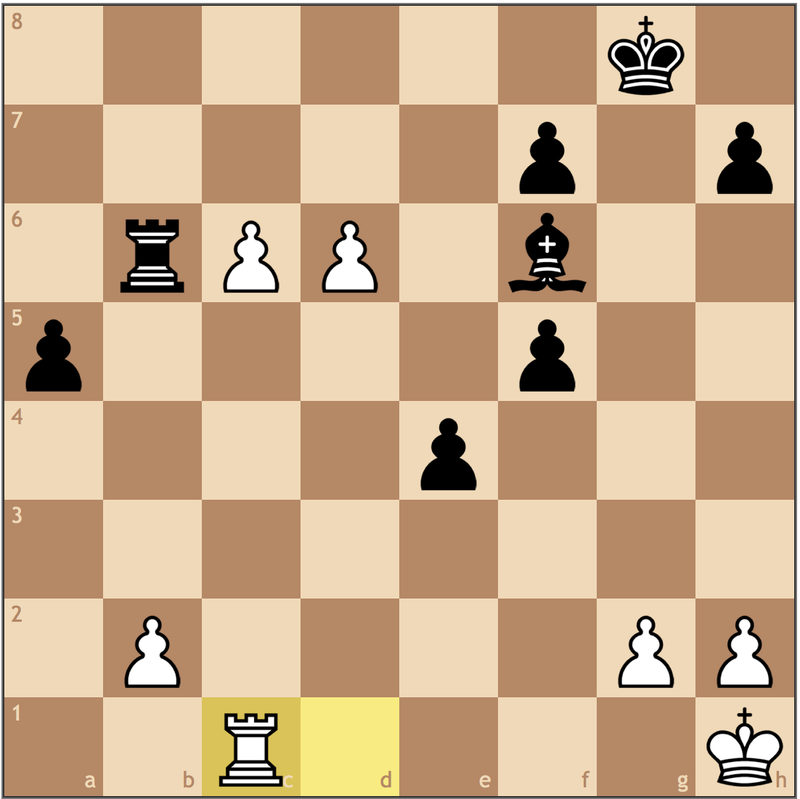 White played on till checkmate, but again, Black will at least win the rook in exchange for the d2 pawn, so the win is still fairly simple once the Black king is able to reach c2. This was a critical moment of the tournament (though I didn’t know it at the time). 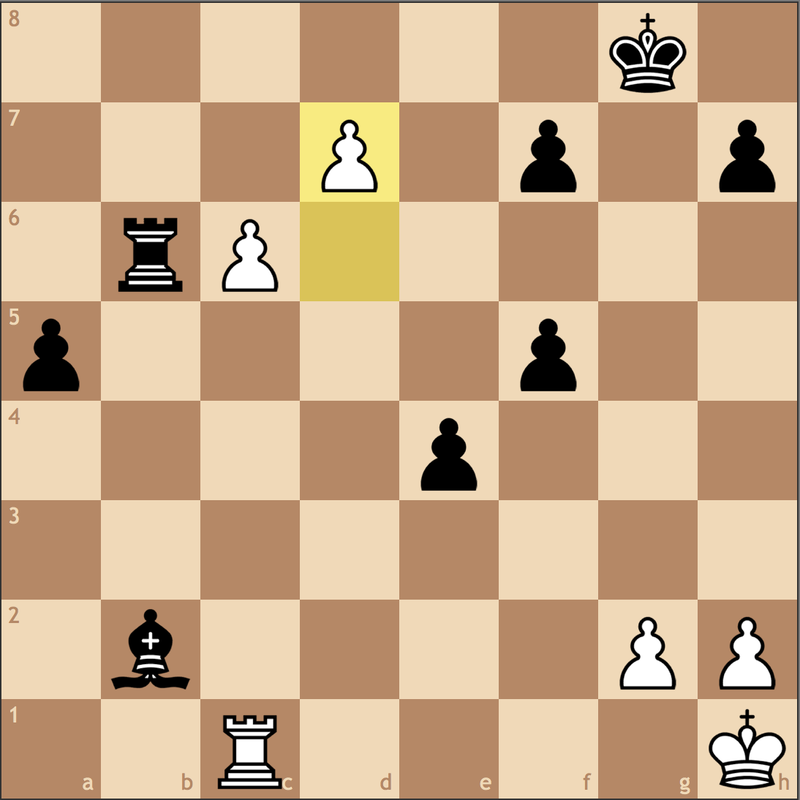 In the Russian sense, I had managed to “stop the bleeding” with a win with Black and get an opportunity to play some higher rated opponents. Rather than worrying about my quality of play up to this point, I simply relaxed and used this as an opportunity to sleep and explore the city. 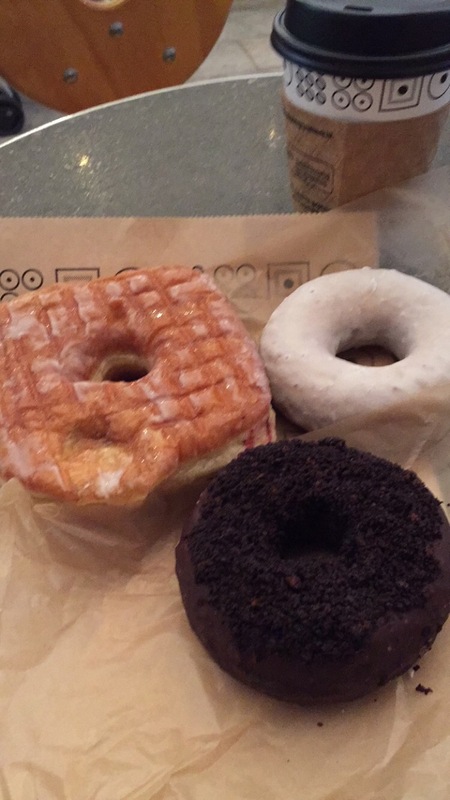 That next morning, I woke up early and hiked from Union Square to go to the Doughnut Plant. Nothing to brighten the mood like a good tres leches doughnut! Knowing that my last two rounds would define my performance in the tournament, I woke up early determined to play good chess. 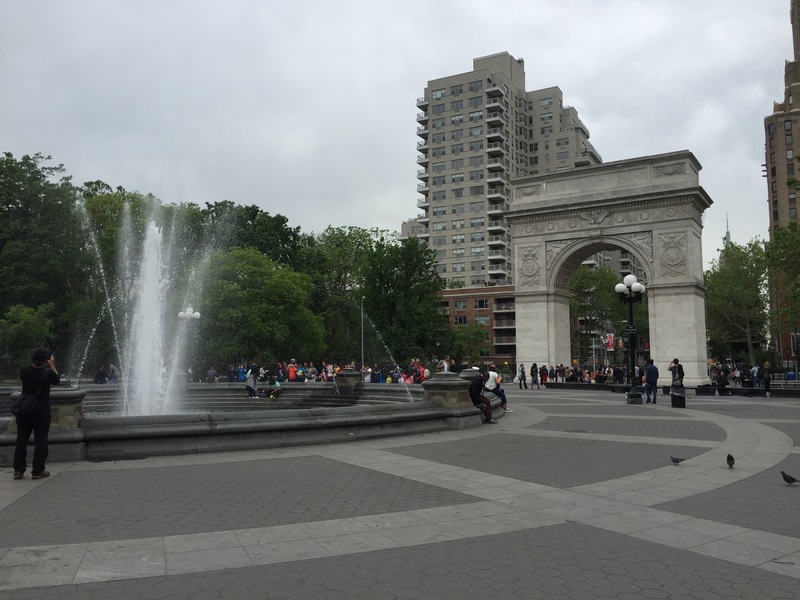 After a pleasant breakfast, I took a long walk from Madison Square Park to Washington Square Park to get some practice blitz games against the locals. After some early morning blunders out of my system, I was ready to head over to the Marshall Chess Club to start the final day of the competition. One element of the tournament that was different for me was that many of the juniors were extremely underrated. As I had seen in my previous two games, their ratings had no reflection of their actual skill. I went into the last day with a different mentality. 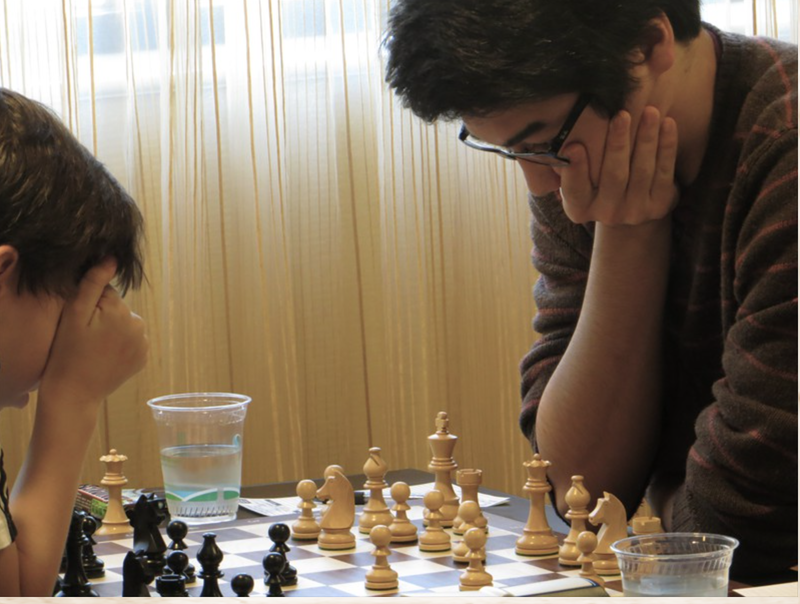 At this point, I wasn’t concerned about rating point gain and understood that being upset again this tournament wouldn’t be a reflection of my understanding of chess, but rather a confirmation of the local talent. That being said, my last two games were against adults, so the wrath of the children had stopped. After starting with a King’s Indian, my opponent veered off course with an optimistic knight sac. 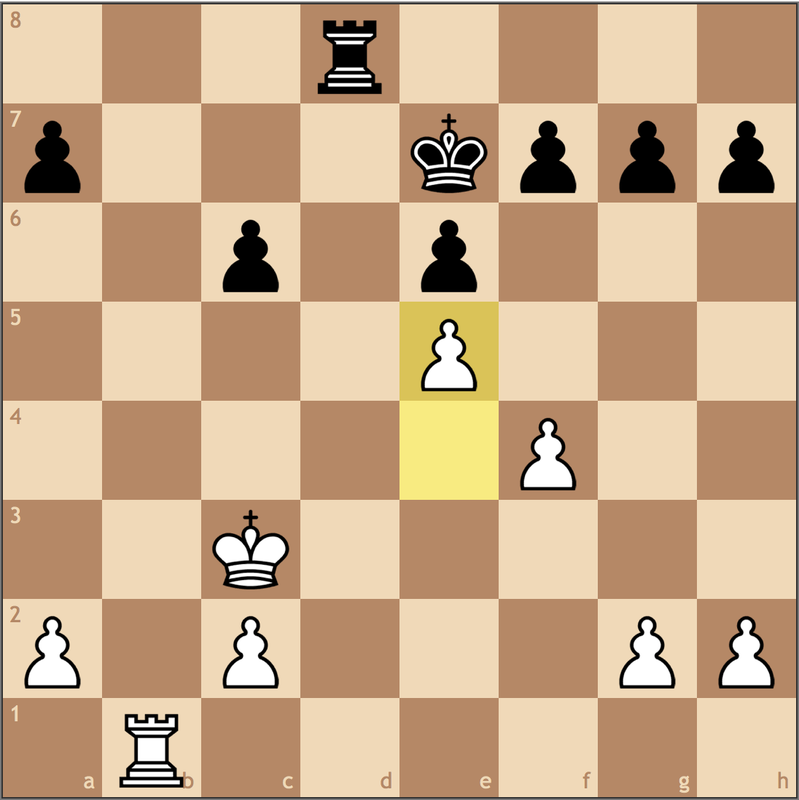 I had already calculated this line when I played …e7-e5, and knew that White simply didn’t have enough material to make anything of this sacrifice. Feeling this is one thing, defending it is another. 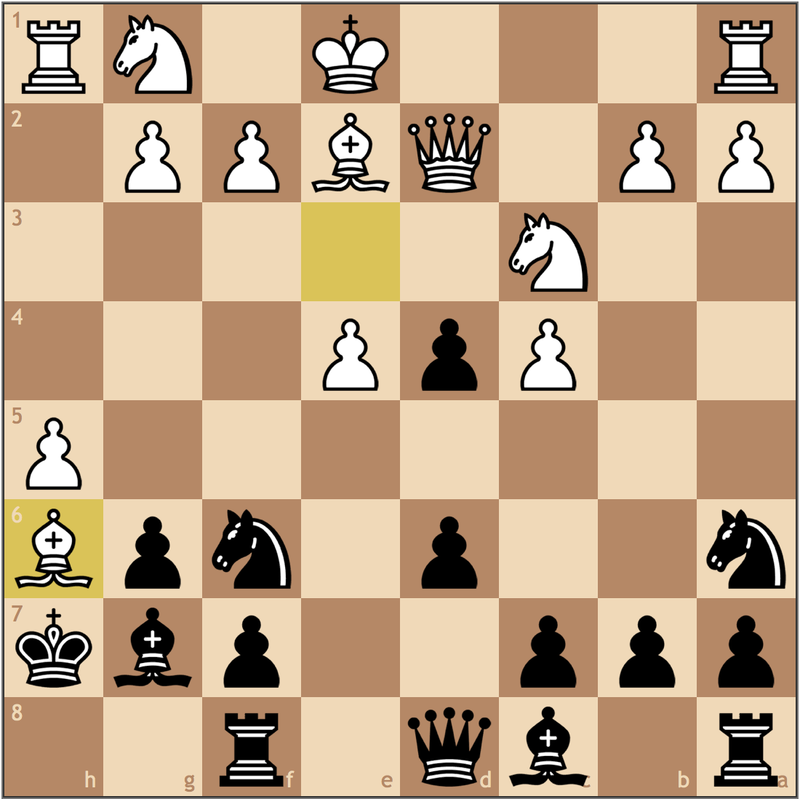 Black is winning, but a single mistake could be fatal. No surprises so far. 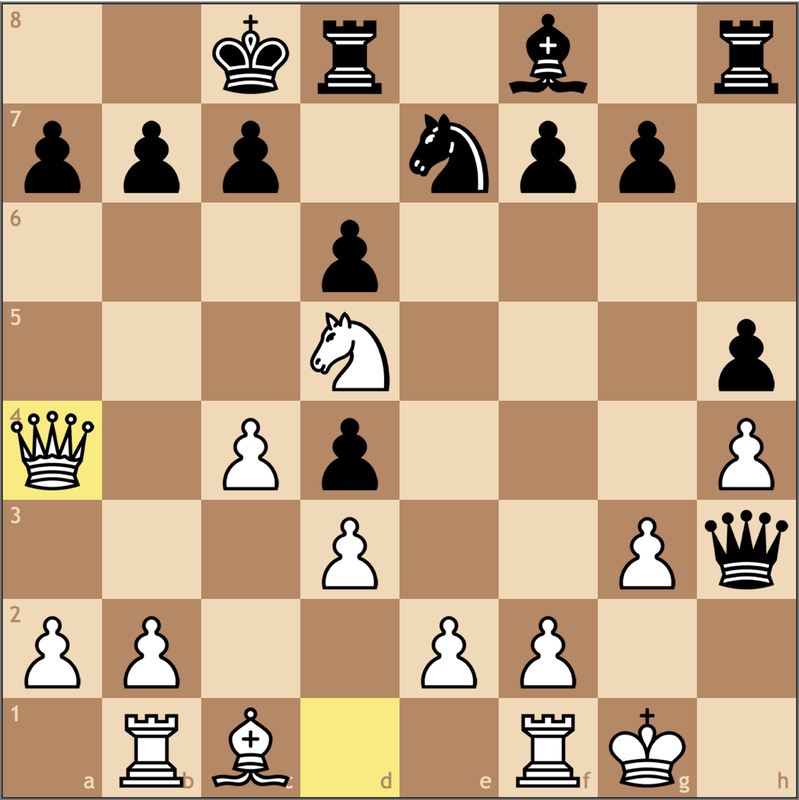 The way I understood the position was that White simply didn’t have entry squares on the h-file, and without any other active forces, I have enough time to shore up my weaknesses and develop my pieces. 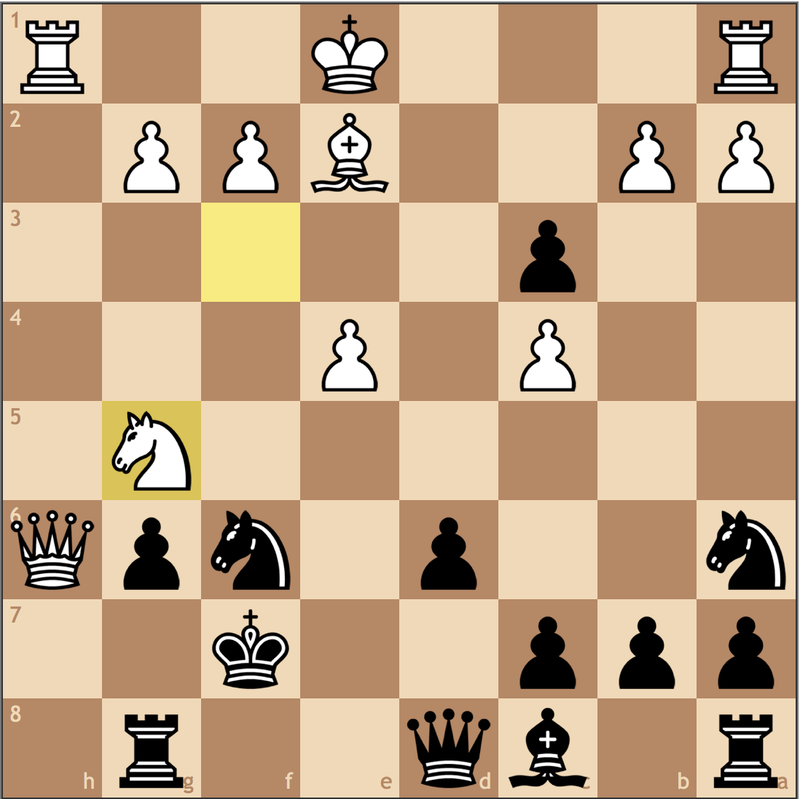 For Black I think merely pushing the game in a static direction is a valid threat and it’s White who must act quickly. I had seen up to here before going into this line. This move holds my only critical weakness, g6. 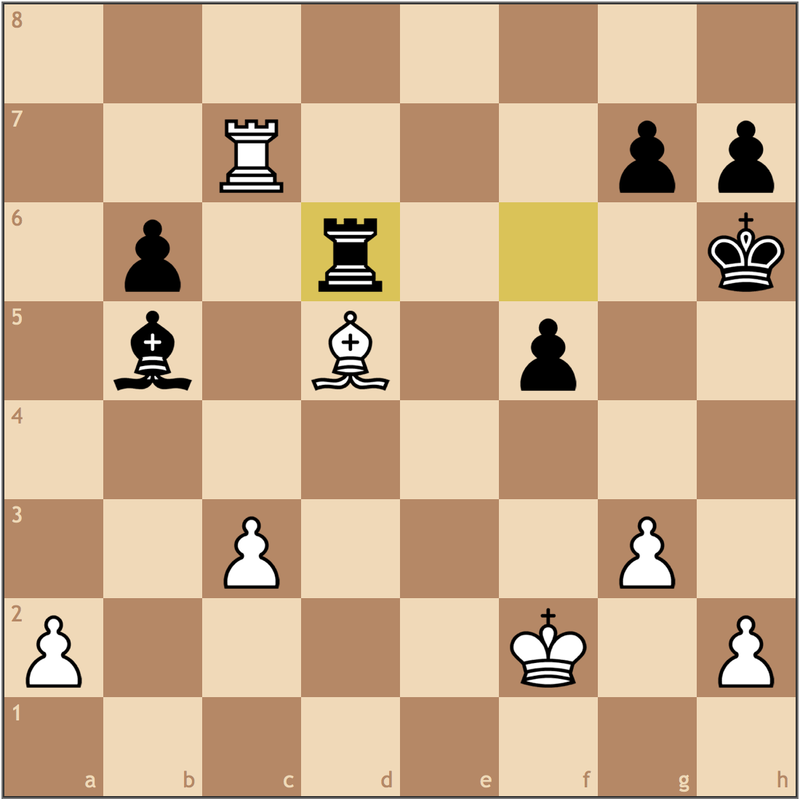 Once again, White is in do or die mode and ensured he would lose the game with his next move. The third and final “losing check” of the weekend. 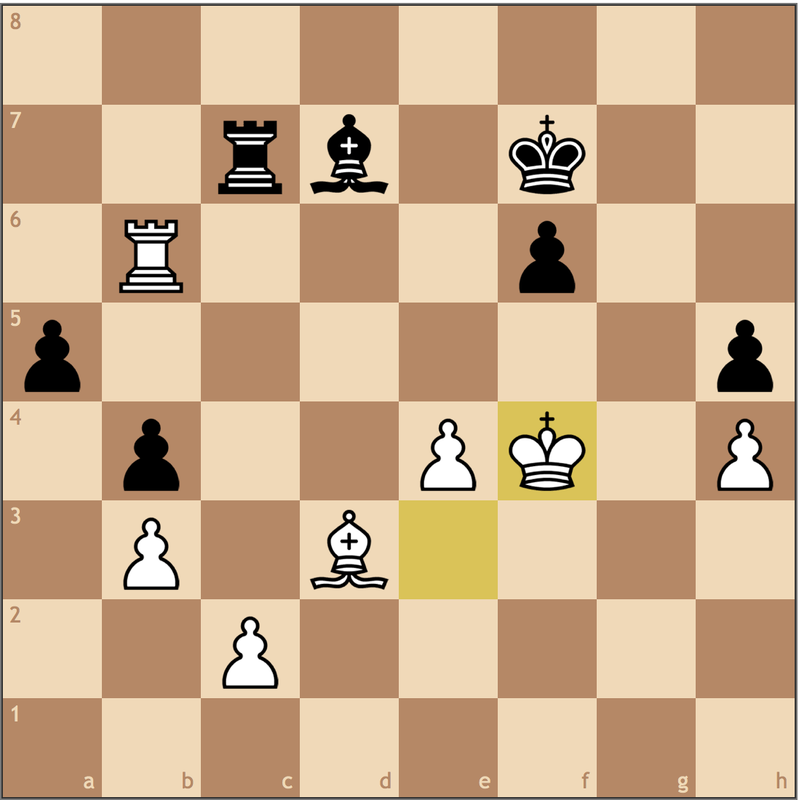 White cuts off his own queen from the game, and once my king reaches e8 will have no active options to pursue an attack. 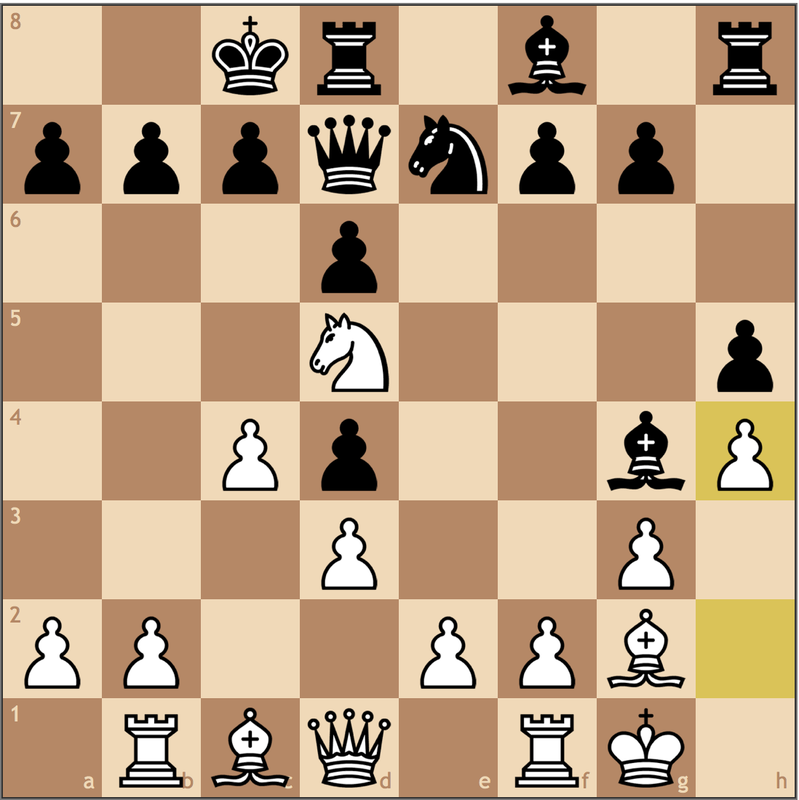 If White was serious about creating counterplay, he would have tried 16. 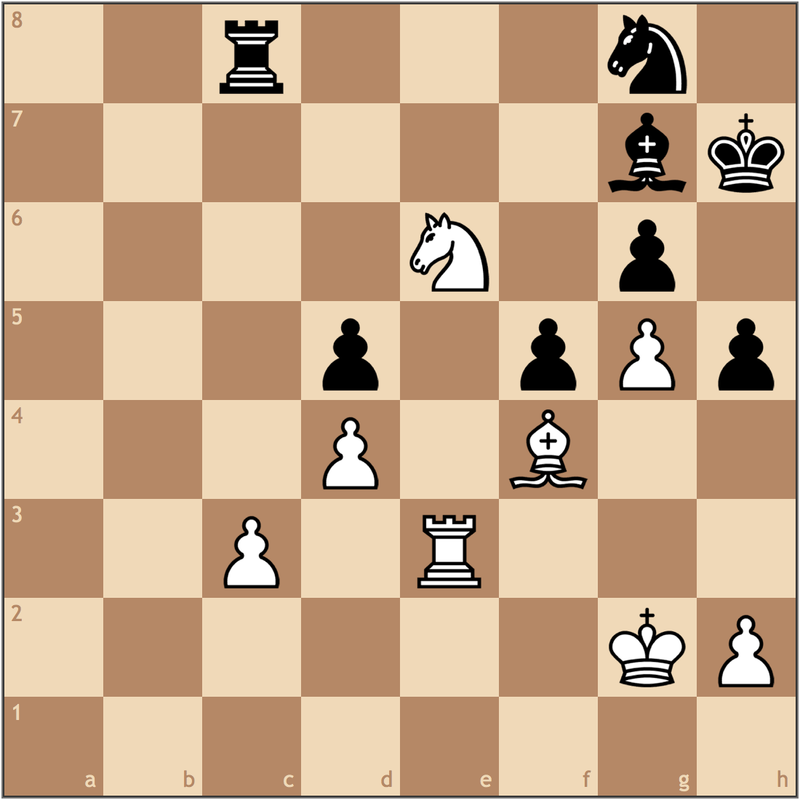 Qf4, with ideas of e4-e5 – but let’s not forget, White is still down a piece and Black is still winning. I really like this move as White has to move his rook off of the d-file, giving me more time to develop and start thinking about exploiting White’s king. 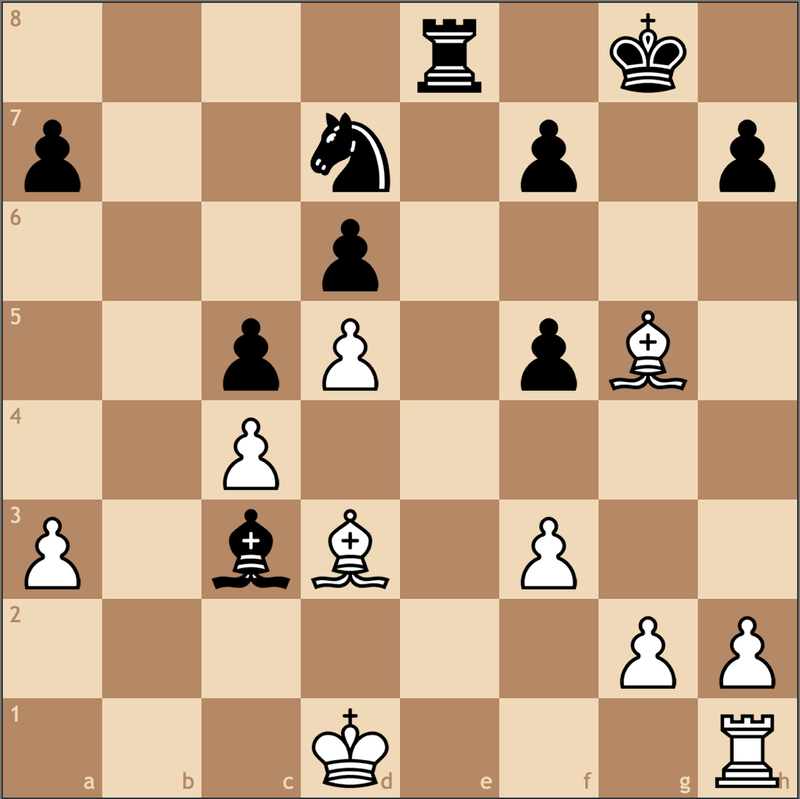 18.Rc1 Qe7 19.c5 Nxc5 20.Bc4 d5! The deciding move. I had looked at 20…. Nfxe4 21. 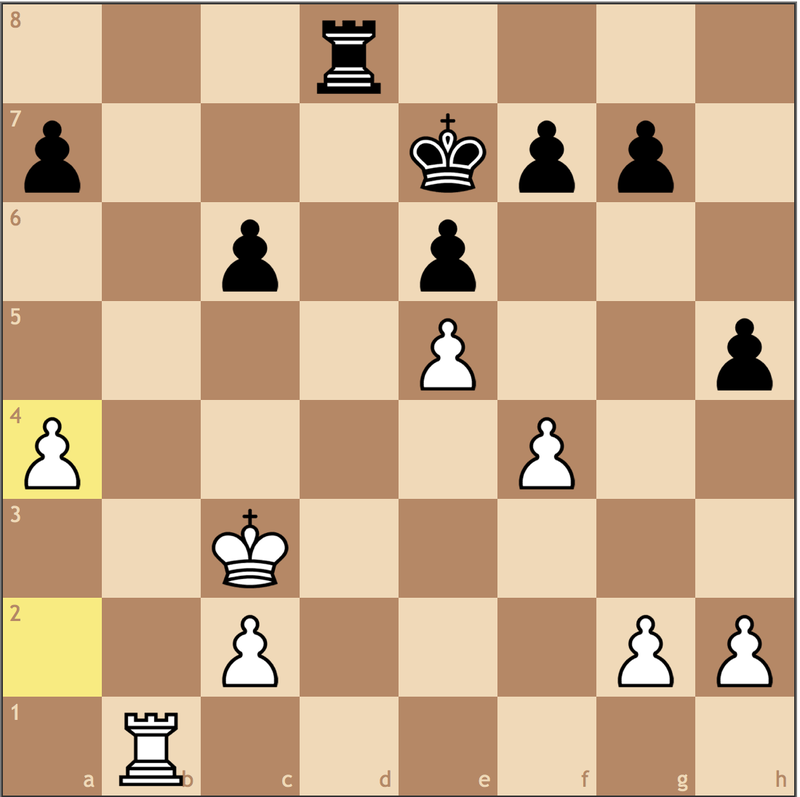 Bg8 Ng3+ with a win, but things get messy when White plays 21. 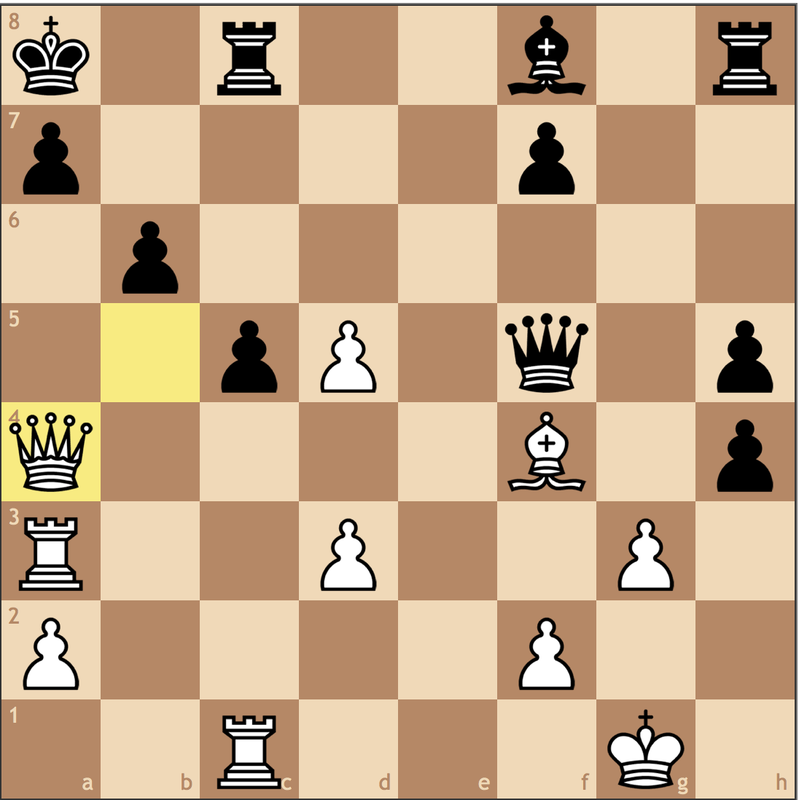 0-0!, and my king is once again under fire on e8. 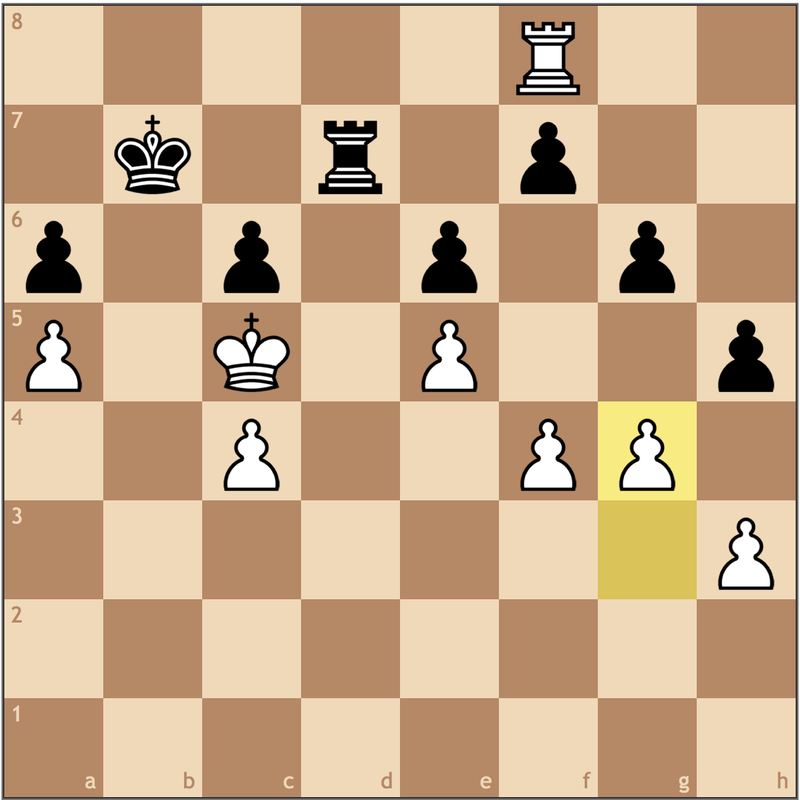 20… Be6 was possible, but I think White has accomplished something after 21. Nxe6 Nxe6 22. Qh3 and now my king has to go to f7 or d7 which are quite awkward since both would willingly walk into a pin. 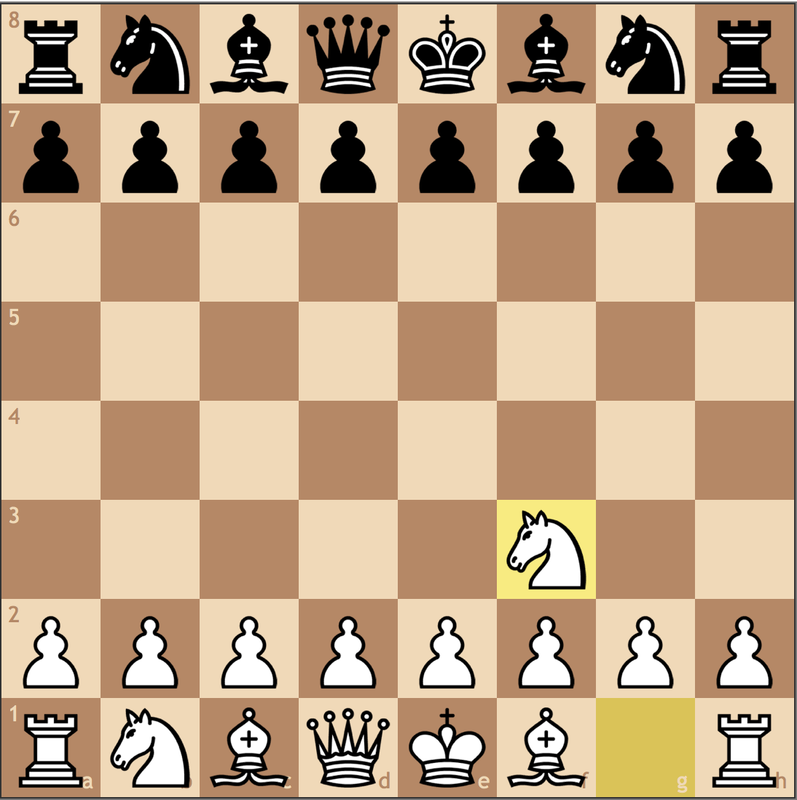 The key to this position is to make sure that White’s king doesn’t have time to leave the center. Once the e-file opens, whoever’s king is the weakest will lose the game, probably regardless of material. But at this point, I saw that the follow-up was forced. The obvious move as Black wins more material. 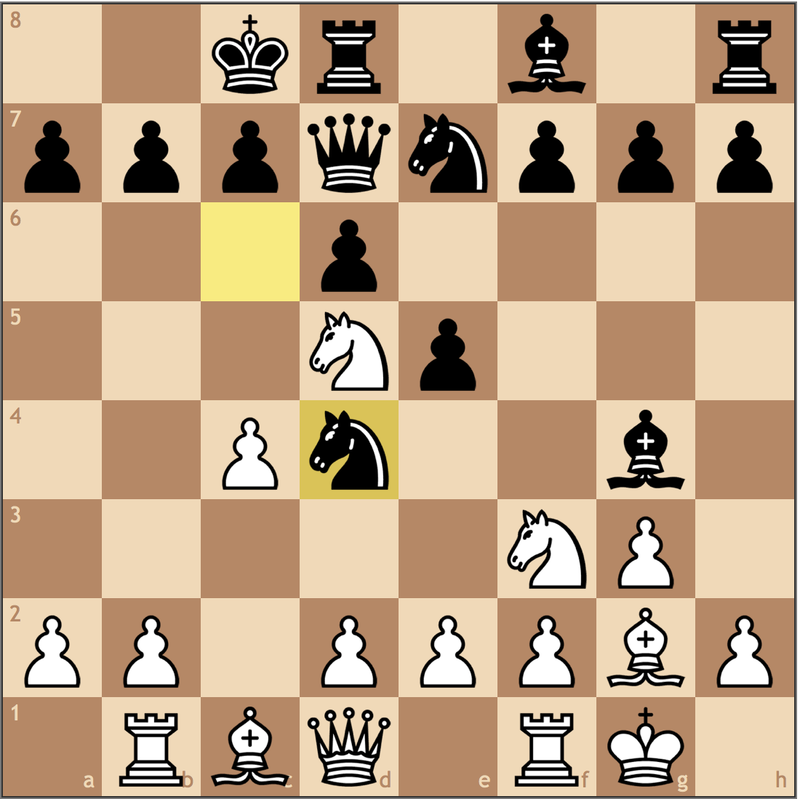 Perhaps 21… dxc5 was possible, but why allow White’s king to get out of the center and centralize his rooks? Always look for the most practical solution in a winning position. Winning a bishop. 22. Re1 is met by 22… Qxe1+ 23. 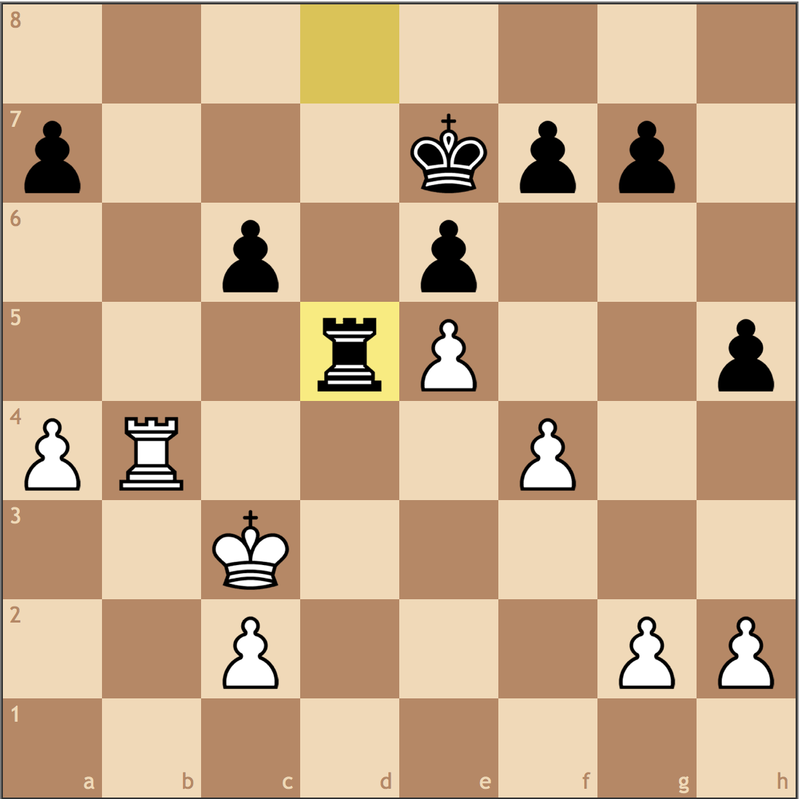 Kxe1 c1Q+ and White has lost rook in addition to already being down two pieces. The game lasts two more moves. And my opponent resigned here. A confidence booster for me here as the win meant I could play for first and continue playing 2100+ rated competition. Granted, my opponent gave me this game just as much as I won it, but I still had to defend adequately to get the point. 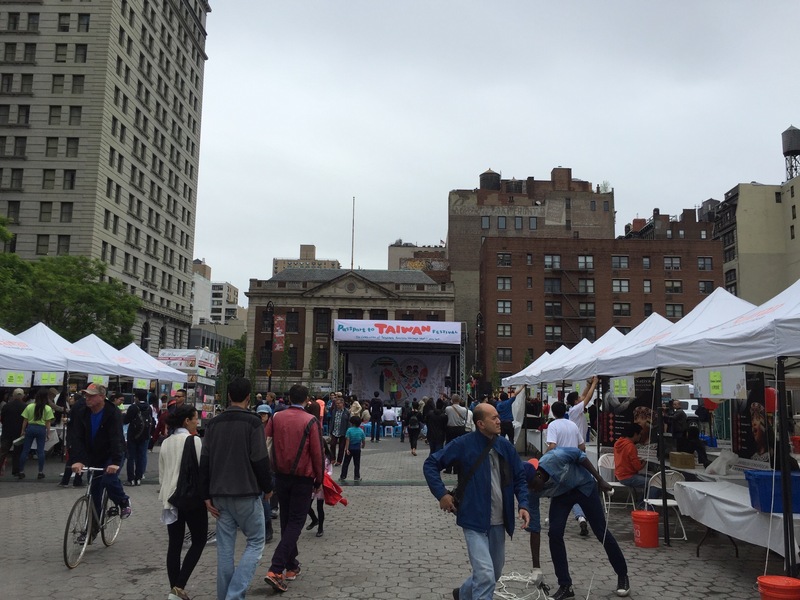 An early Round 4 finish gave me time to stop by a Taiwanese Festival before grabbing lunch. I won the game in less than two hours, which gave me plenty of time to explore and relax before the big finale. Thanks to my loss in round 2, I was still a half-point behind the tournament leader, and needed him to draw or lose to have a chance to win the tournament. 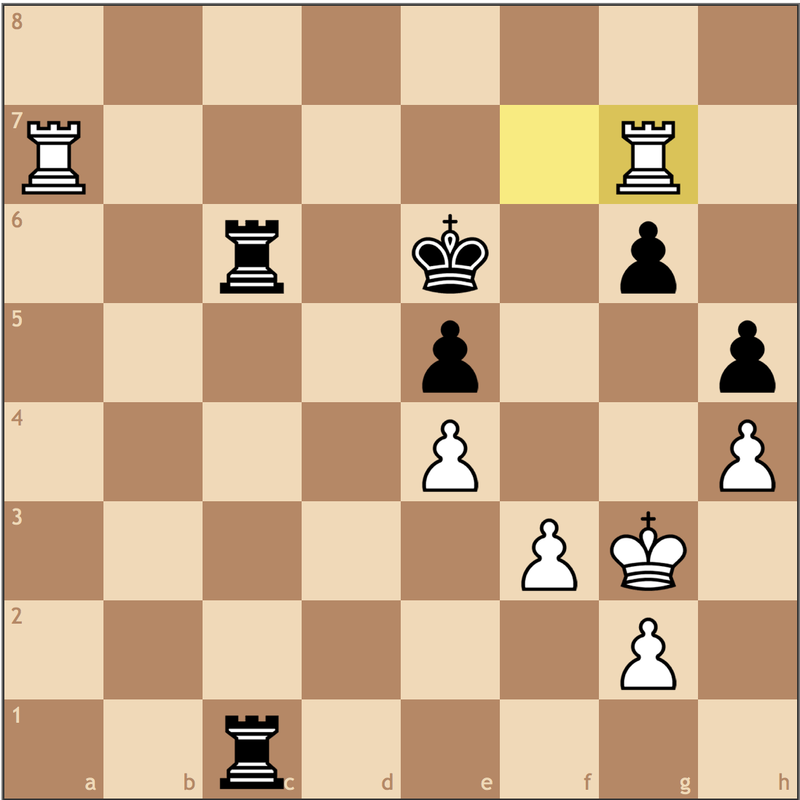 Luck came once more on my side, as he drew quickly, playing too quickly to convert an extra pawn in a minor piece endgame. 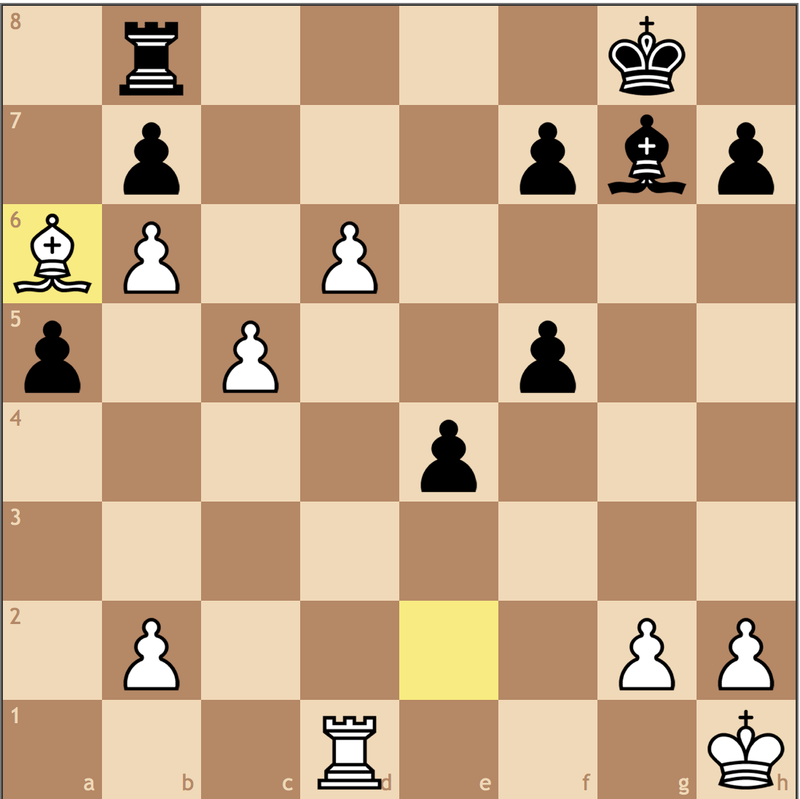 That left my opponent and I on board 2 with a chance to tie for first with a decisive result. 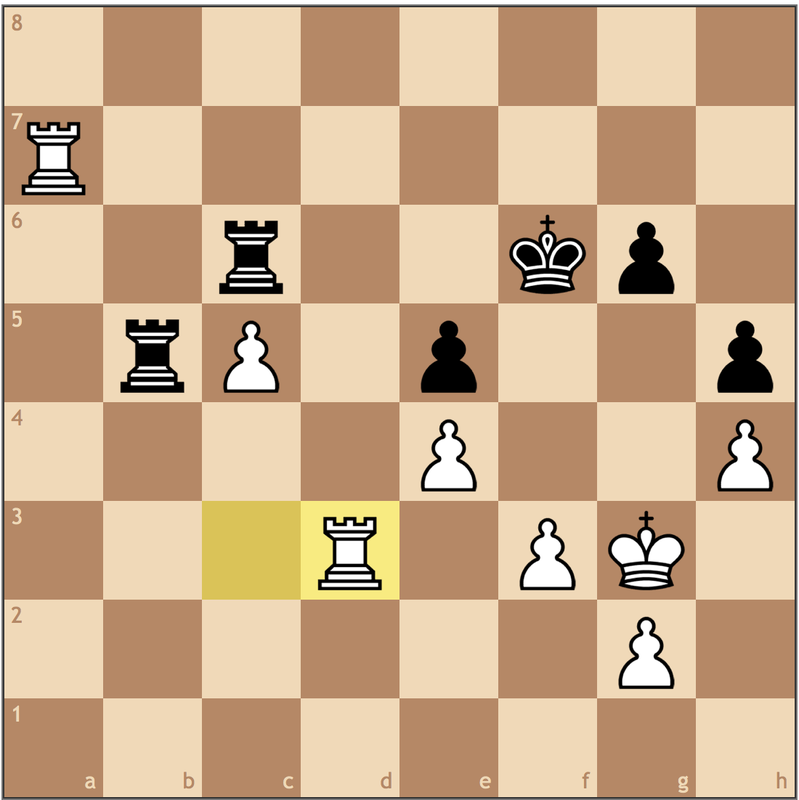 Thanks to my surplus of Blacks in the tournament, I was given White against a FIDE Master who had just drawn Grandmaster Aleksandr Lenderman last week. The game started out slowly with a small nod in my favor, but in just three moves the balance took a massive swing and my opponent was left behind in the dust. I’ve never really seen this move before, even in the Mega Database among strong players. The bishop is a little awkward on g4 since it can always be hit by h2-h3, and it’s clearly telegraphing the idea of trading light square bishops in the future. The more natural square is e6, targeting a d6-d5 break while also maintaining the idea of eventually creating a battery and playing …Be6-h3. 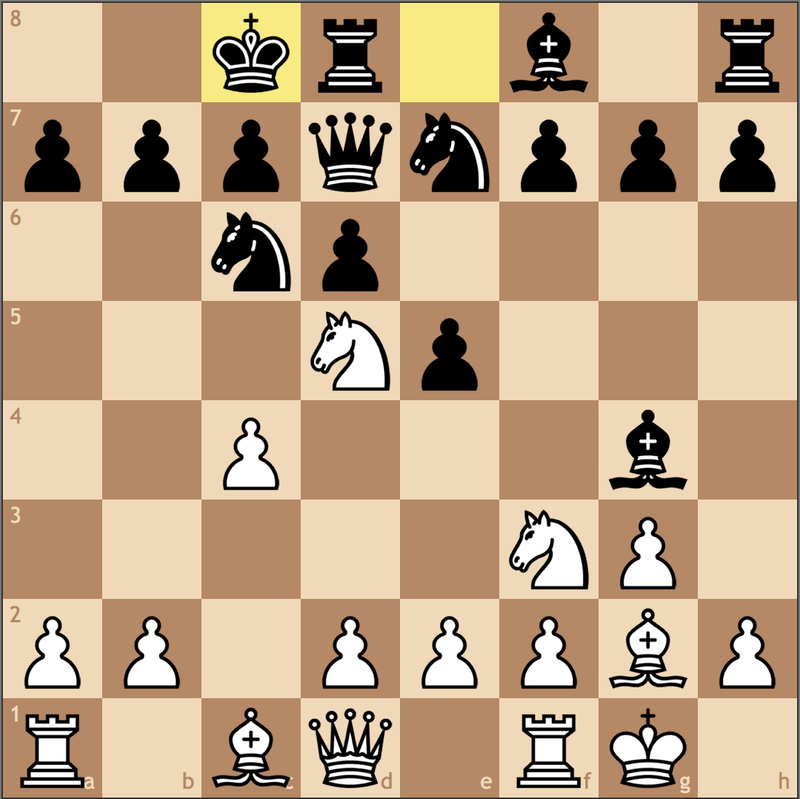 Moving the same piece twice in the opening may be a sin to some, but here I think it’s particularly useful, stopping Black’s knight from reaching f6, and eyeing c7 in the case that Black play …Bg4-h3. I was extremely happy to see this move since I think White is more prepared to launch a pawn storm on the queenside than Black is on the kingside. 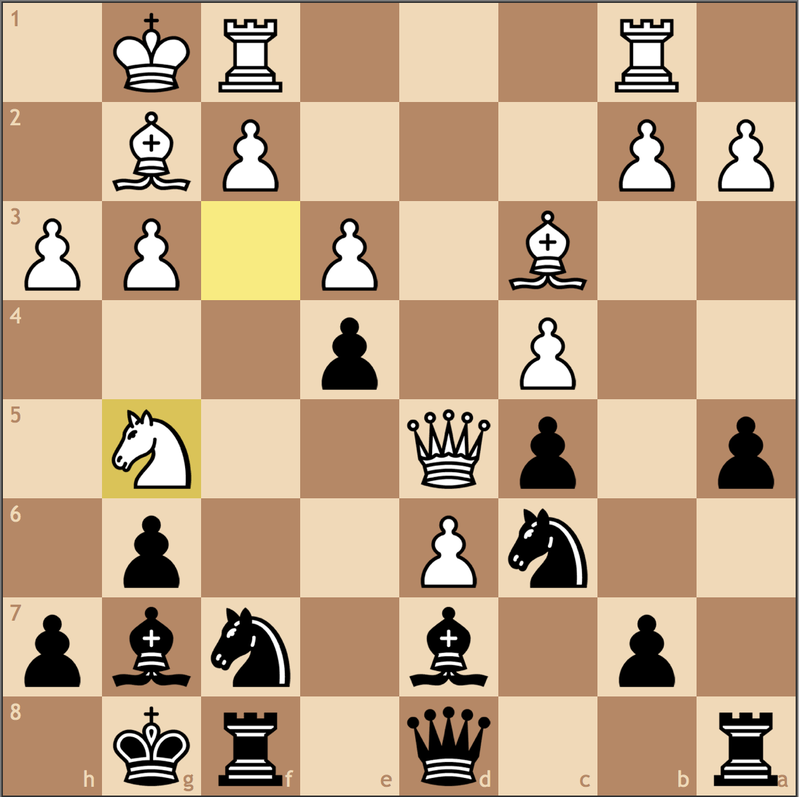 By being on the queenside, Black potentially commits himself to playing moves like …Kc8-b8 to avoid creating weaknesses. This is a loss of time, and in a race position, might not be so trivial. That being said, I totally understand the approach from Black. Already board 1 was moving to a draw, so my opponent wanted to quickly create attacking chances to win the tournament. 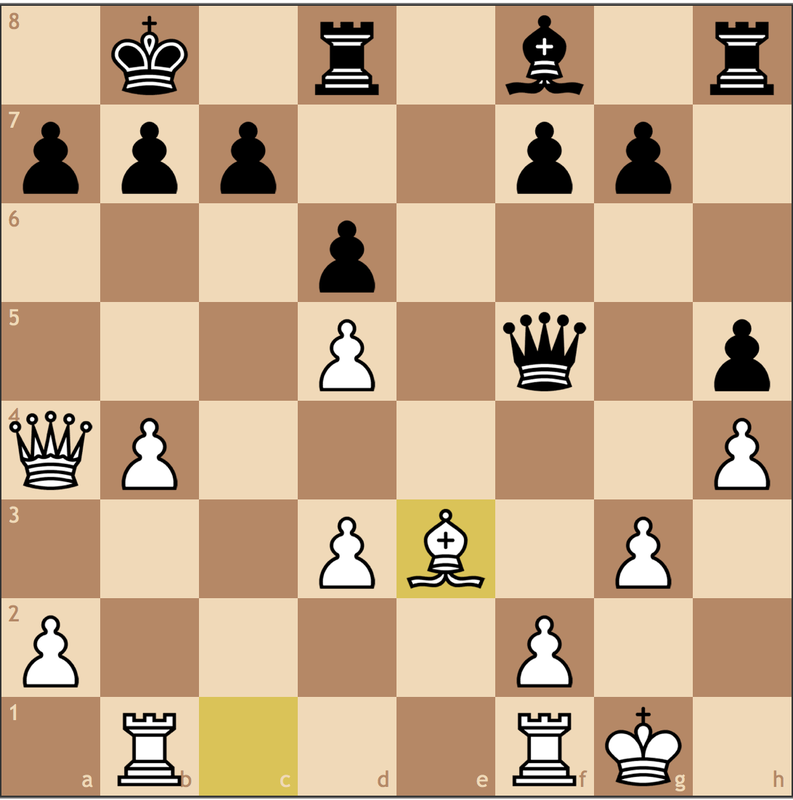 Instinctively, I didn’t like this move, but it’s not so easy to demonstrate over the board. Up to this point, I had gained about a 30 minute advantage, so I used most of it here to find the best way to continue. 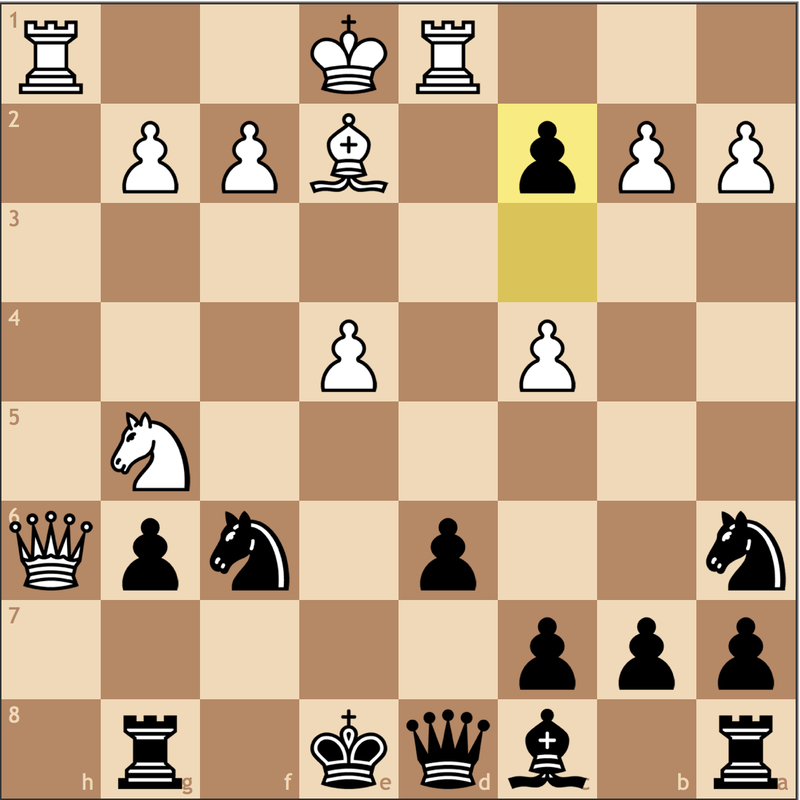 If we think about it, Black would love a line like …Bxf3 followed exf3 since that would make d4 a permanent outpost for Black. 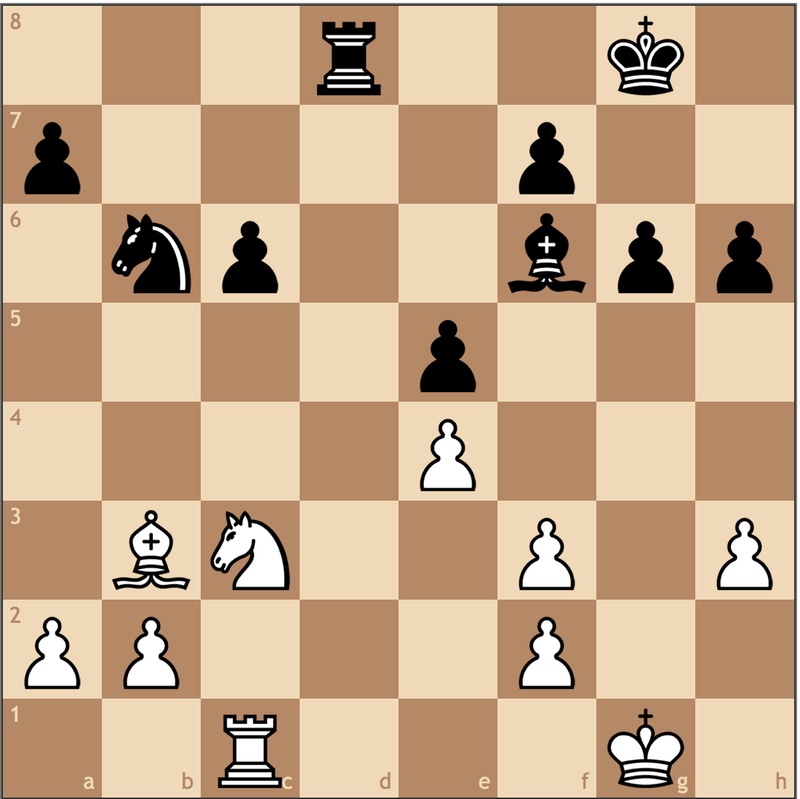 Another issue for me is that I always have to consider the zwischenzug …Ne7xd5, doubling my pawns. 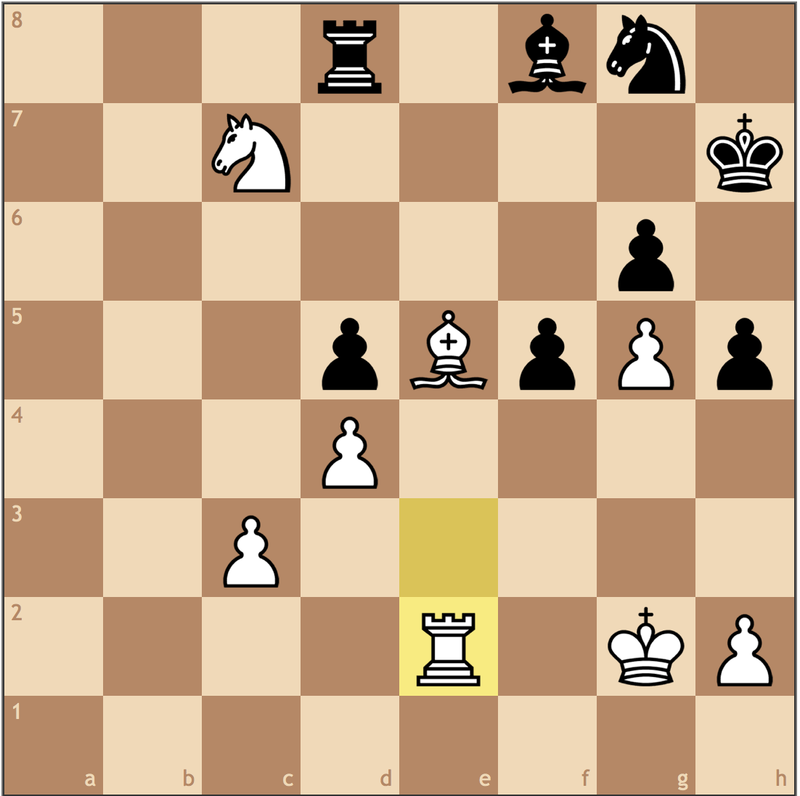 Many times, this can be a strategic advantage for White, but if I’m not careful, it can be a positional weakness. 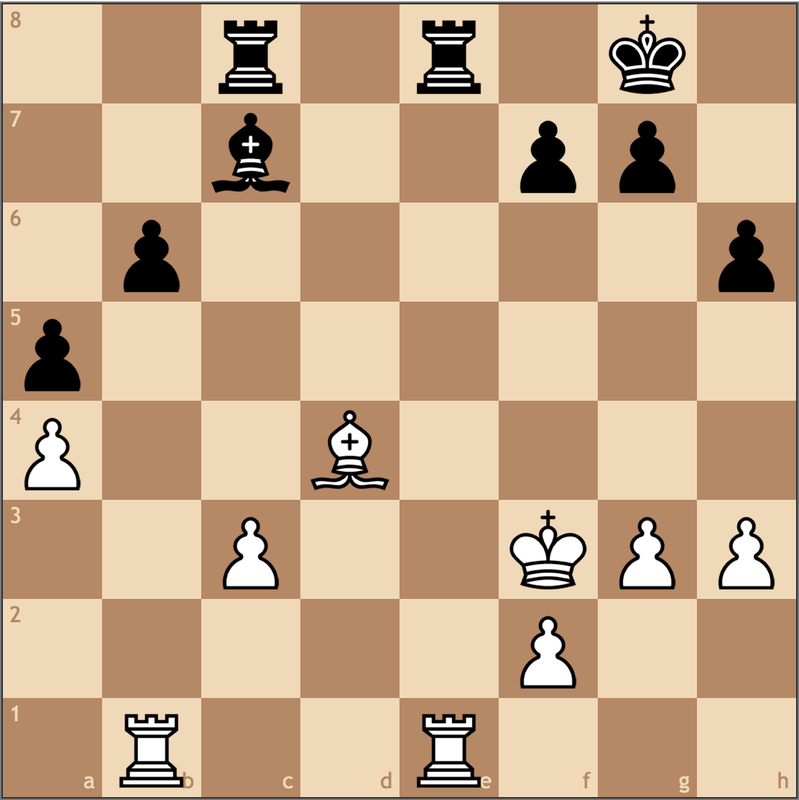 For example, a line I considered was 9. e3 Nxd5 10. cxd5 e4 11. exd4 Qb5! =+, where the tripled pawns prove difficult to hold. 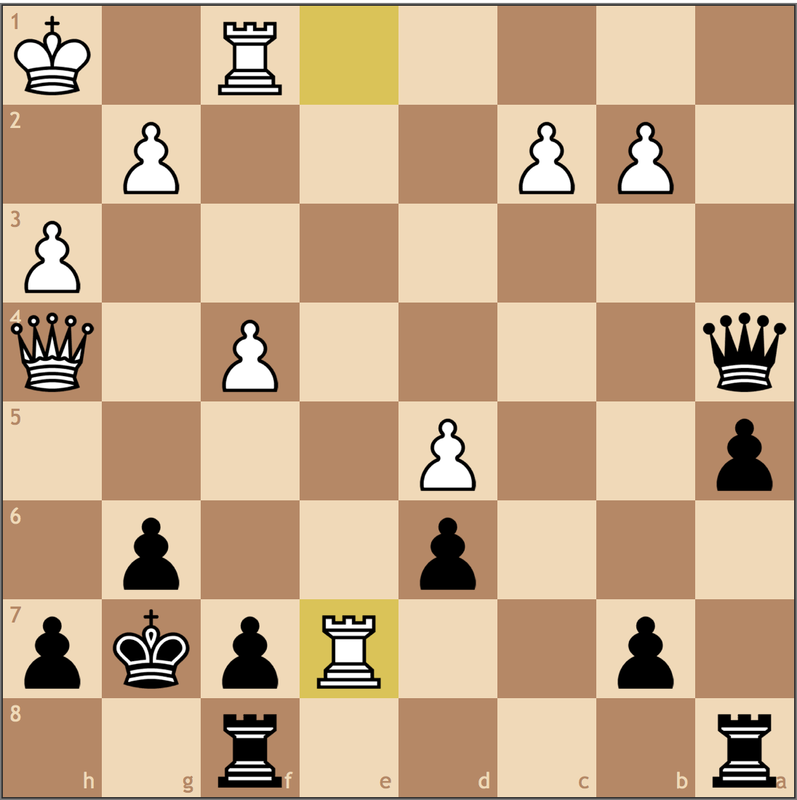 After the game, my opponent had said he had missed this variation, but I think it’s great Black. In a position where it’s unclear what to do, sometimes it’s important to stick to Occam’s Razor, where the simplest solution can be the best one. I originally wasn’t thrilled about 9. 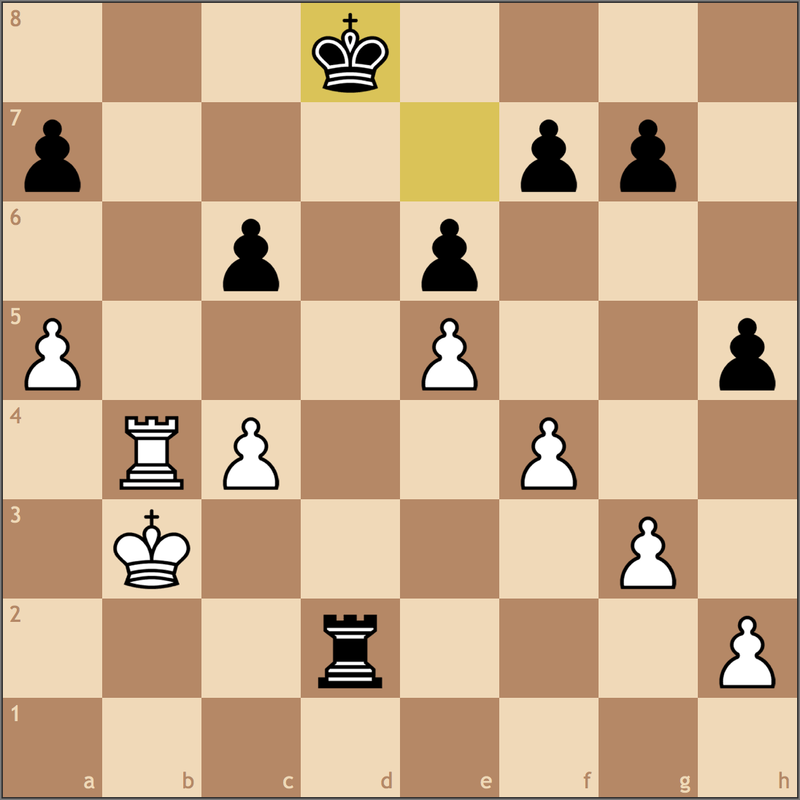 Nxd4 since e2 becomes a target for Black, but after some time, I realized this was my best option. Sure, Black can try to take on e2, but in a race position, it won’t matter if I’m going for his king. 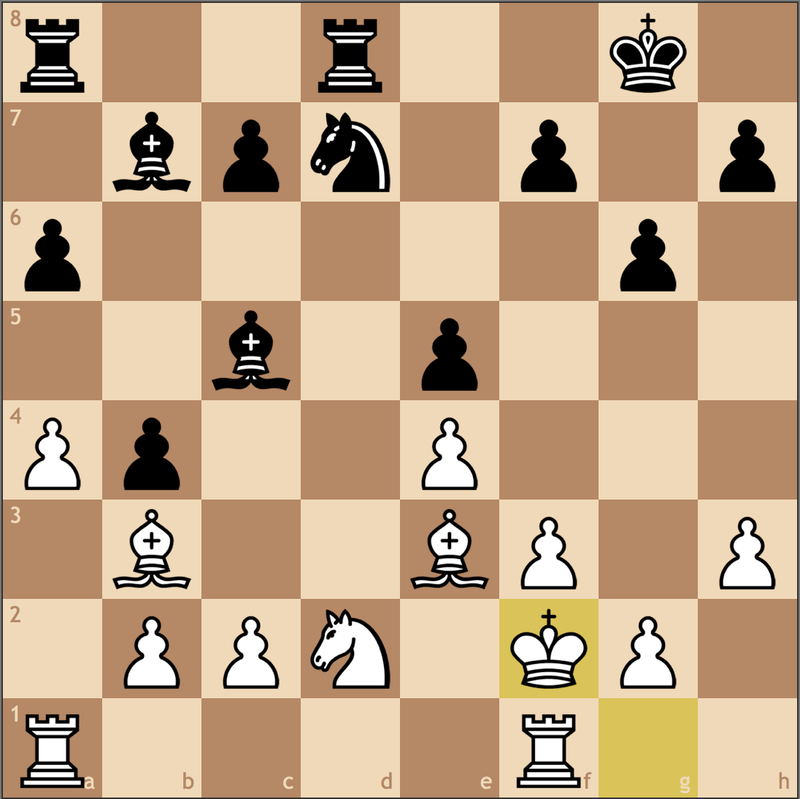 Another concrete problem for Black is that it isn’t clear how his bishop is escaping f8 to an active position with a pawn on d4. My opponent thought this didn’t matter too much at this point, but I think it does need to be considered. Setting up the “wavebreaker” we’ve discussed before. I wasn’t too sure how Black was going to attack from here. 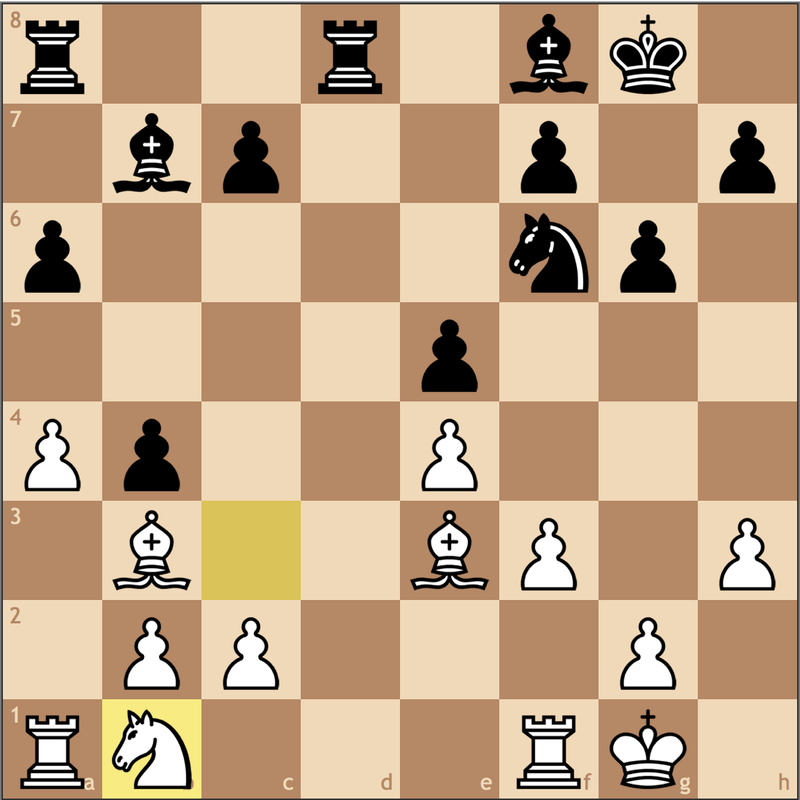 I thought a positional approach would be to bring the f8 bishop to h6 and trade dark squared bishops, but to do this, he must move the g-pawn, which would allow Nd5-f6. So to execute this idea in full, Black must take the knight on d5, which would open the c-file for my rook – most definitely good for me. My thought on this position was that I was perhaps slightly better, but there was still a game to play here for both sides. Nothing special yet, but I wanted to ask Black to prove his point. Once he plays 13… Kb8, I get a free tempo to finally start pushing my queenside armada. In our game analysis, my opponent and I agreed that this was the root of his problems. 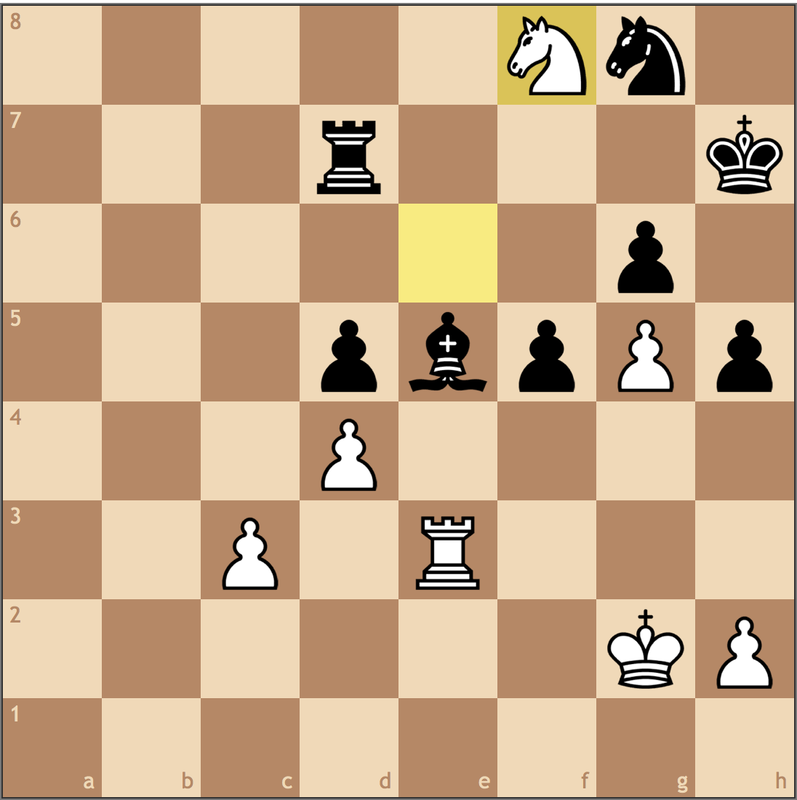 In this position, I get to open the c-file, but more importantly, Black has no threats! As the game shows, it’s not so easy to continue from here. 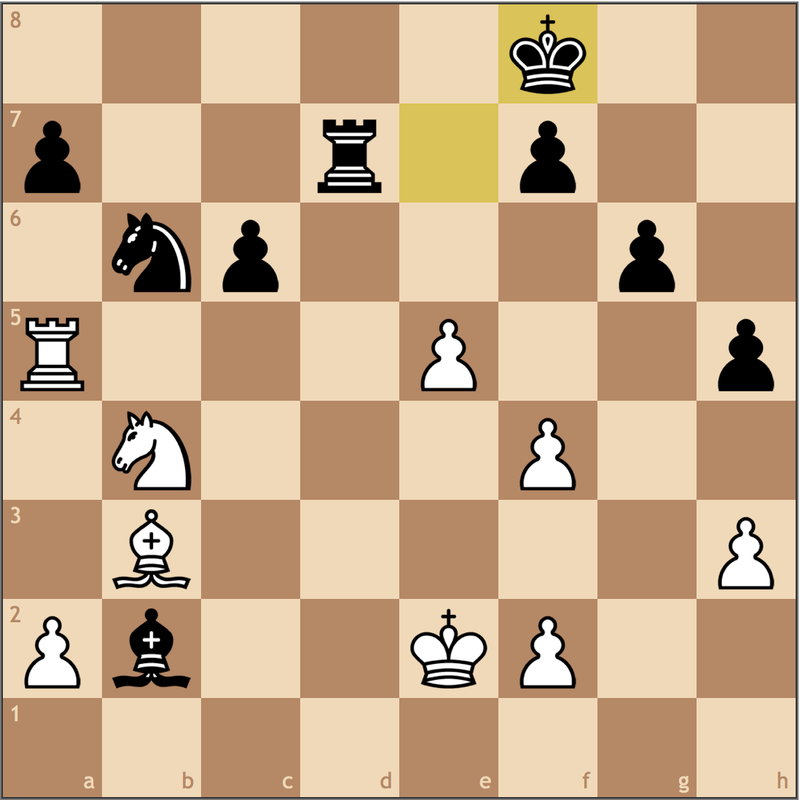 Black’s best chance is to play 14… Nf5, where he immediately threatens to make a perpetual by taking on g3 or h4. Up to this point I didn’t think I was significantly ahead, but after these knights were swapped, I was very optimistic. My opponent underestimated this move and now is faced with an uncomfortable decision. He can move the queen, at which point, he will no longer be able to access the queenside with it, or he can open the position, allowing my bishop to develop with tempo. 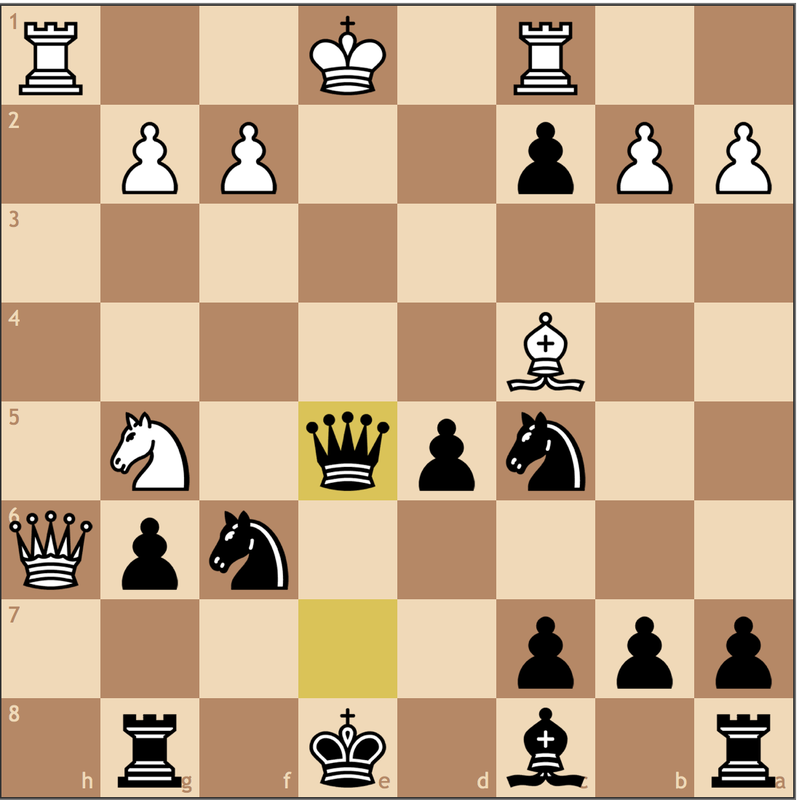 Personally, I thought Black would have been better off leaving the center untouched, as now, not only do I develop with tempo, Black must now make a concession on the queenside. It was this part of the game where I got to test my tactics. Trying to stay calm and not replicate an earlier failure, I got the job done with only a few forcing blows. Another forcing move. 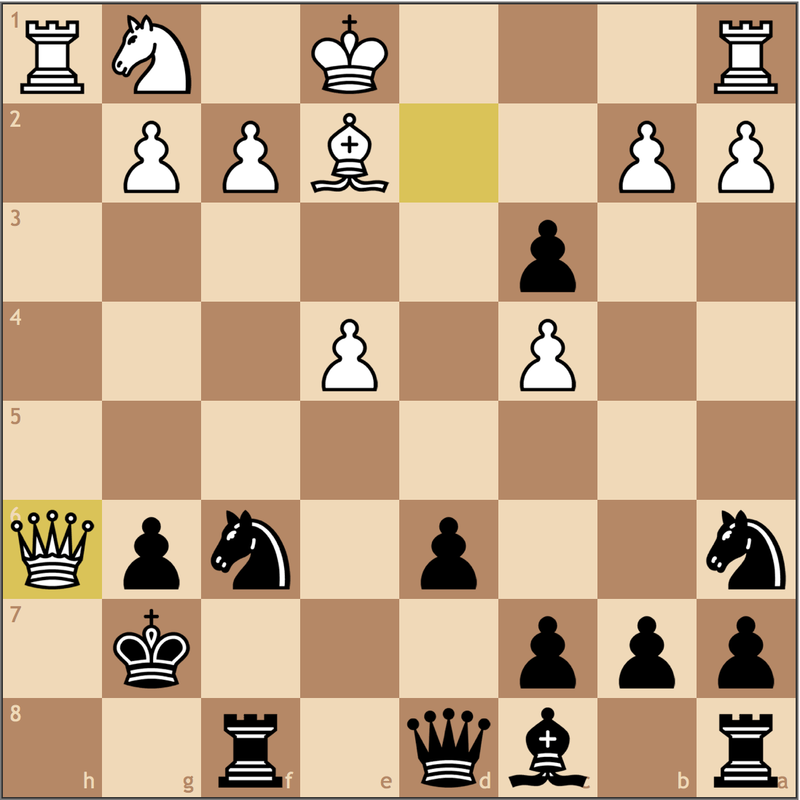 If Black were to ignore me and play 18…Qxd5?, I can win by force with 19. Rxc7! 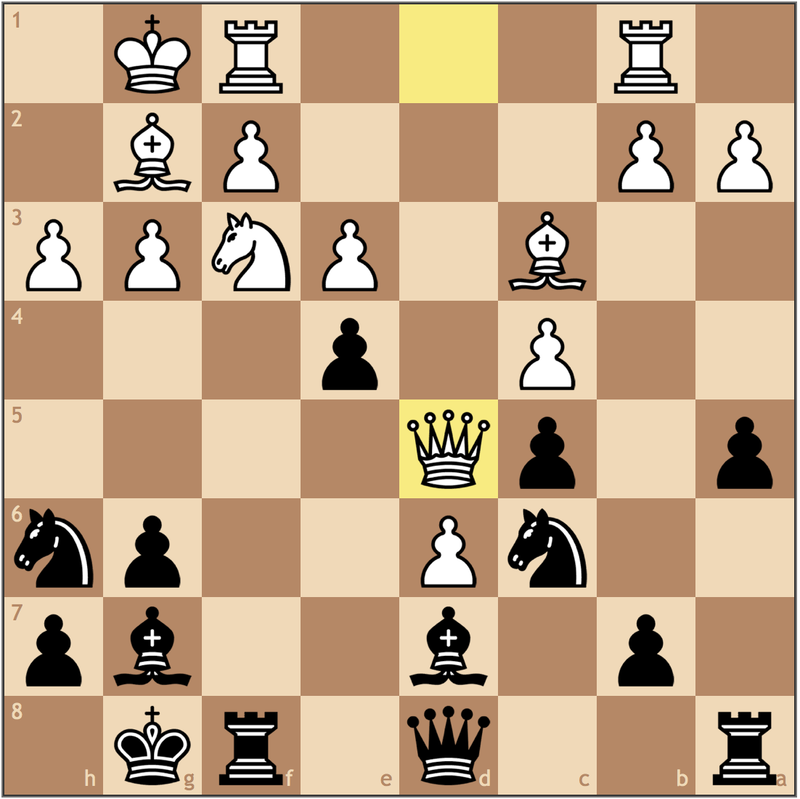 threatening mate on a7, so Black if recaptures with 18…Kxc7 19. Qxa7+ Qb7 20. Rc1+ and I win the queen on the next move. 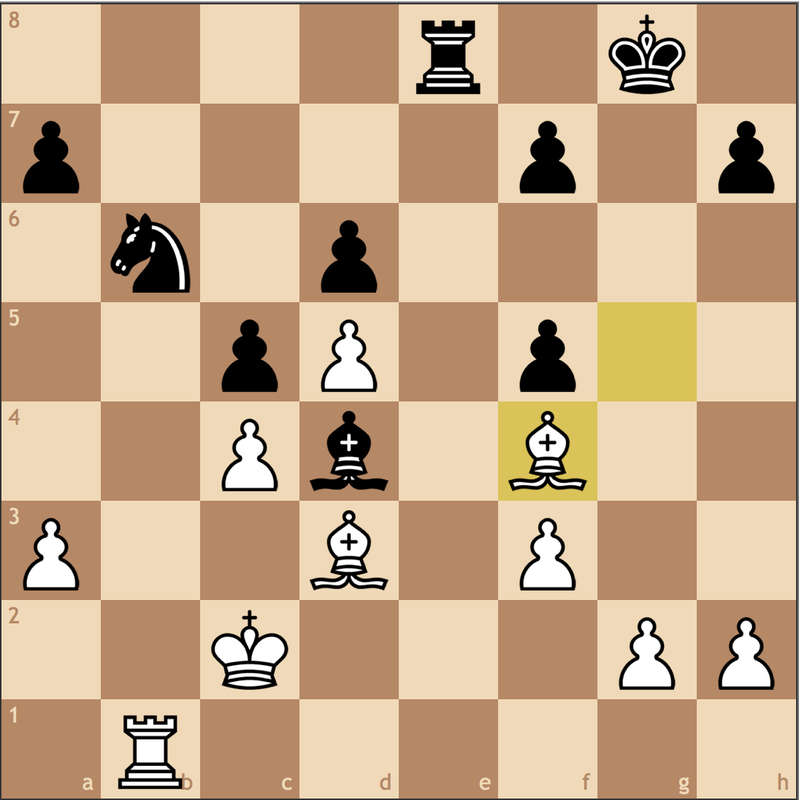 Black can try 18… Qa8, but after a move like 19. Rbc1, are you really going to tell me Black can hold reasonably? 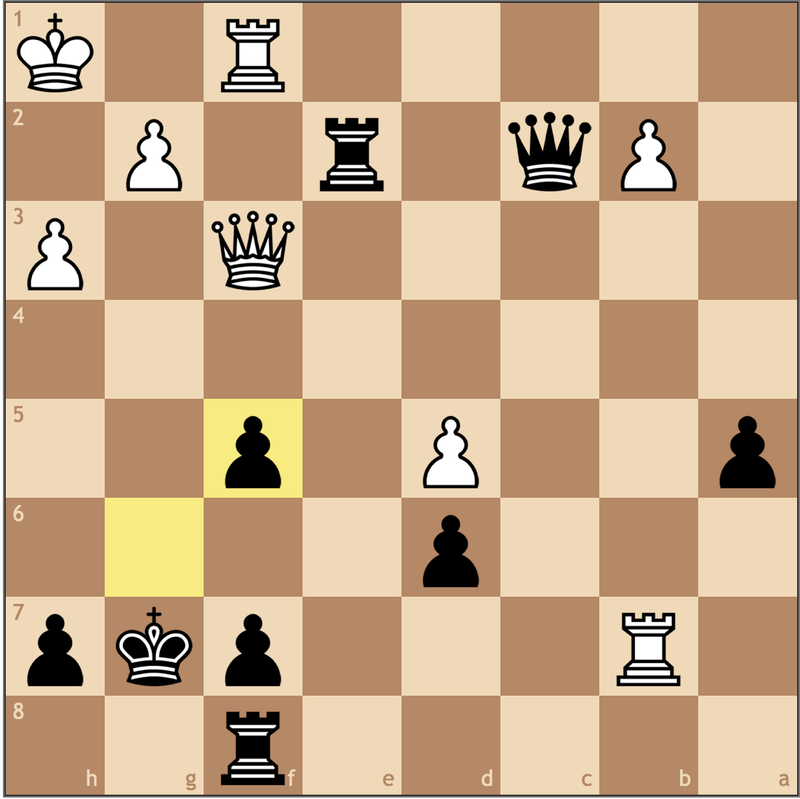 Simply ignoring Black’s non-existent kingside ploys. 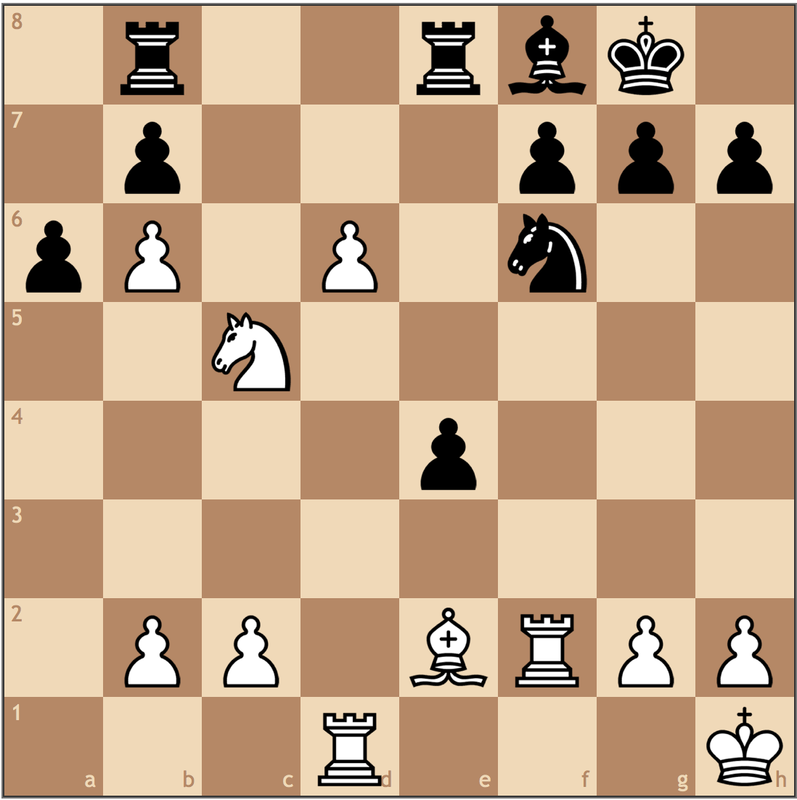 My idea is to play Rb3-a3 next move, preparing Qb5-a6 with mate. 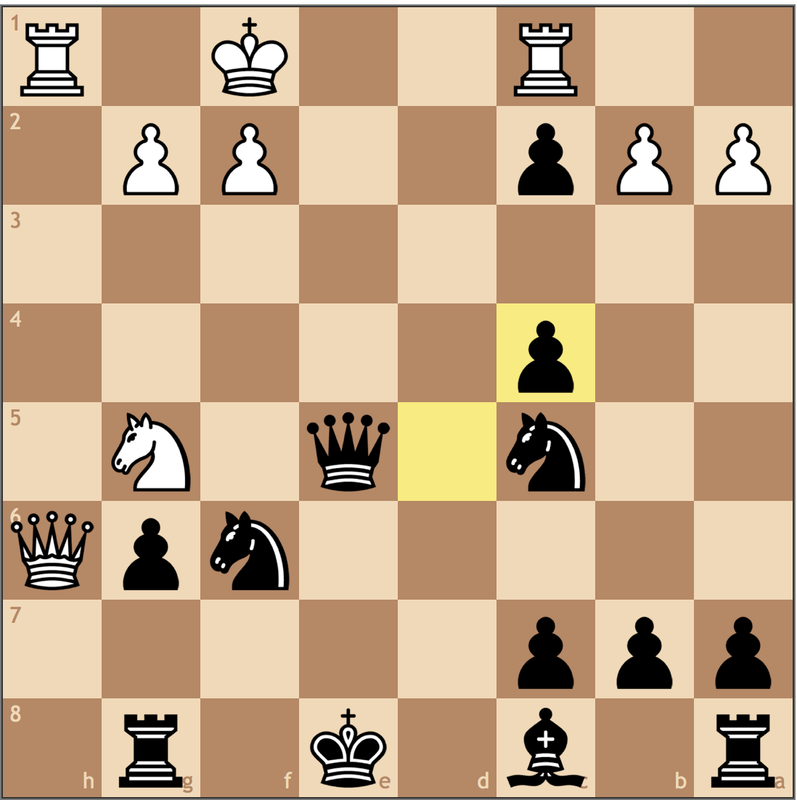 Black will have to open up his king with …c7-c5, and it won’t be pretty. And all lines are winning here. 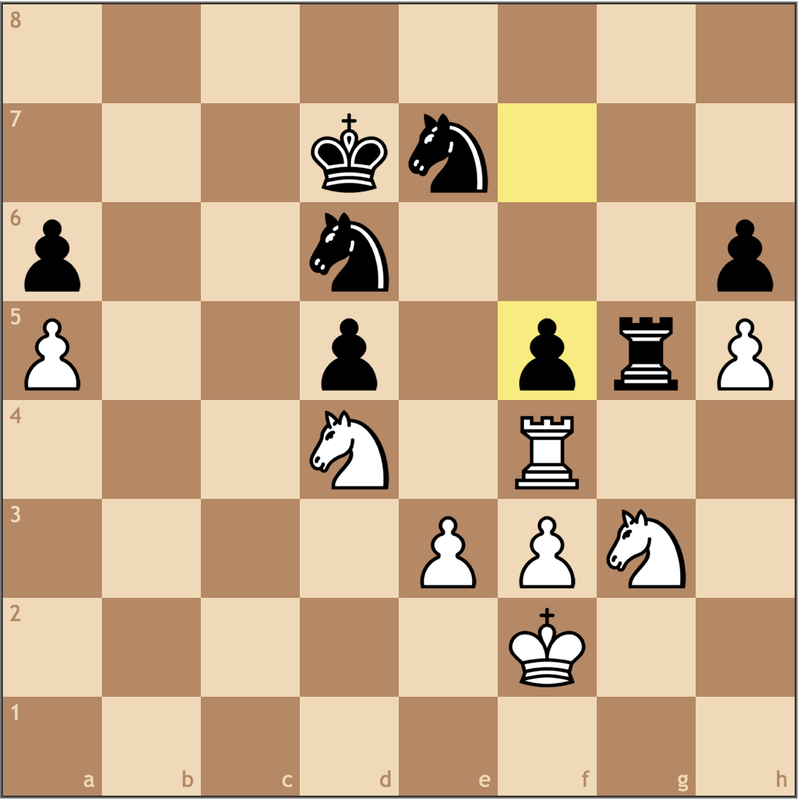 In the game, Black tried the least ambitious defense thanks to his time troubles, but after 22…Qxd5 23. Rxa7! Kxa7 24. Qxb6+ Ka8 25. Rc3 and Black’s fate is inevitable. 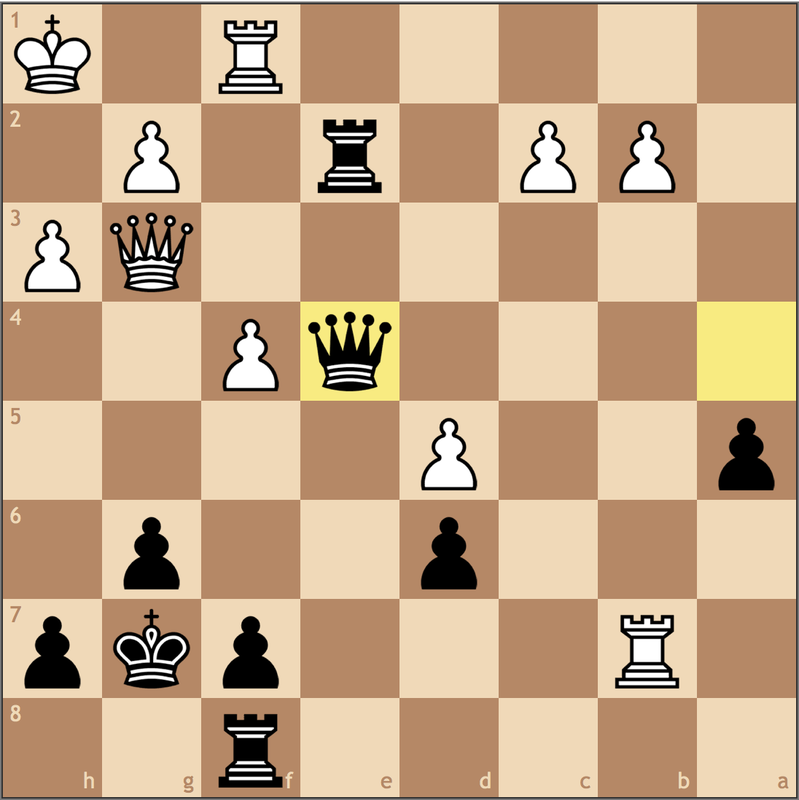 I thought Black would try 22… Rf7, but here too I saw that 23. Rxa7! is winning (not all the way till mate though) because 23… Rxa7 24. cxb6, and long story short, Black will not be able to cover all his weak light squares. Black resigns. If 25…bxa5 26. Rxa5+ Kb7 27. Rb1# and 25… Kb7 26. Qa7#. So that concludes my first ever adult tournament win! It took twelve and a half years to pull off, but to finally do it at the Marshall Chess Club of all places was extremely special. 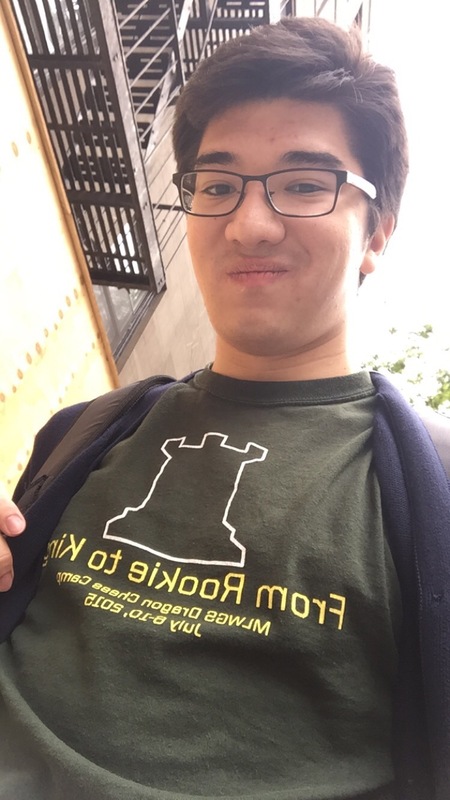 I’d like to take this moment to thank all of my supporters over at GoFundMe for helping make this trip possible, as well as all of you for following my various accomplishments here on Chess^Summit. Without your continued support, this trip would have never been possible! While this is a memorable moment for my career, I’ll have little time to relax. Next week is the Cherry Blossom Classic in DC, and the following week is the Carolinas Classic in Charlotte. Hard to believe that in less than one month I’ll be playing for the US Junior Open! For those of you who were formally introduced to chess like me, you may recall being taught the importance of the solidarity in pawn structures. The more fragmented a structure becomes, the more pawn islands are created. Since pawns are “stronger” together, it’s logical then to believe that each pawn island (or isolated pawn) created thus weakens the integrity of one side’s overall structure. This static consideration is so important that many coaches for beginners say that the side with fewer pawn islands can be considered better! While this grossly undervalues the power of dynamic play, this consideration can help steer the structurally better player in the right direction. In the case of endgames, understanding this principle is crucial, as a brittle structure offers various targets throughout the duration of the game. In our previous Endgame Essentials posts, we discussed how a weak king or a badly placed piece can single-handedly change a result. By simultaneously asking yourself how you can improve your position and stop the opponent’s counterplay, we can try to stretch out (or limit!) 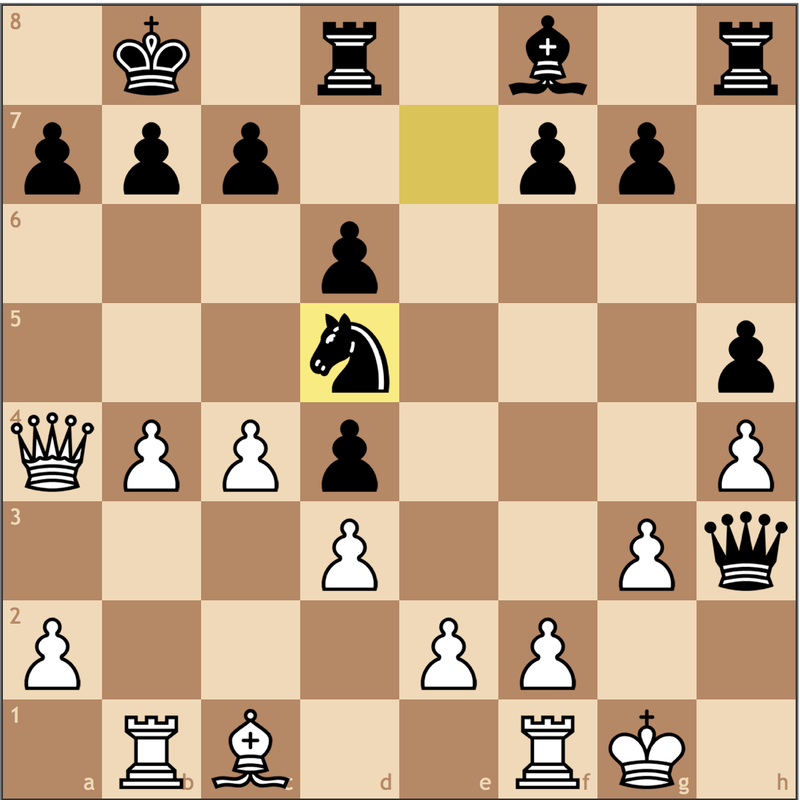 our opponent’s defensive resources by creating a passed pawn, or dominating an opponent’s piece. When taking structures into consideration, often times we don’t need to immediately create our own attacking resources because they are already provided for us. As we have with our past studies, we resume our travel through Magnus Carlsen’s career – resuming in 2009, and today reaching the year 2011. For our first endgame, Carlsen faces his future-soon-to-be-challenger, Sergey Karjakin. As we move through each exercise, I encourage you to continue asking yourself how Carlsen can improve his position. When playing against a weak structure, the duration of the plan will take longer, and usually a win is not simply obtained by tactical means like some of our previous examples. At a first glance, neither sides’ pieces are particularly impressive. Karjakin’s rook on d8 seems to stand strong on the d-file, but as we’ll see in a second, it actually has no entry square on the d-file that’s particularly useful. To get a better assessment of who’s better, we move to the theme of today’s lesson by comparing structures. In the purest definition of the word, each side has exactly three pawn islands. However, the value of each island is different. 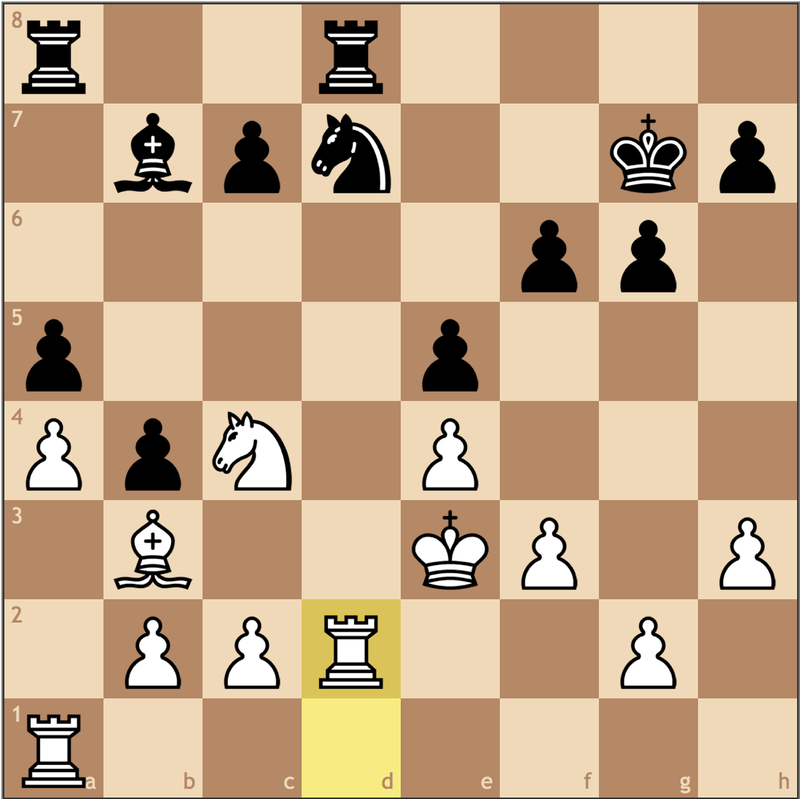 For example, visually, we can already see how the isolated c6 pawn is a lot weaker than White’s on h3. 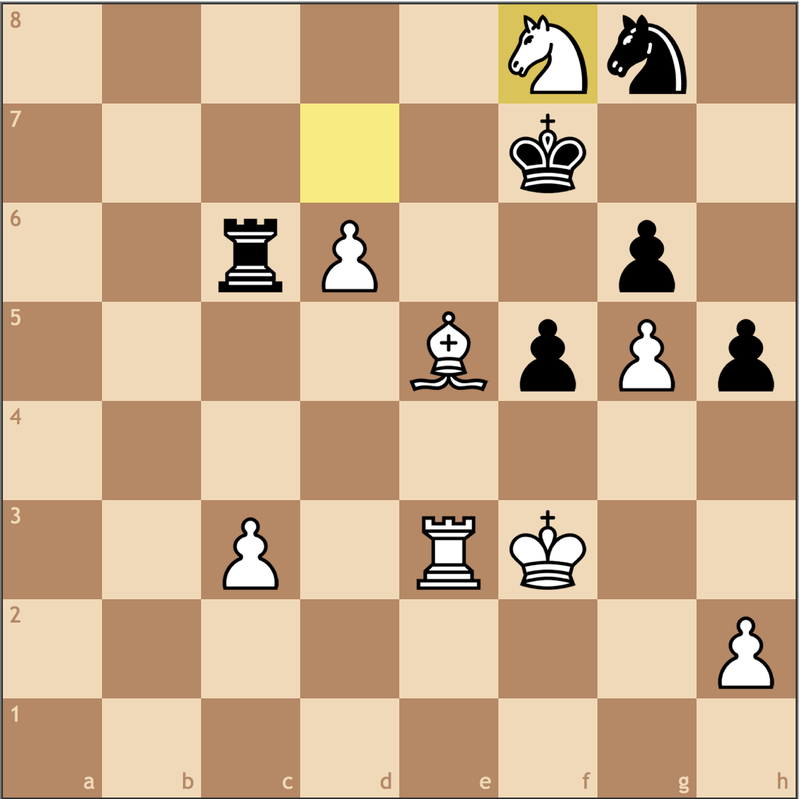 By being on a half-open file, Black’s c-pawn can present him with immediate problems. 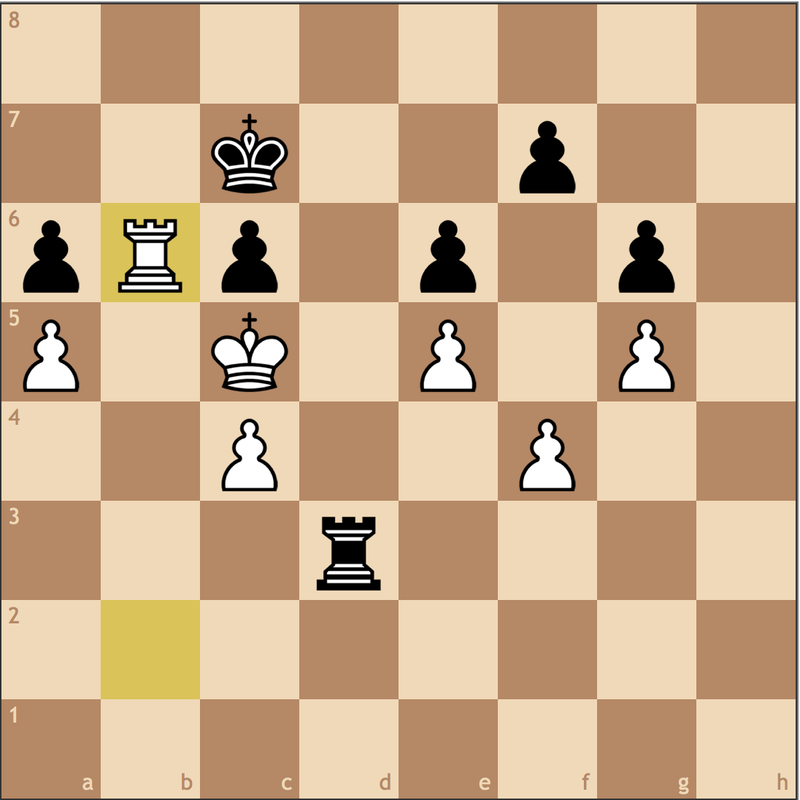 Furthermore, I think something needs to be said of Black’s e5 pawn. While at a basic level it belongs to the same pawn island as the f-, g-, and h- pawns, supporting it with another pawn would actually be a concession for Karjakin. 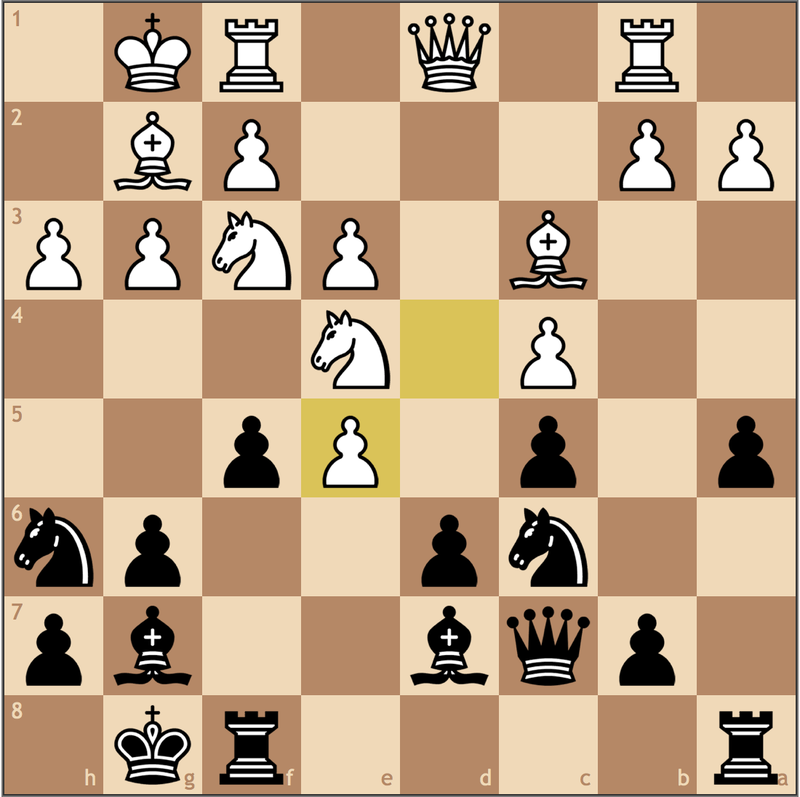 Already, the pawn on e5 limits the scope of Black’s dark-squared bishop. 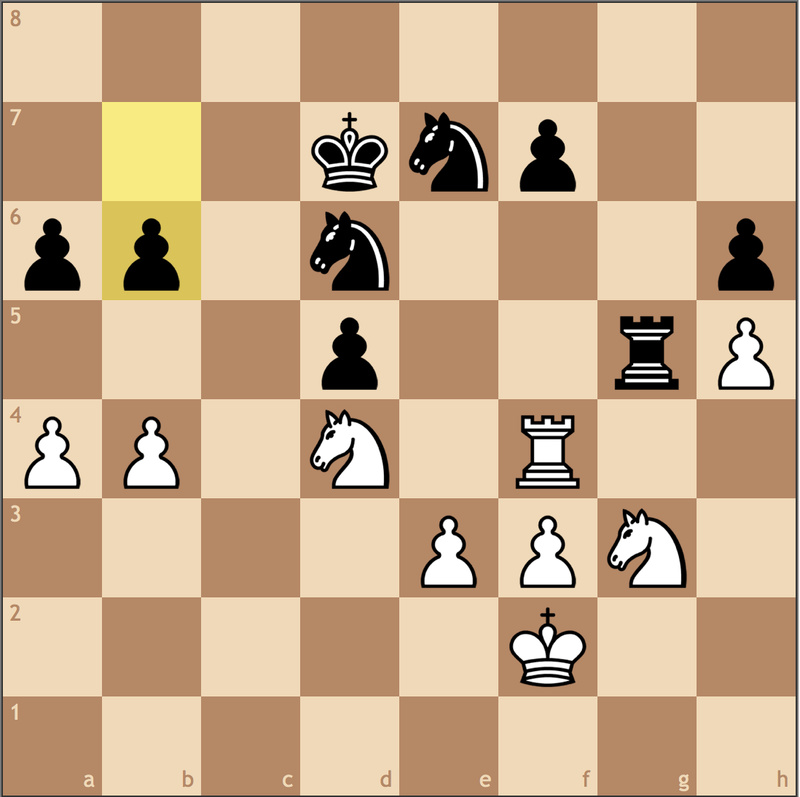 Should Black ever play …f7-f6, he limits the bishop even more, while White’s opposite colored bishop improves. 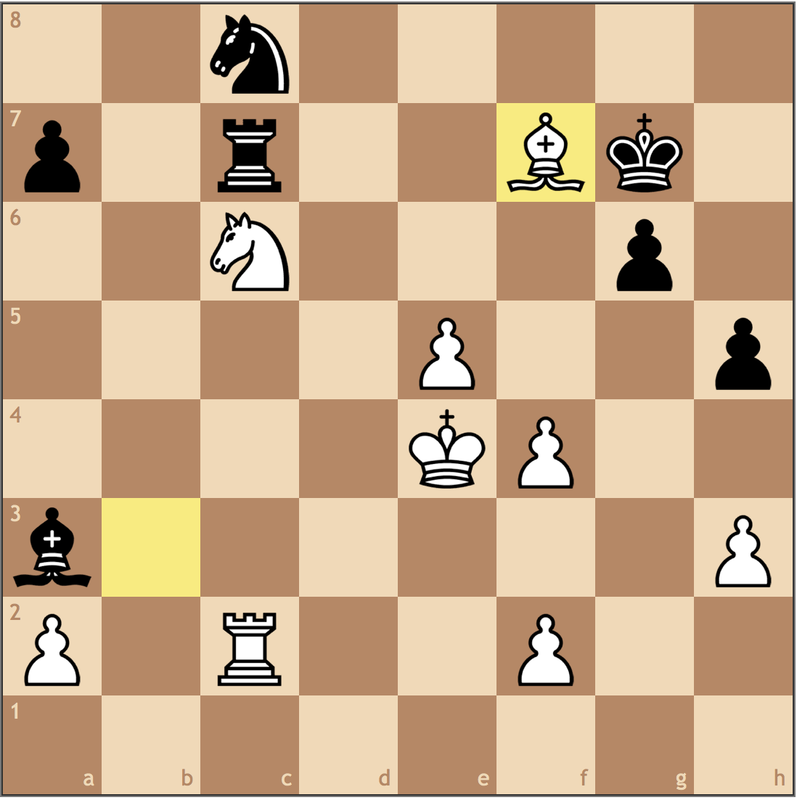 Both sides have tried to improve the position, but White’s done a better job of addressing Black’s weaknesses. 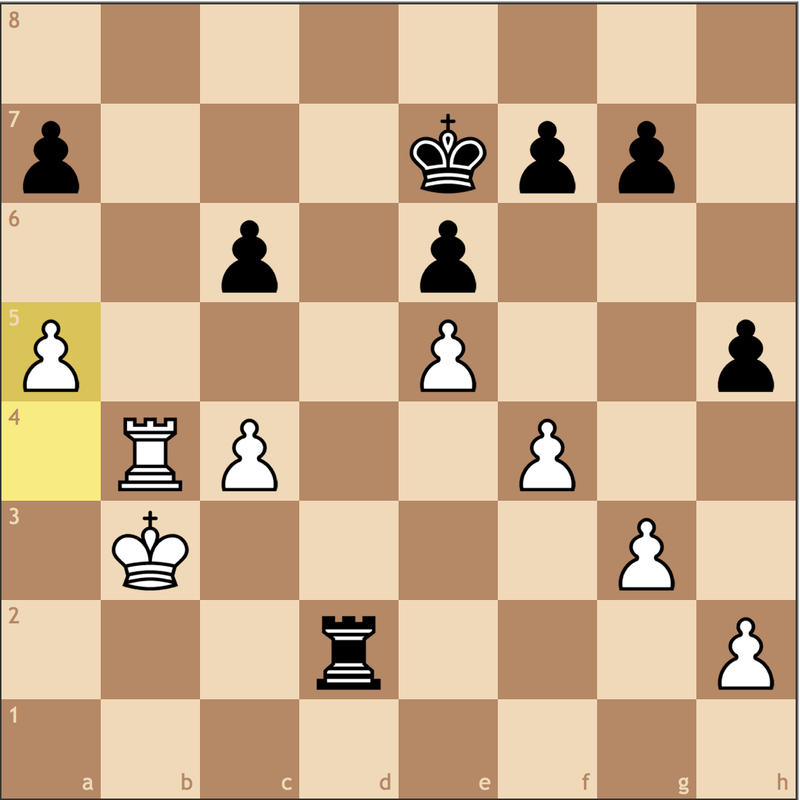 From c5, Carlsen’s rook hits both the c6 and e5 pawns. Without a clear improvement, White spends this move asking himself “what’s my worst piece?” and finds that the knight on e3 has limited mobility despite its centralization. With 26. Nc2 Carlsen makes a move he’ll have to make anyway to reactivate the knight while waiting on Karjakin to find improvements 26…Bh6 27. Ra5! 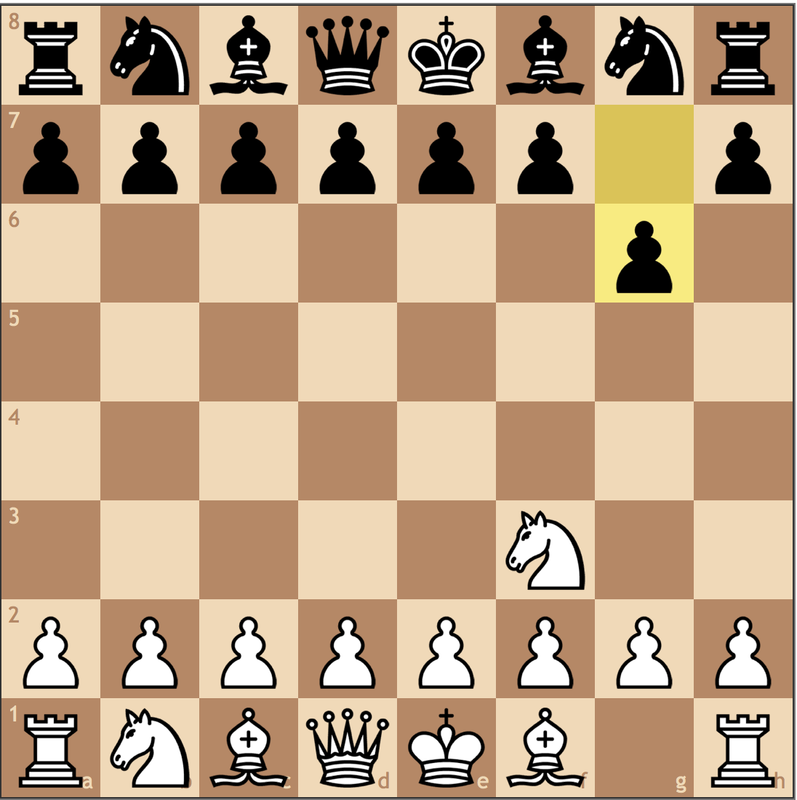 Why not immediately take the pawn on e5? 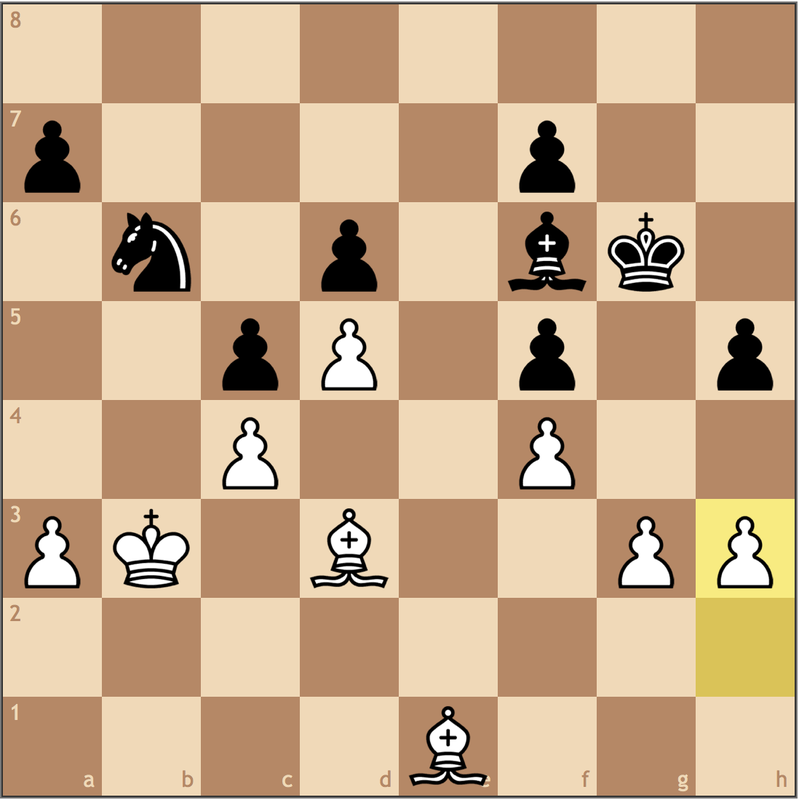 Carlsen decided here that given the choice, he’d rather win the pawn on a7. Should White win this pawn, not only does he get a passed pawn on the a-file, but the pawn on e5 still blocks in Black’s bishop. 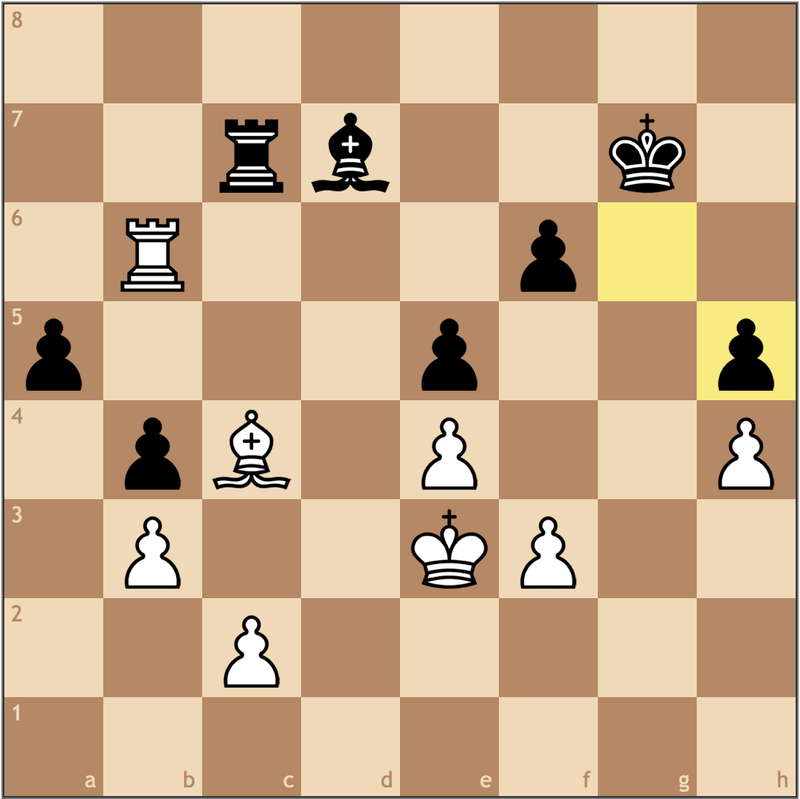 Karjakin didn’t let this happen, but protecting the a-pawn means retreating one of his pieces. 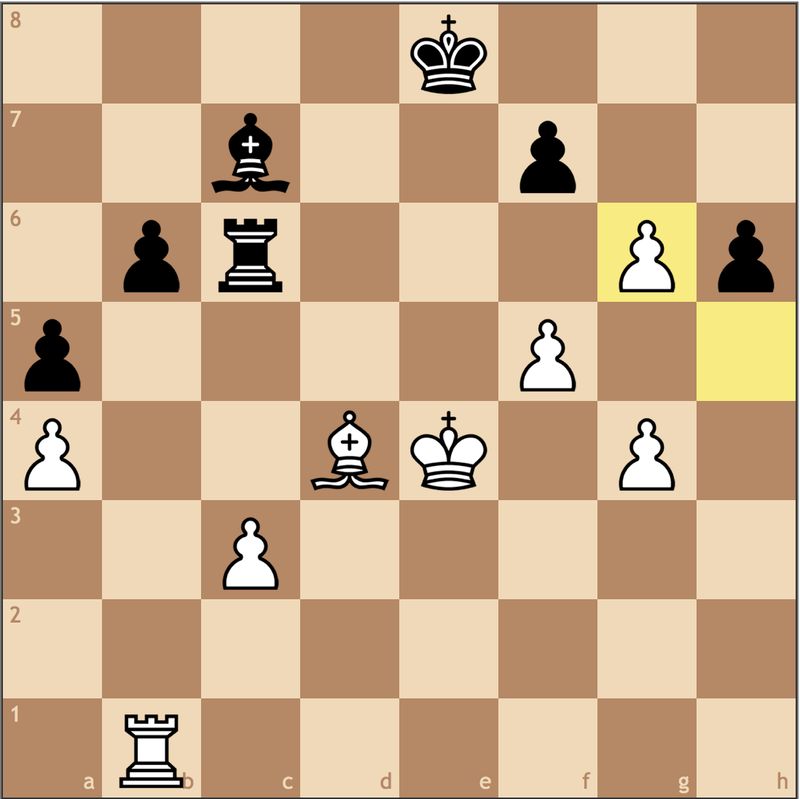 Carlsen wasn’t worried about 27…Rd2+ 28. Kf1 Rd1+ 29. 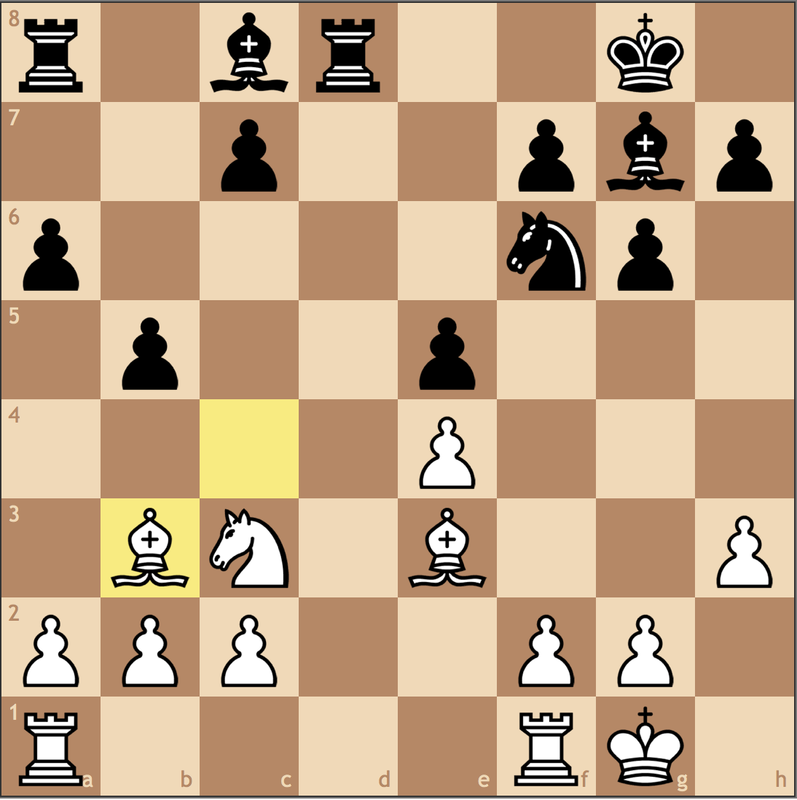 Kg2 and with no more checks, Black must go back and protect a7. It’s in this line that we see how Black’s rook isn’t really a factor on the d-file. 27…Rd7 28. Rxe5+ Kd6 29. Ra5 Bg7 30. f4! Giving Karjakin a choice. By taking the pawn on b2 like he did in the game, Black temporarily puts his bishop offside and has to spend several tempi reactivating it. 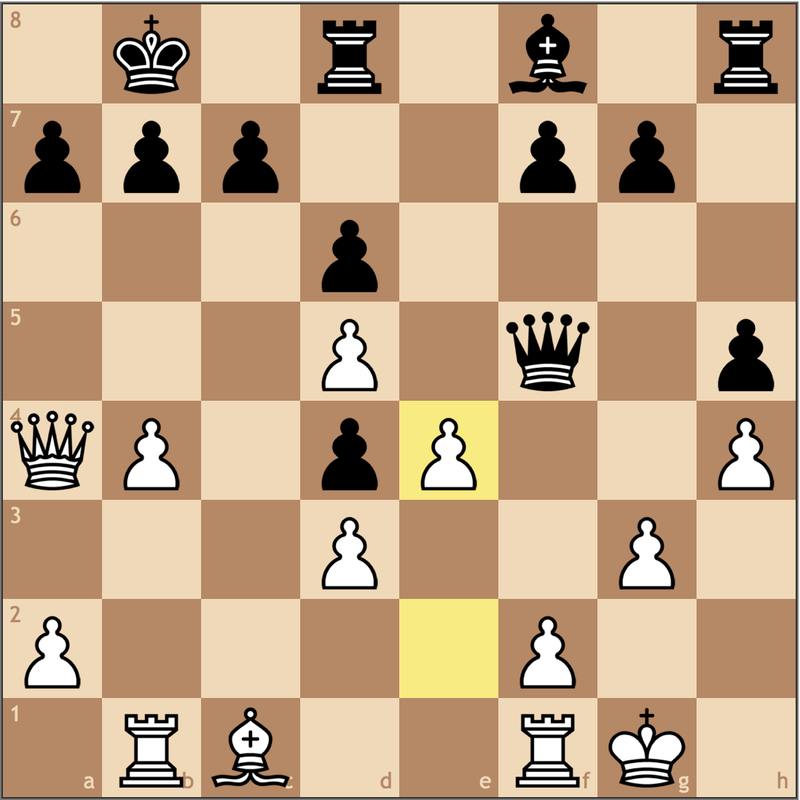 Meanwhile, White can still put pressure on c6 and a7. While Karjakin’s chances for survival dwindle by playing the role of materialist, he doesn’t exactly have a better option. In ditching his c6 pawn, we can safely say that Carlsen holds an advantage. 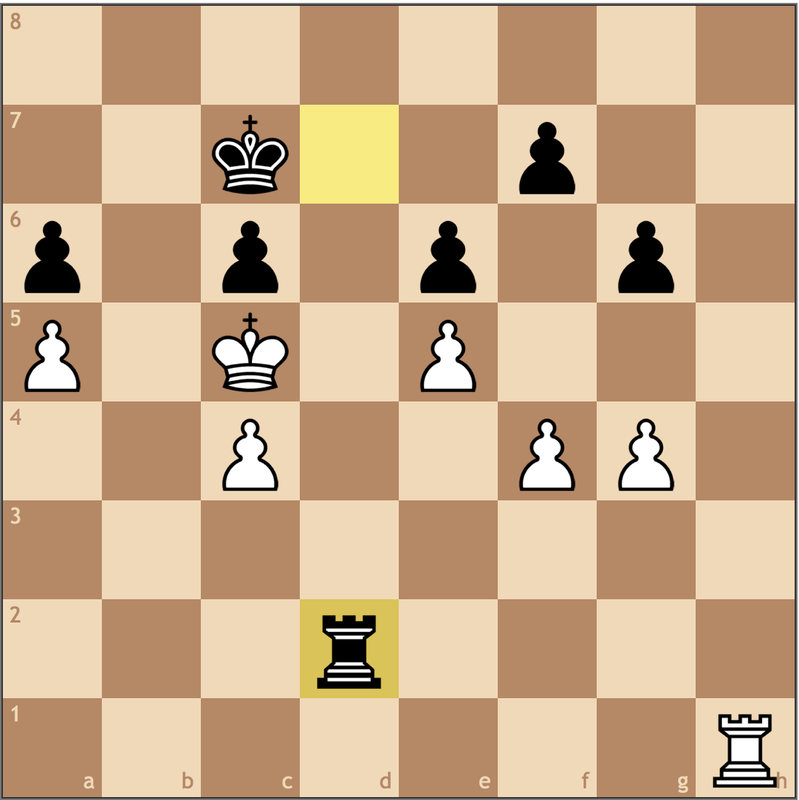 Had Black tried to hold on with 32…Rc7? 33.Rxa7! Rxa7 34. 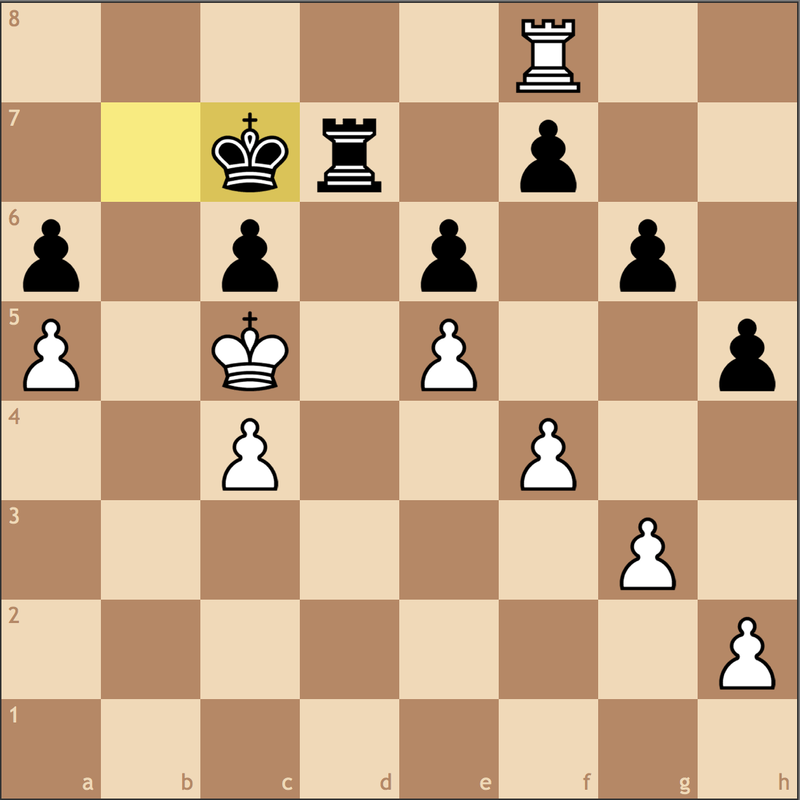 Nxc6 still gives White a nice two pawn cushion. White doesn’t even have to be flashy because 33. 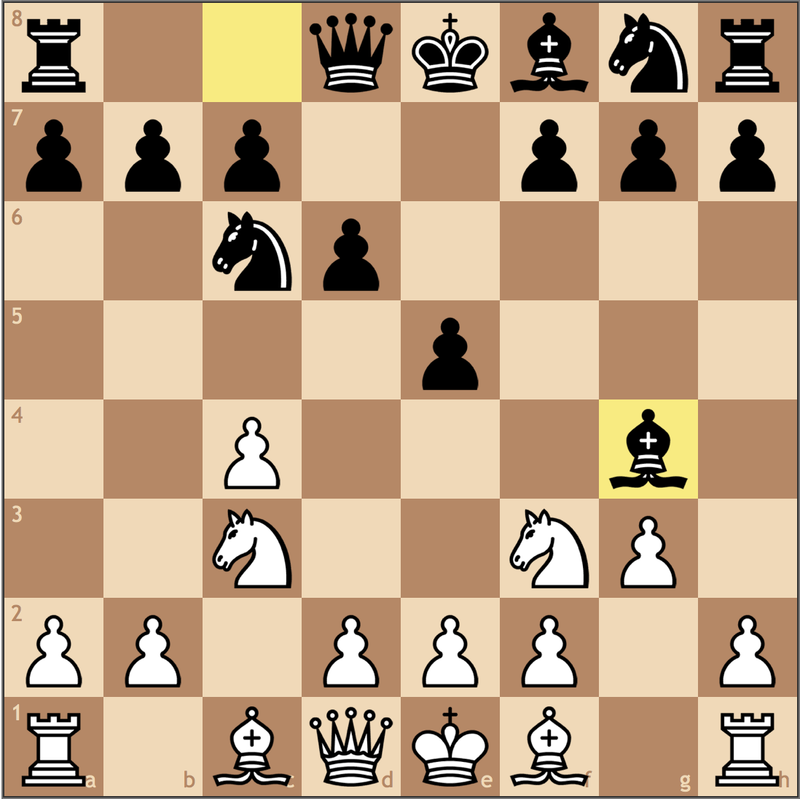 Rc5 will win on c6 as well – if 33…Kd7 34. Bxf7 +-. After spending the last few moves to regroup, Carlsen’s ready to move onto phase two of this endgame. 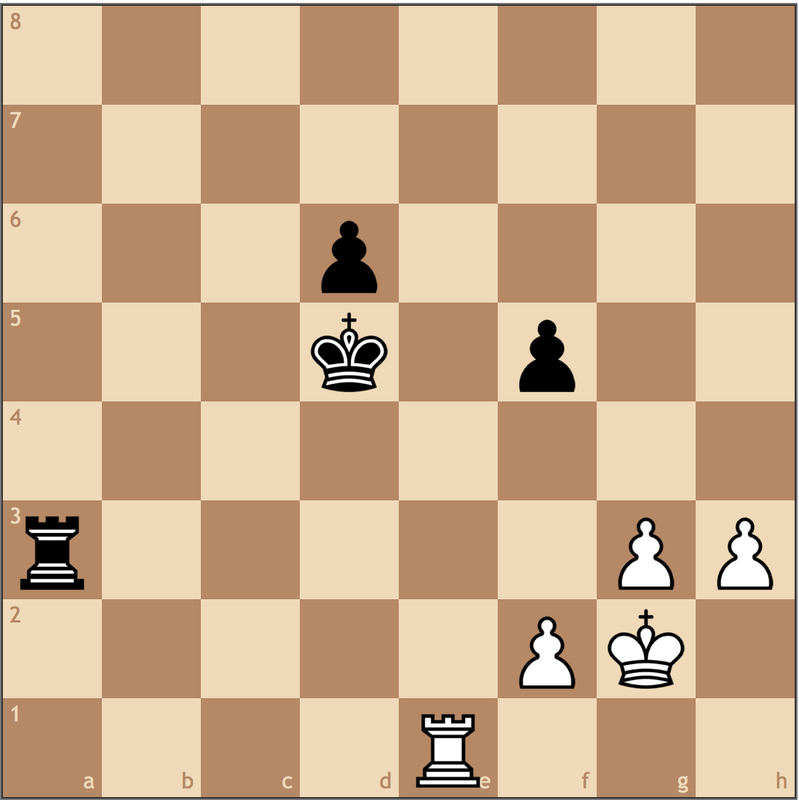 While White stands a pawn up, given the nature of rook and minor piece endgames, there’s still more work to do. The most immediate solution is to try to find ways to make the e-pawn passed. With White’s bishop on b3, it’s important to keep an eye out for sacrifices on f7, but there’s time to improve the position first. 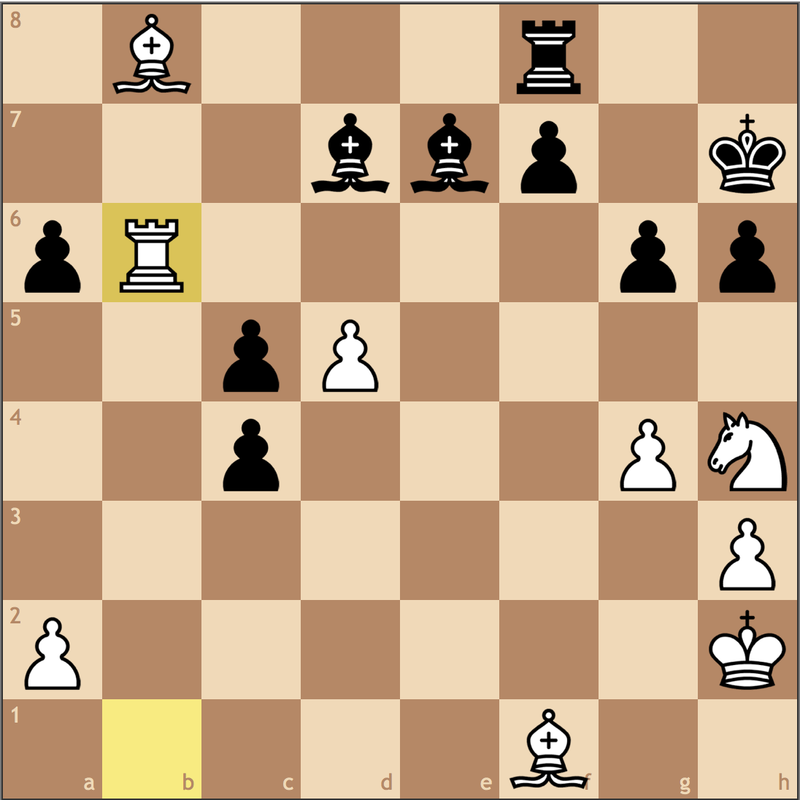 Since Black lacks any light square control, White can play to isolate Black’s f7 pawn with Kf3-e4, and f4-f5 with an edge. 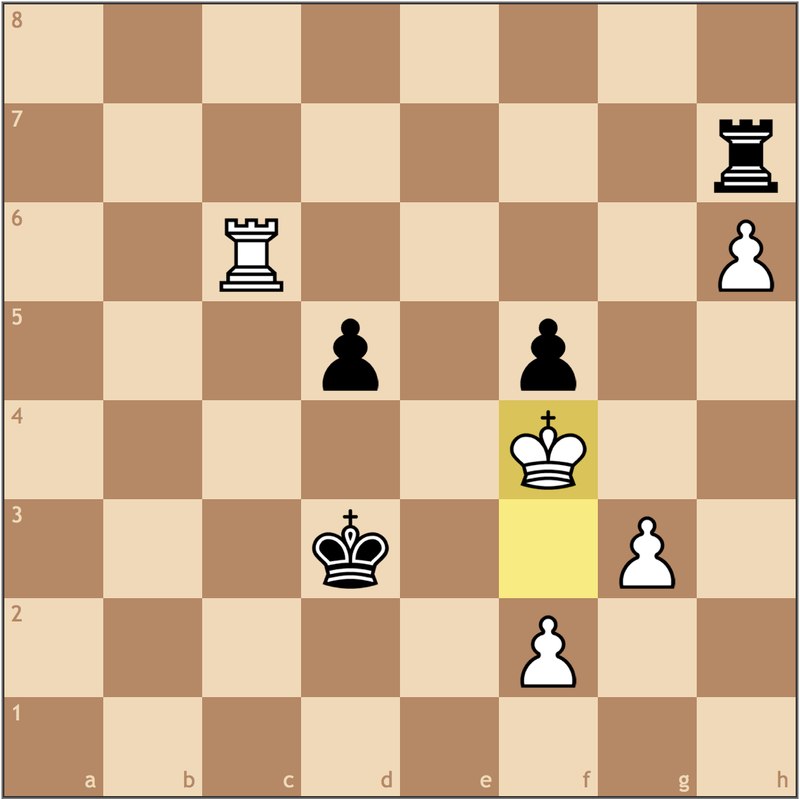 While this never happened in the game, I’m sure Carlsen saw it (the engine approves too!). 36…Nc8 37. Ke4 Kg7 38. Bxf7! 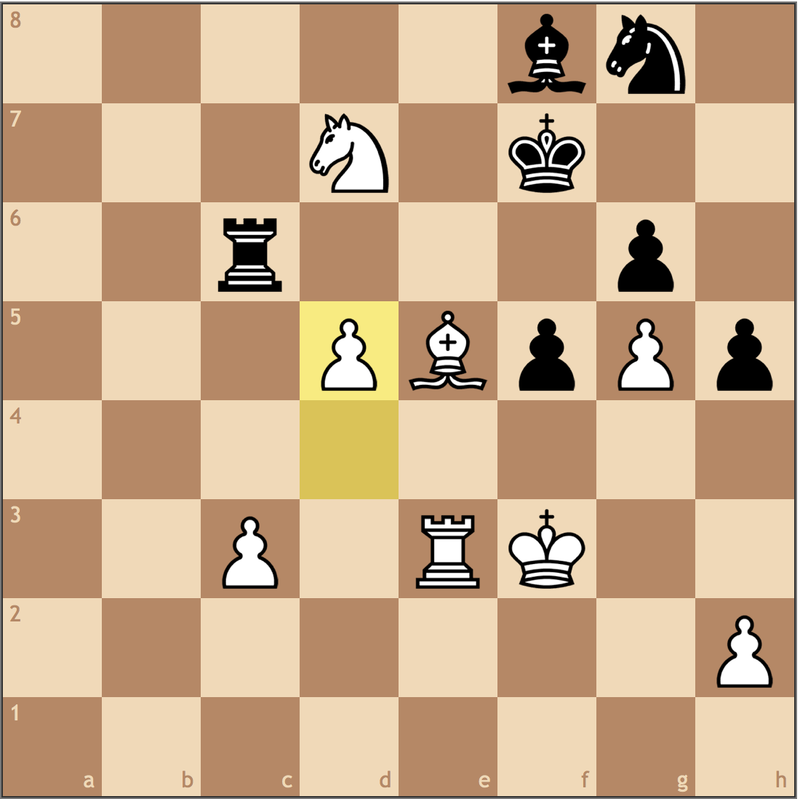 Though the idea of 38. f5 would have won slowly, this move immediately points out Black’s lack of coordination. 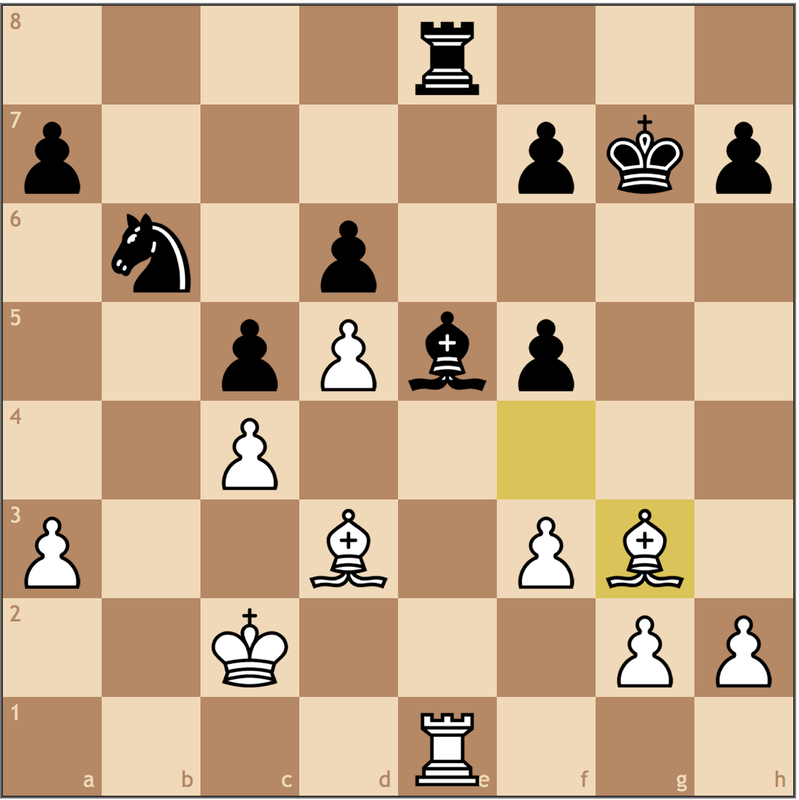 Karjakin must take back on f7, and whichever way he chooses, he allows Nc6-d8 with a discovered attack on c8. 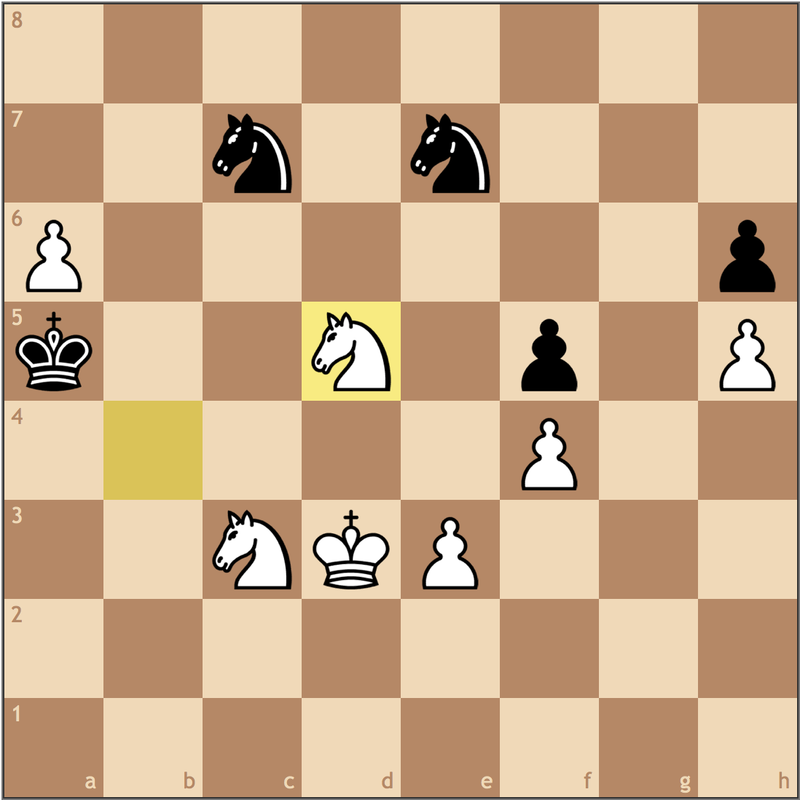 Even with two minor pieces for the rook, Black doesn’t have enough to slow White’s passed pawn. And now for phase three – creating more passed pawns. 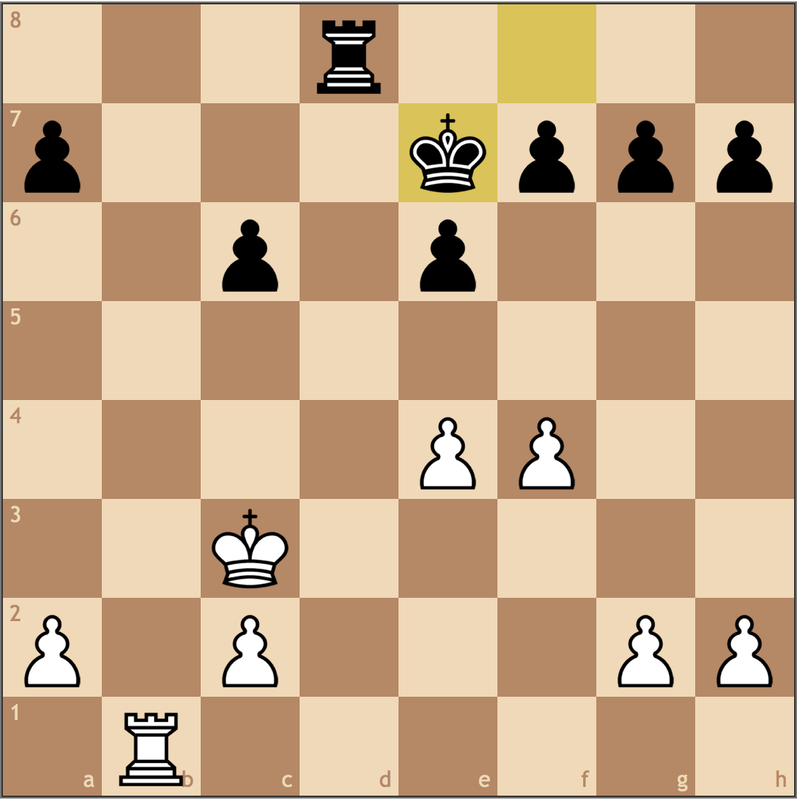 By trading the f4 and g6 pawns, Carlsen can have connected passed pawns, thanks to his other f-pawn on f2. 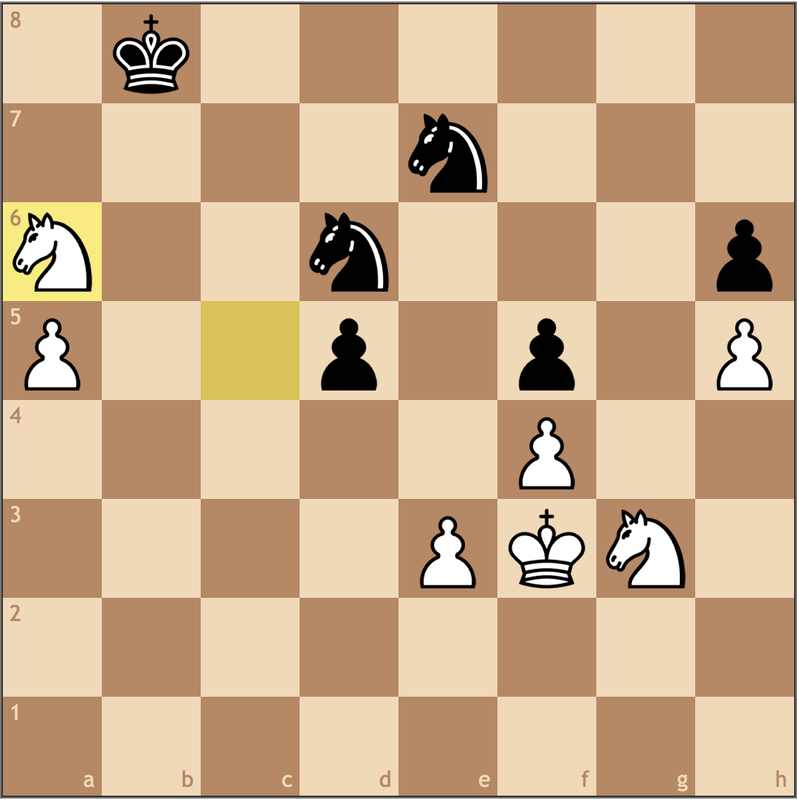 Once this happens, Magnus will push the e- and f-pawns until Black’s minor pieces stop immediate advances. The remainder of the game is added for the sake of completion. 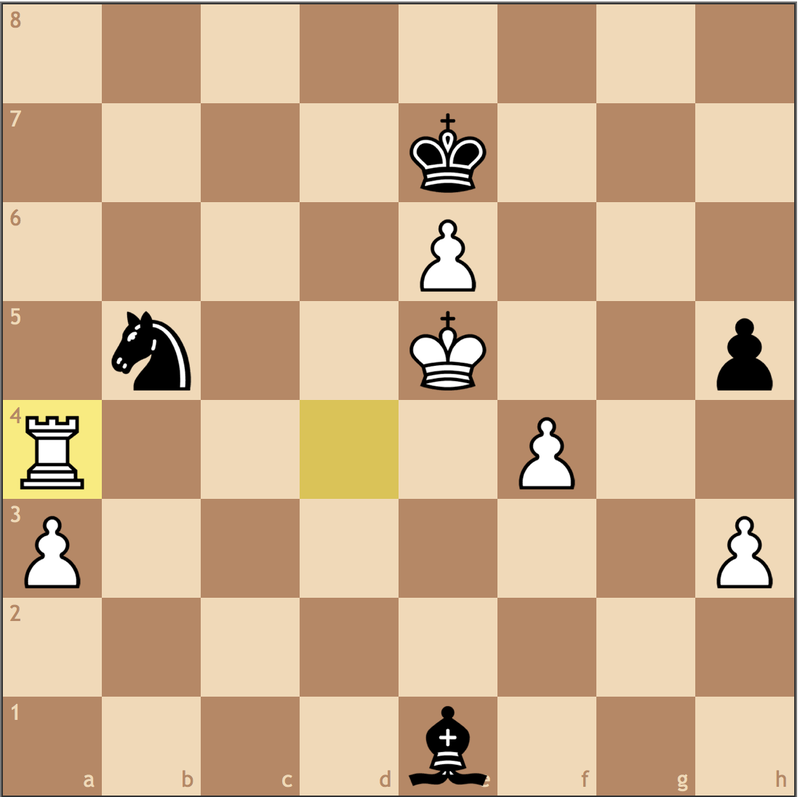 Sure, White has a passed a-pawn now too, but if anything, this is just a confirmation that Black has lost. 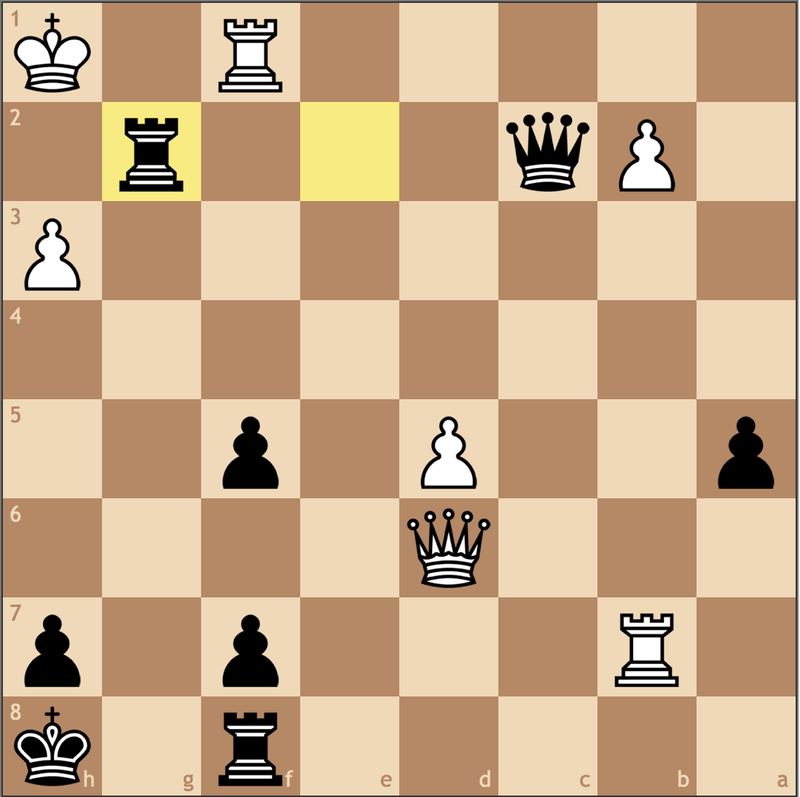 Black must now give up a minor piece to stop White’s passed pawns, after which White’s rook and a-pawn will prove enough. This endgame was particularly instructive because it shows the uncomfortable decision Black must constantly make between material and activity. 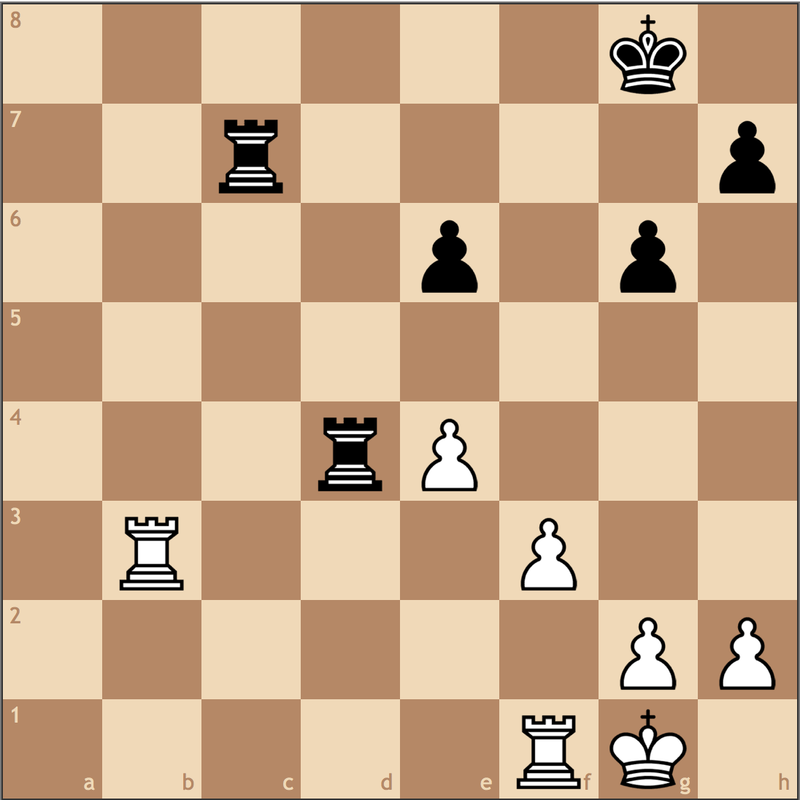 Here Karjakin was consistently compliant with Carlsen’s pawn grabbing, but once the position opened, White was able to use his passed pawn (like our earlier endgames) to limit Black’s play and win. In our next game, Carlsen faces Ivanchuk in a rook and knight endgame where the Ukranian was adamant to hold onto his material. By 2010, Magnus Carlsen had already broken 2800 and held the highest rating in the world (and has ever since!). So again we have a position where piece play is relatively even. Each sides’ rooks are planning to contend for the c-file and are arguably worth the same at the moment. While White’s knight seems menacing on d4, it can only move backward. Black’s knights have a similar issue as it’s unclear as to where they belong. If we do a basic pawn island count, we can see that Carlsen has two, while Ivanchuk has three. 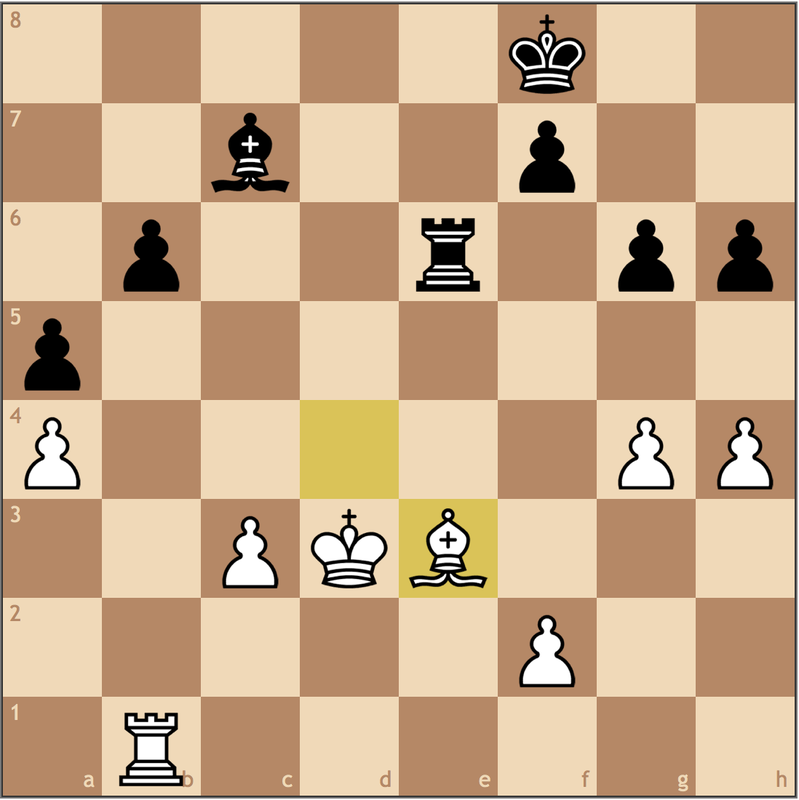 So where in the position is White’s structural advantage giving Carlsen an edge? The d4 square. 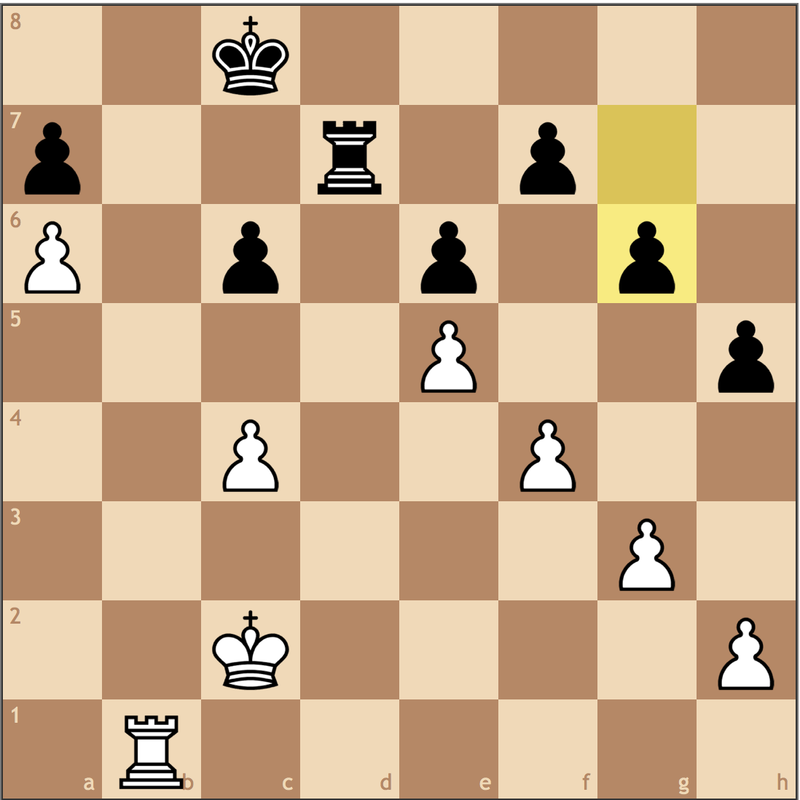 Since Black’s d5 pawn is isolated, that means a pawn can never kick a piece from d4. However, we already mentioned that the knight here doesn’t offer much for White. When our opponent’s pawn structure doesn’t give us enough to work with, the next step is to see if we can create new targets. 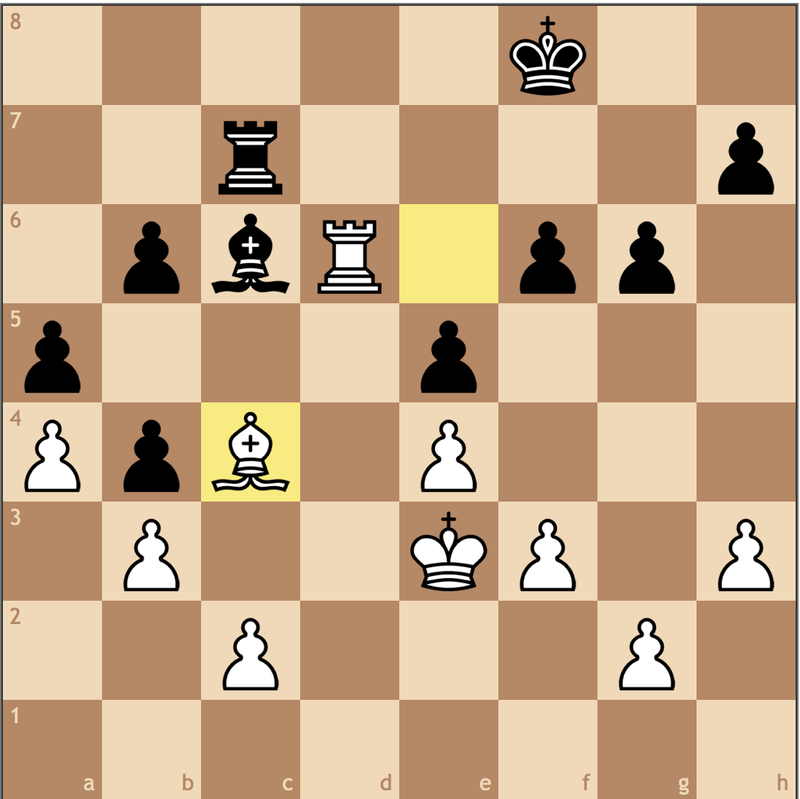 This is why Carlsen played 39. h5! and after Ne7 40. Rh1 gxh5 41. gxh5, we’ve reached a new structure. Even though White’s created an isolated pawn of his own, Black now has three isolani in the position. I think it’s interesting to note how the engine still considers this endgame equal. Perhaps in a perfect world this position is tenable, but in practice this isn’t so easy to hold – and that should be enough for White. Carlsen’s plan is to activate his rook via h1-h4-f4 to attack f7, and then push his queenside pawns to create another weakness. 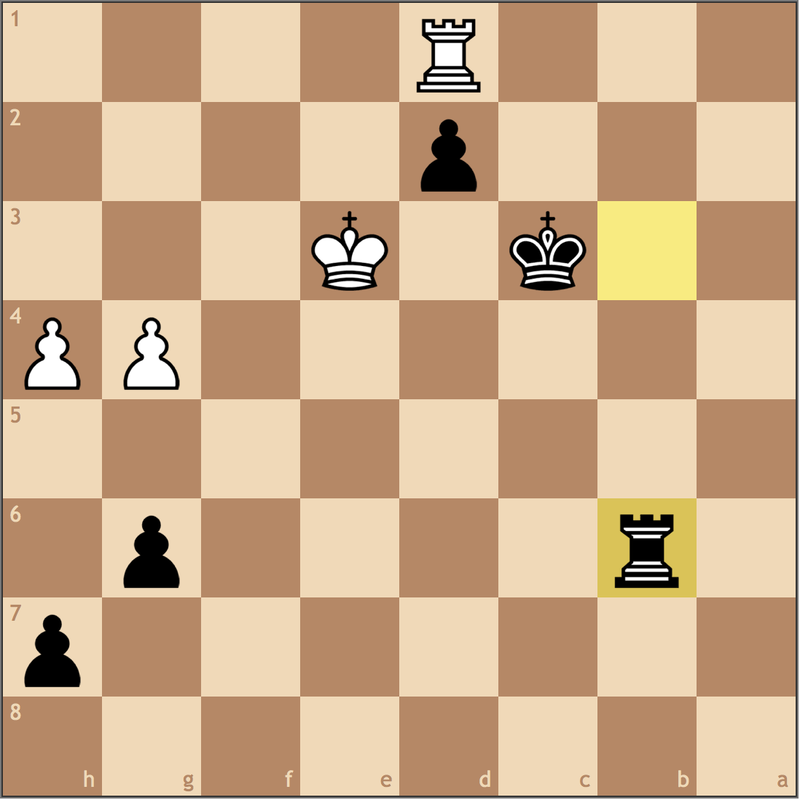 Black creates a padlock here and has done well thus far to improve his position. 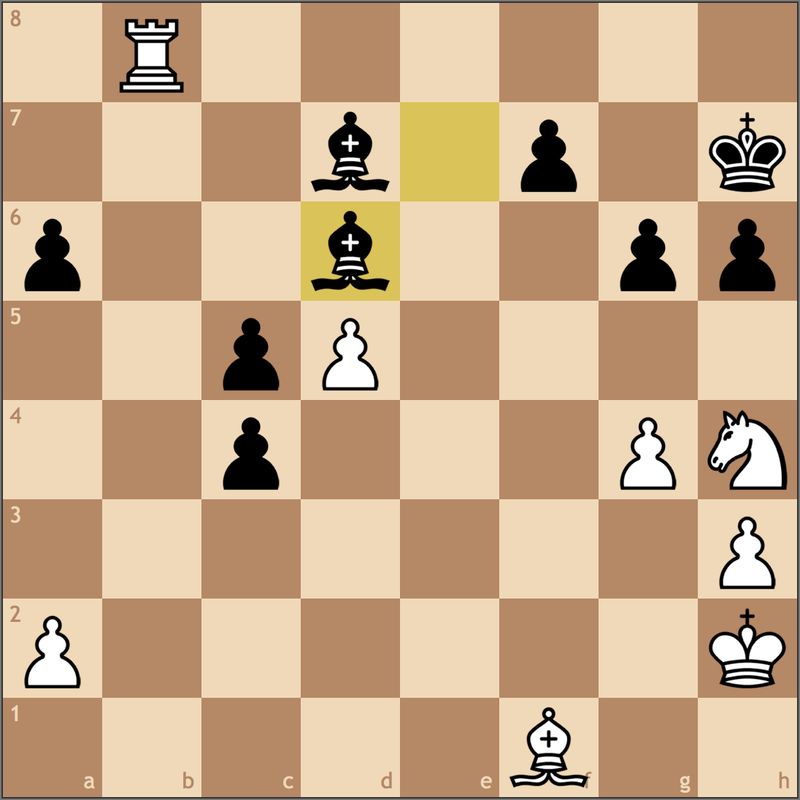 Black’s rook is a little awkward on g5, but it’s doing a good job of pressuring White’s only concession as a result of the structure change seven moves ago. 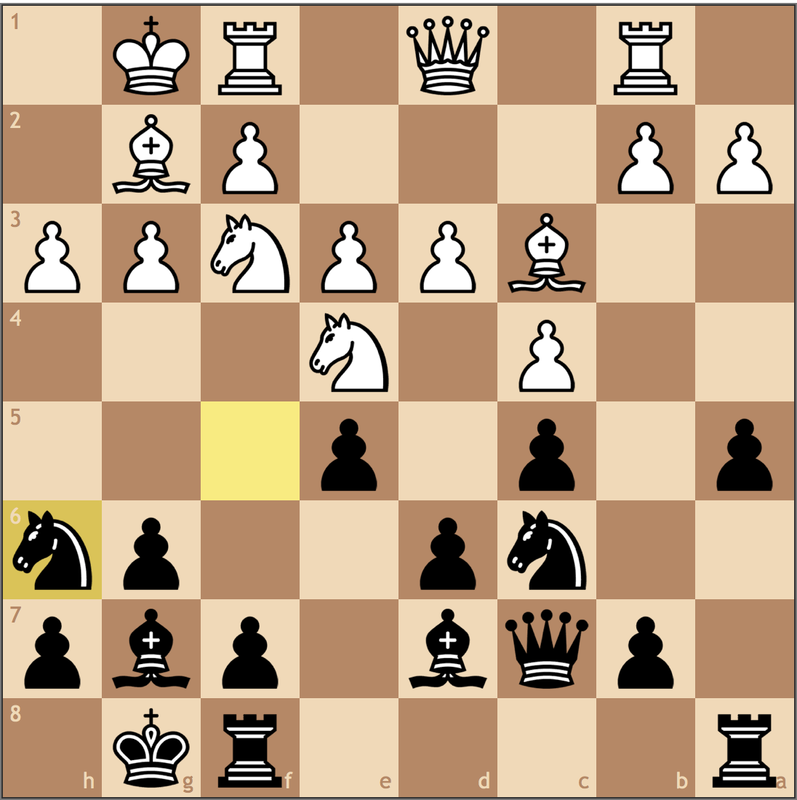 Meanwhile, the knight on d6 offers Black mobility, with ideas of …Nd6-c4, putting pressure on e3, making sure the king stands guard. This is more or less forced, as 47…b5 48. Nb3! with the idea of reaching c5 and pressuring a6. 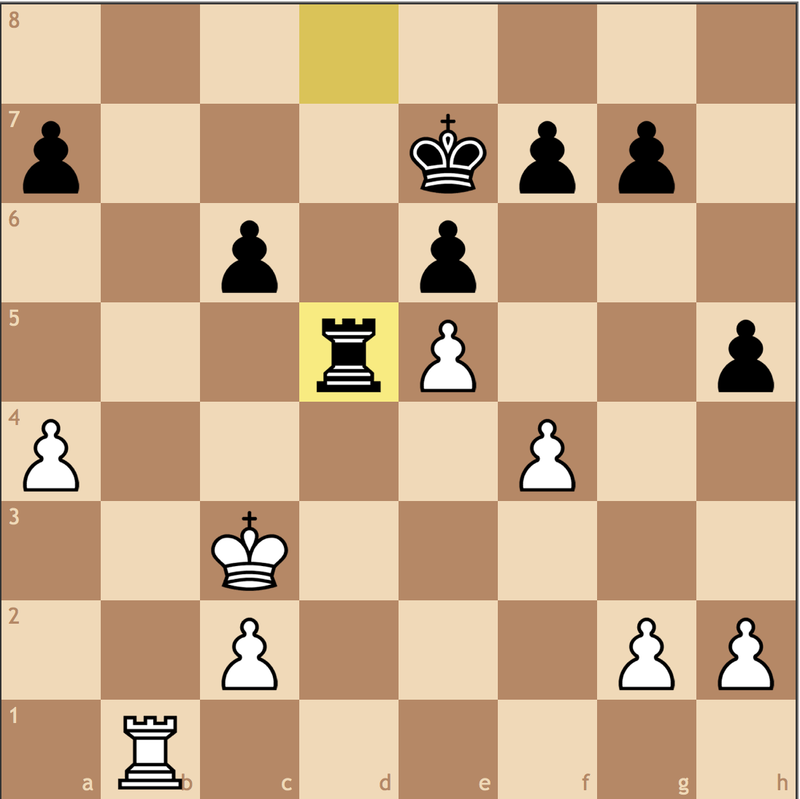 By trading on a5, Ivanchuk eliminates this permanent outpost. Black’s woes begin here with this committal move. Already it was becoming difficult to find improving moves for White, so simply waiting with 48…Re5= would have forced Carlsen to come up with new ideas. 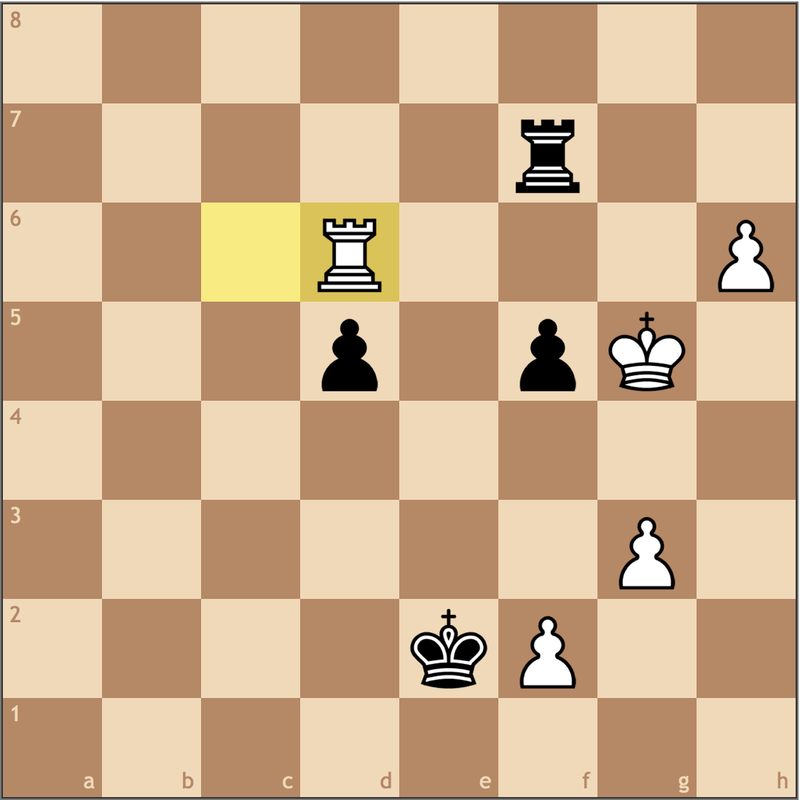 The Ukranian’s move is a mistake because it moves his weakness within reach of White’s knights, making it easier for Carlsen’s pieces to create pressure. 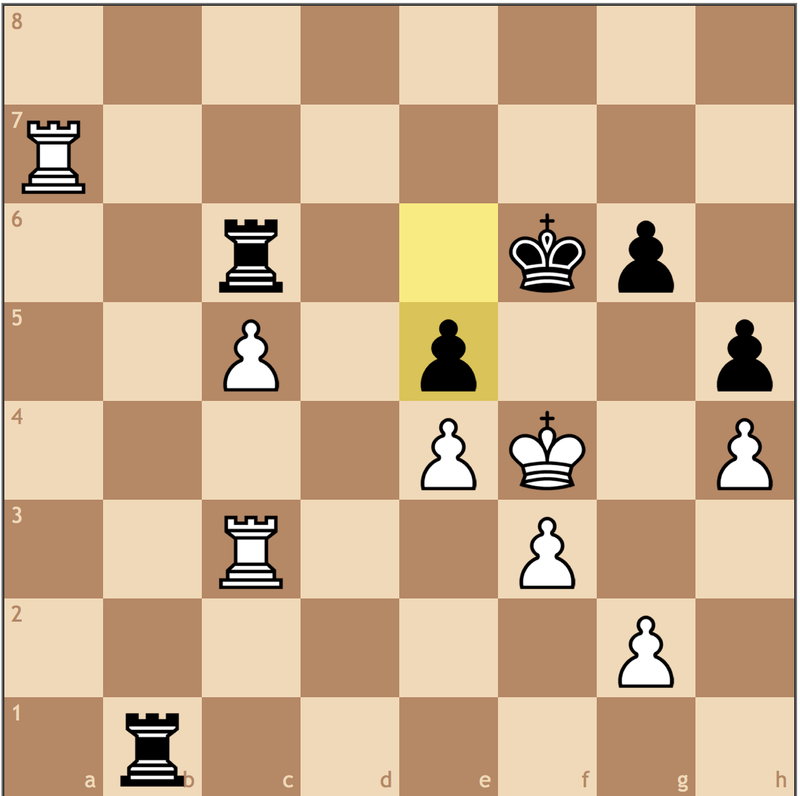 I’m thinking Ivanchuk just panicked here because Rf4-f6 can be met with …Ne7-g8 and Black holds. 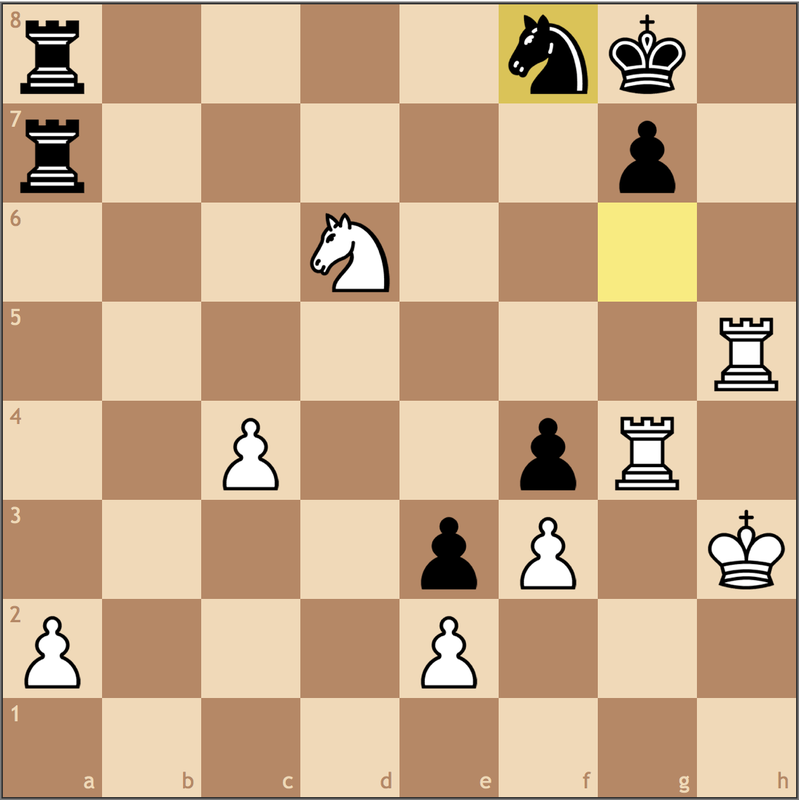 White’s rook is no longer needed on f4 since White’s knights are watching Black’s f-pawn. 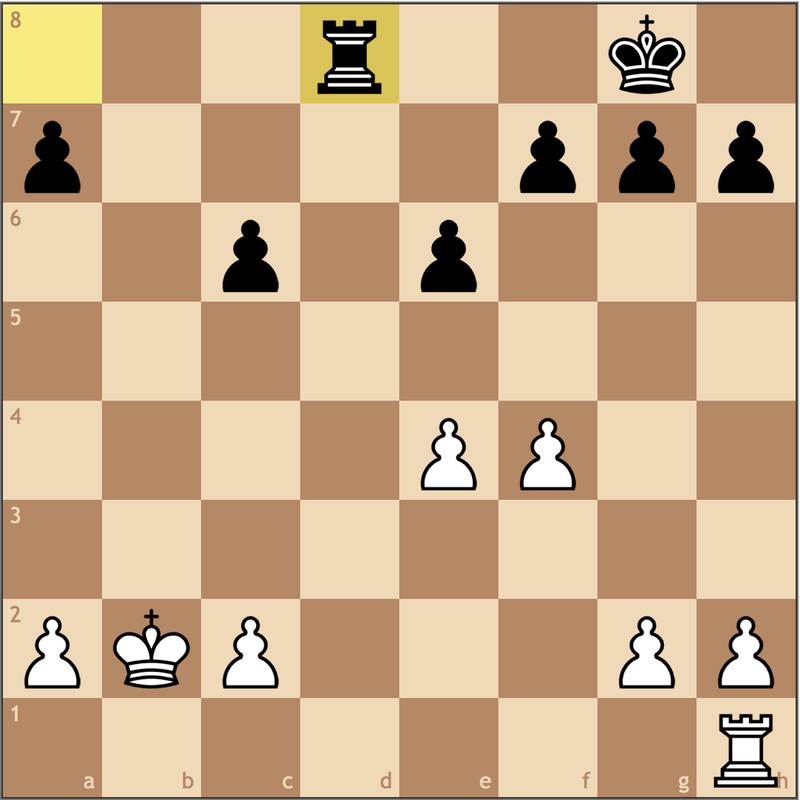 By activating the rook White can play to infiltrate on the queenside. 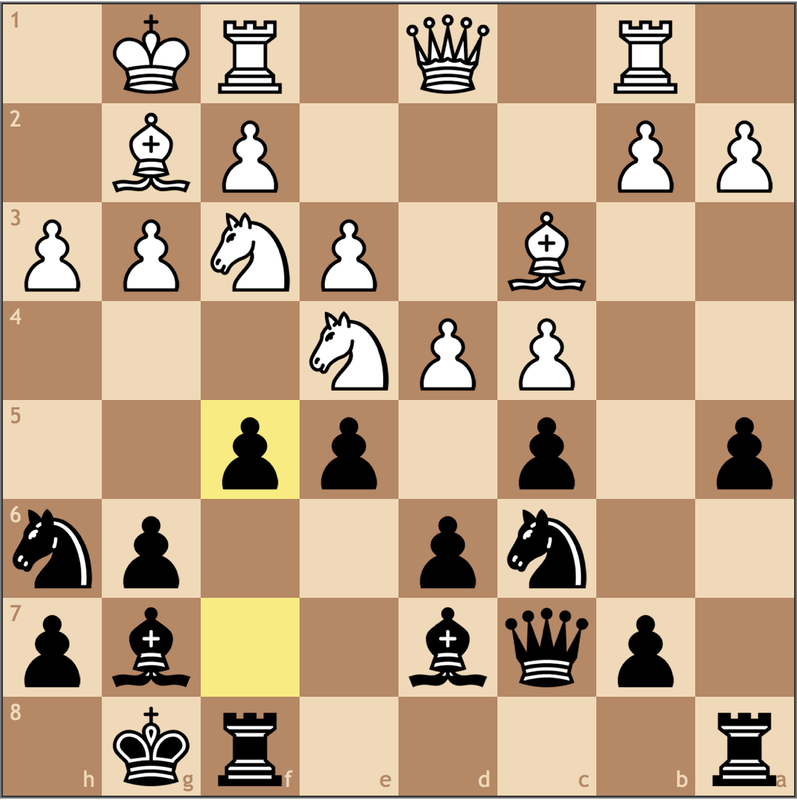 Black can bring his rook over too, but that means no pressure on h5, and fewer defenders of the f5 pawn. 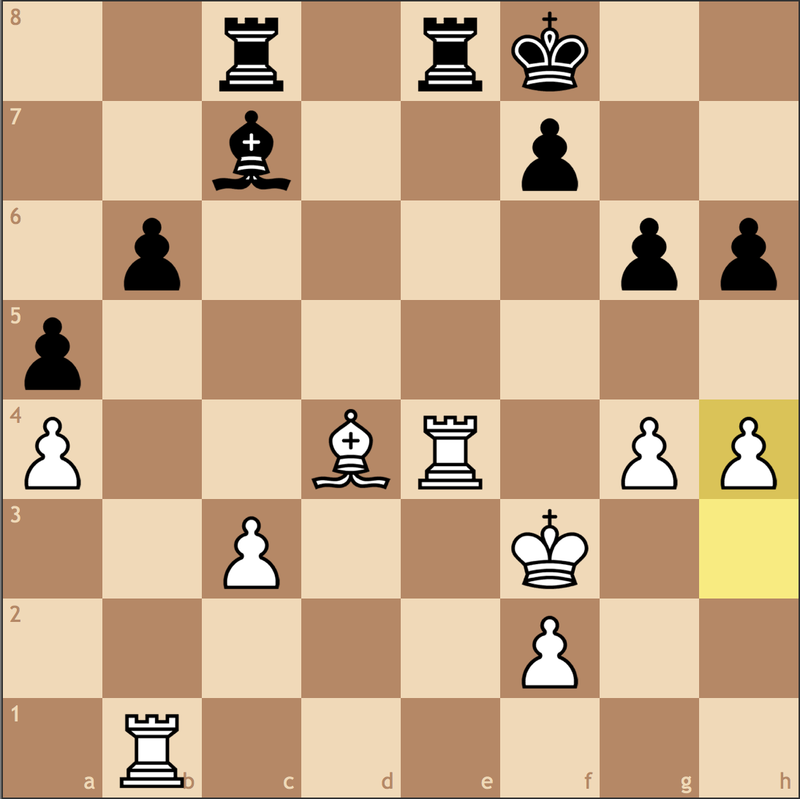 Before relocating the rook, Carlsen will insert f3-f4 to stop any potential pawn sacrifice ideas of …f5-f4 and fix the weakness. While it may not seem like much has happened, all of Black’s pieces are tied to pawns, giving White time to do the one thing he’s done best: improve his pieces. 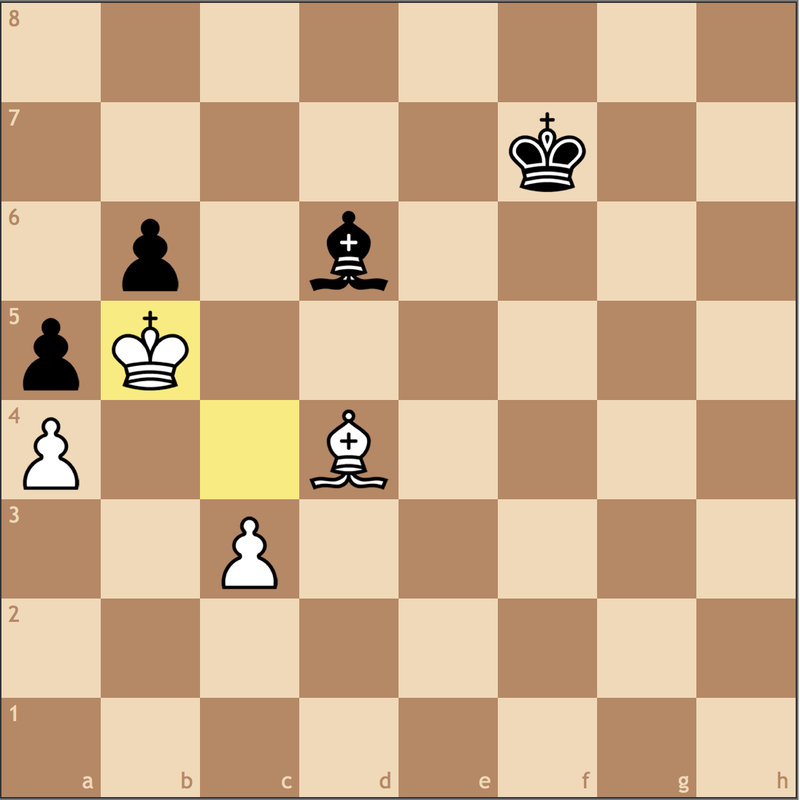 A good rule of thumb for knight endgames is that often times they can be calculated to a result like pawn endings. While this can be impractical to do over the board, being up a pawn in a knight endgame is definitely a promising sign, and in this game, Carlsen manages to convert. For the sake of brevity, I want to skip to a critical moment. 58…Kb7 59. Nb4 Nc4 60. a6+ Kb6 61. Ke2 Nd6 62. Kd3 Nb5 63. Ne2 Ka5 64. Nc3 Nc7 65. Nbxd5! 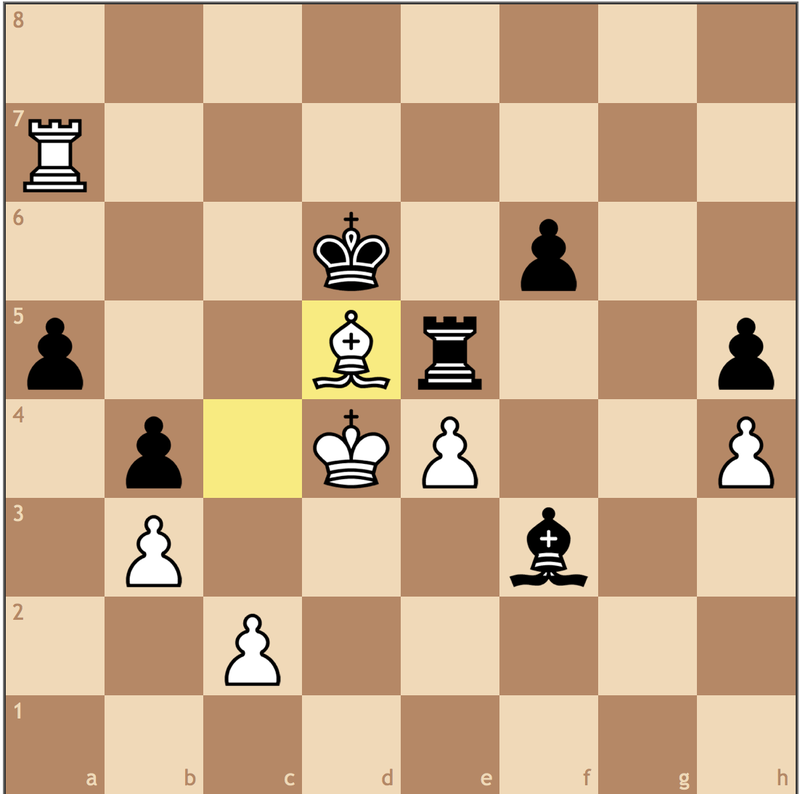 Black’s king is too far to stop White’s pawns, so Ivanchuk resigned here. Unlike the Karjakin game, Ivanchuk held onto his weaknesses (and rightfully so! ), only to err later with 48…f5?. In retrospect it seems like a simple mistake, I think it’s really illustrative of how difficult it is to play such a position and just hold. In today’s post, we discussed how a simplistic understanding of pawn islands can help us find weaknesses and weak squares. Similar to having better pieces, having a better structure can give you control of the pace of the game, ultimately making the difference between a win and a draw. For today’s video, I dug up a game I played three years ago at the Fairfax Open against a former coach. While I wound up losing the game, I thought that this game was particularly instructive, and shows just how fickle the initiative can be. Pay special attention to how each side missed opportunities to win, and try to see if you can also find your own improvements. At the time I played this game, I was rated 1900, and I think that this game is a fair representation of what play is like at that level. The video went kind of long, but I’m hoping I was able to break it down so everybody can understand the battle that took place. Enjoy! In last Tuesday’s post, we discussed how the king is a vital resource in various practical endgames, and how it’s safety can shape the outcome. By trapping our opponent’s pieces with our activity, we offer ourselves good winning chances and the ability to press for a result. However, there are many cases where this is simply not possible. Perhaps the position is too simplified, or our opponent has too many avenues of play at his disposal. In such cases, it’s important to stay active and take note of small advantages like better-placed pieces. In today’s post, I wish to share four of Carlsen’s endgames to show how simply having a slightly better-placed rook can make a slight advantage decisive. 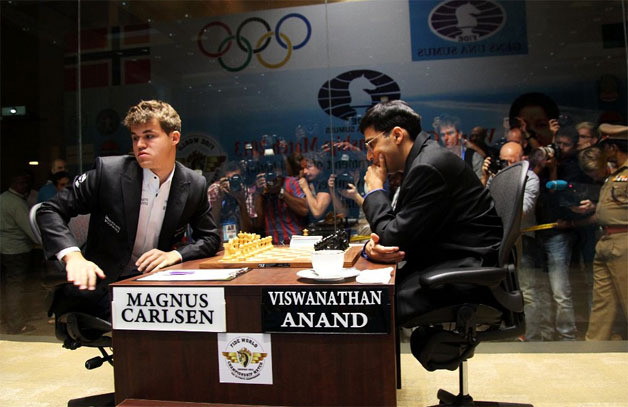 Our first example comes from Magnus’ win over the then reigning World Champion, Viswanathan Anand. In just three moves, the balance of the game has changed. 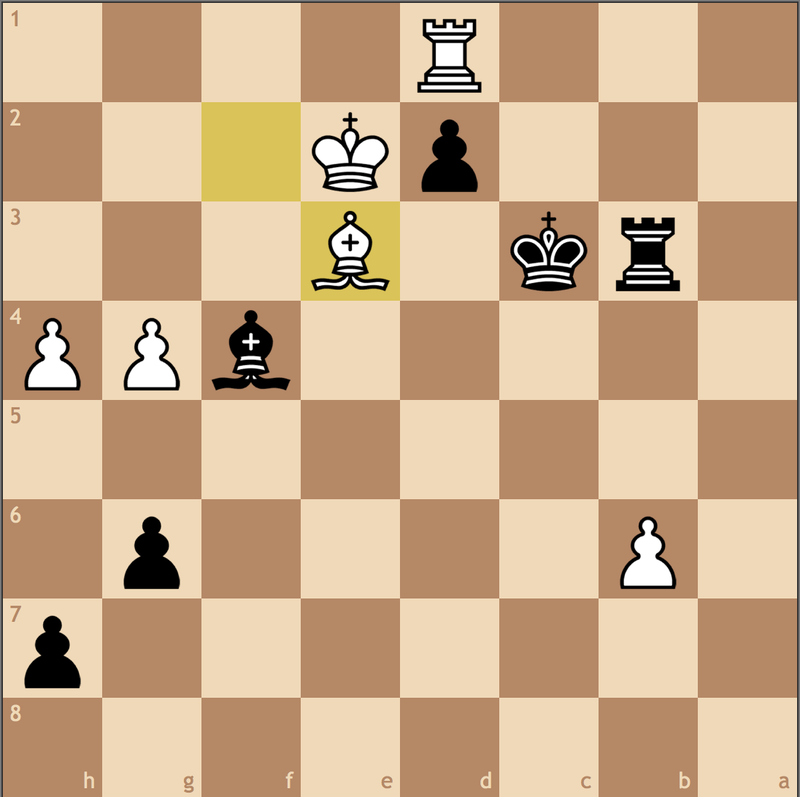 Black’s rook, now on h7, has much less scope than it did on a3. 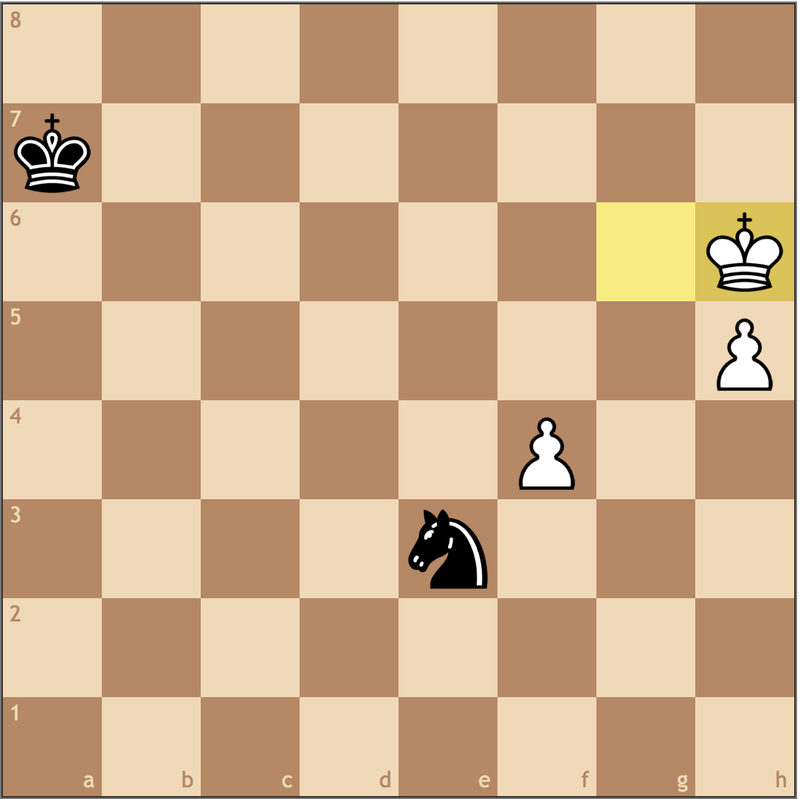 Sure, the h-pawn can no longer advance, but in driving away the rook, White’s king is more mobile and can target Black’s weak pawns. 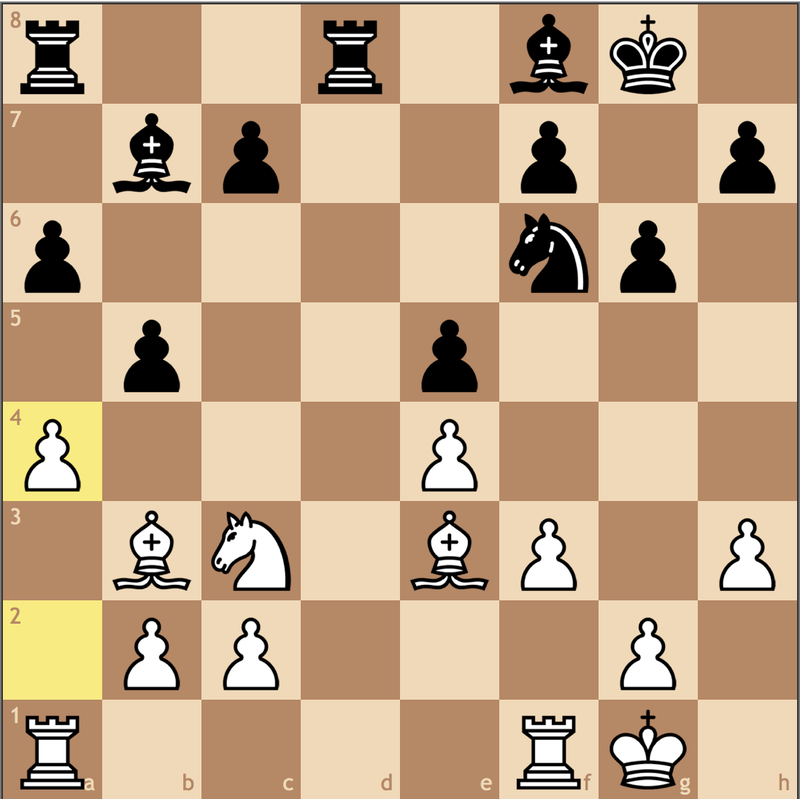 Before going through with this plan, Carlsen should protect the pawn on h6. Which option is better, Re1-h1 or Re1-e6? The most active choice, and the starting point of today’s lesson. While it may have seemed more natural to slide behind the passed h-pawn, Black has made it clear that this pawn is going nowhere. 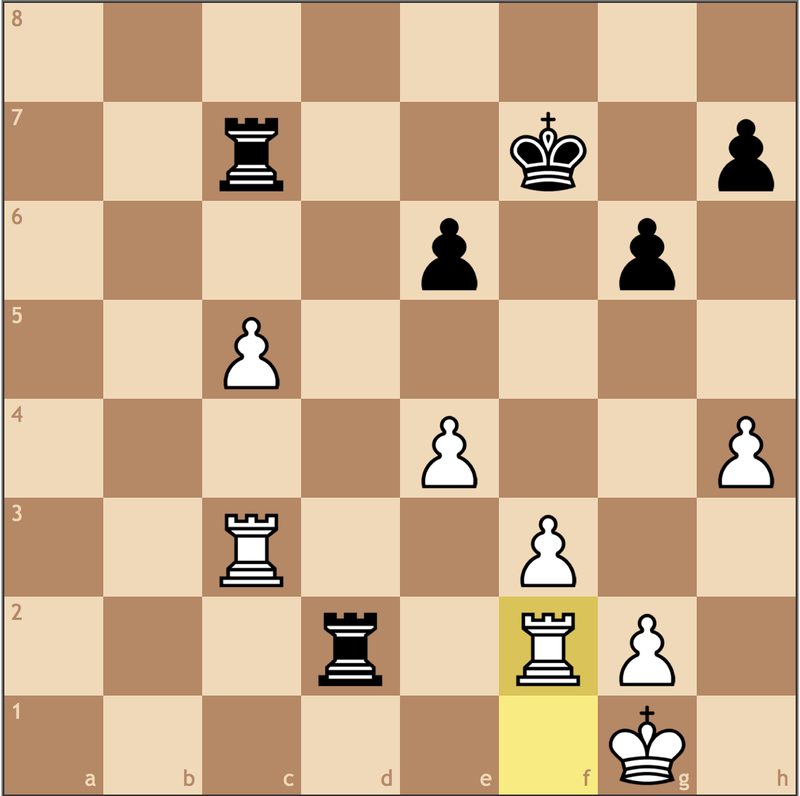 If Carlsen had instead gone to h1, his rook would have been just as passive as Black’s. 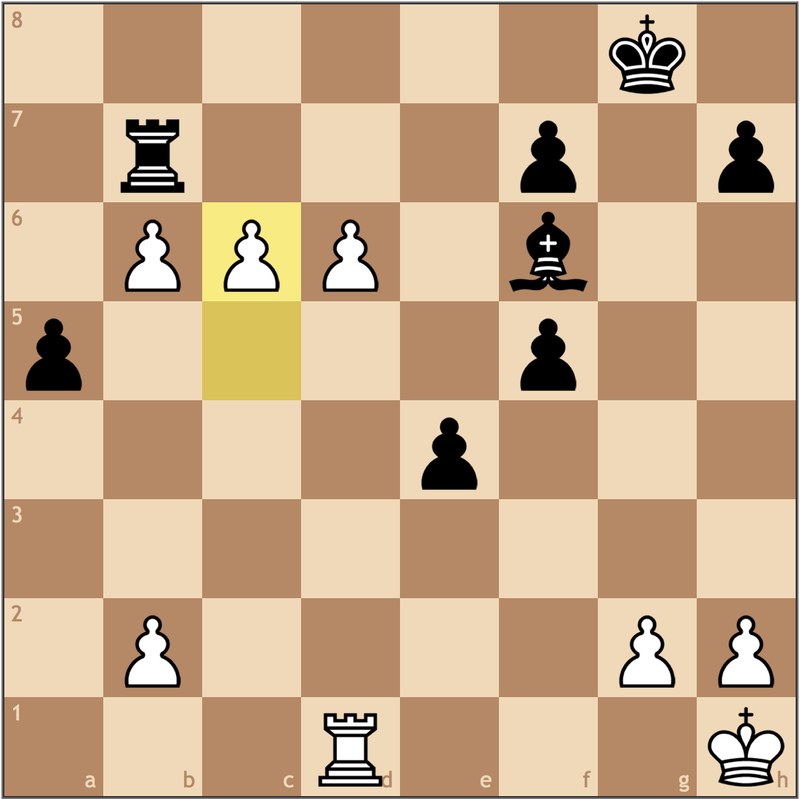 By going to e6, not only does White protect the pawn, but he keeps control of the e-file while maintaining the ability to play on the sixth rank to slow Black’s d-pawn. 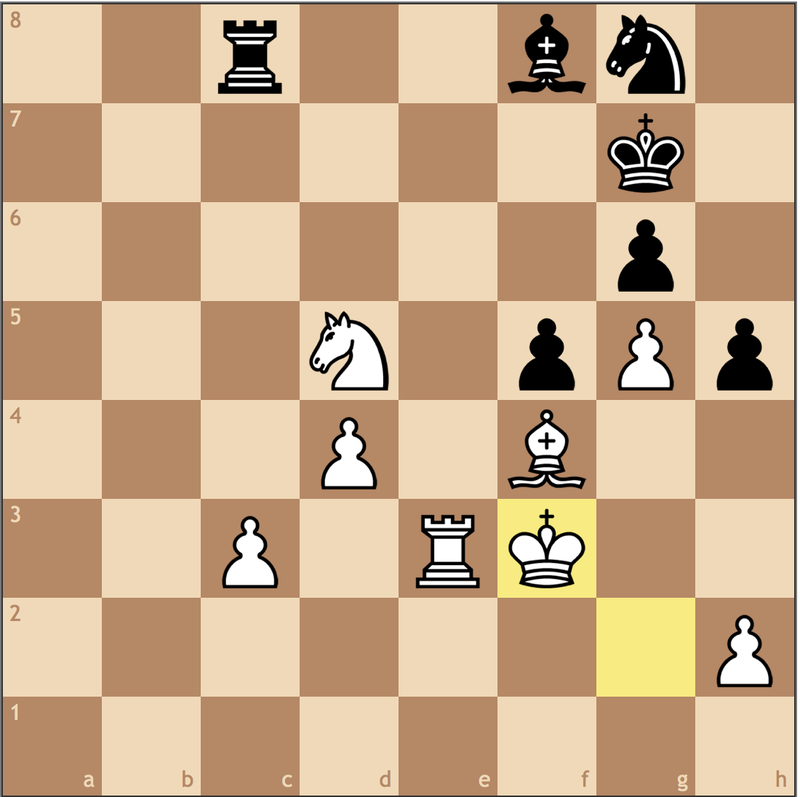 Meanwhile, White’s king can aid the h-pawn on it’s journey to promotion – Anand’s rook defense is only temporary. Admittedly, this isn’t that difficult to find, but in analyzing this position, we give ourselves a ground to compare pieces. 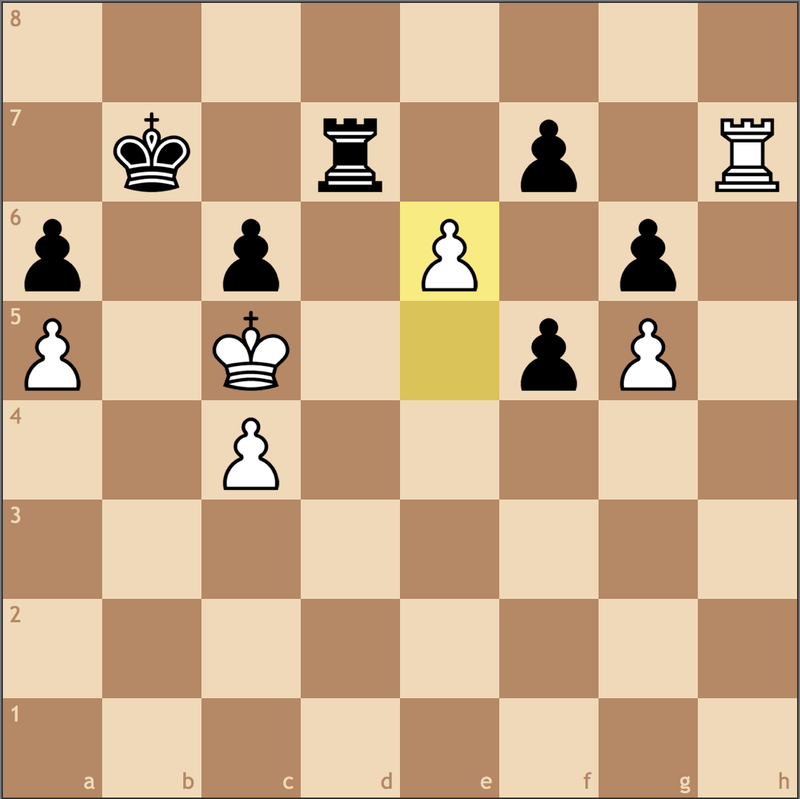 In this case, the e6 rook is much better than its counterpart on h7 because it offers White more options to proceed with the game. Anand struggled for a few more moves, but the game is already lost. And so we see another way to win an endgame. Rather than limiting our opponent’s play, we can stretch our opponent’s play across the board. 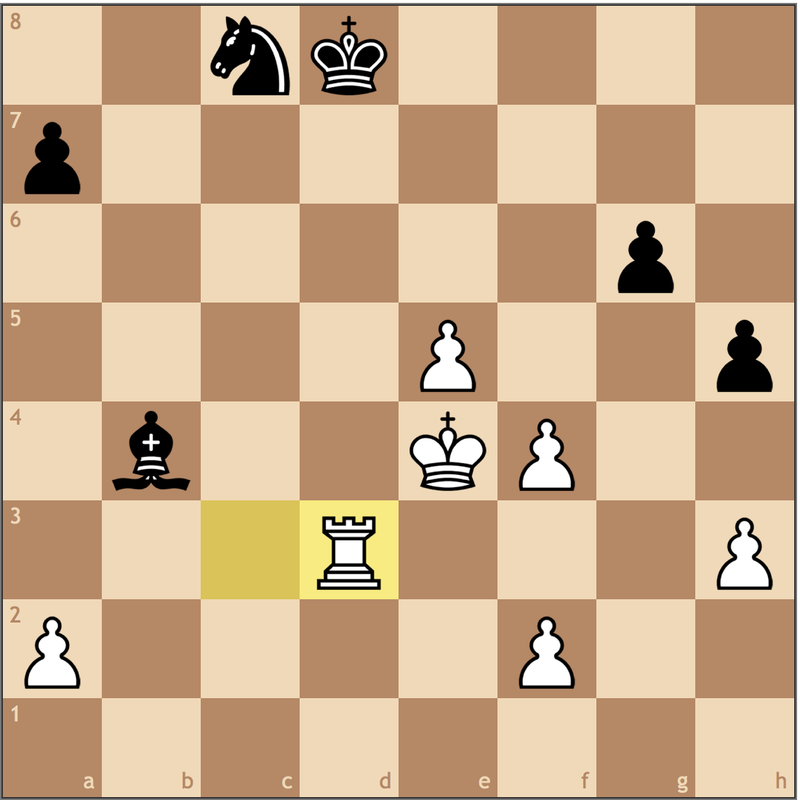 Anand throws in the towel here, as the rook-pawn is enough for White due to the considerable distance from Black’s king. 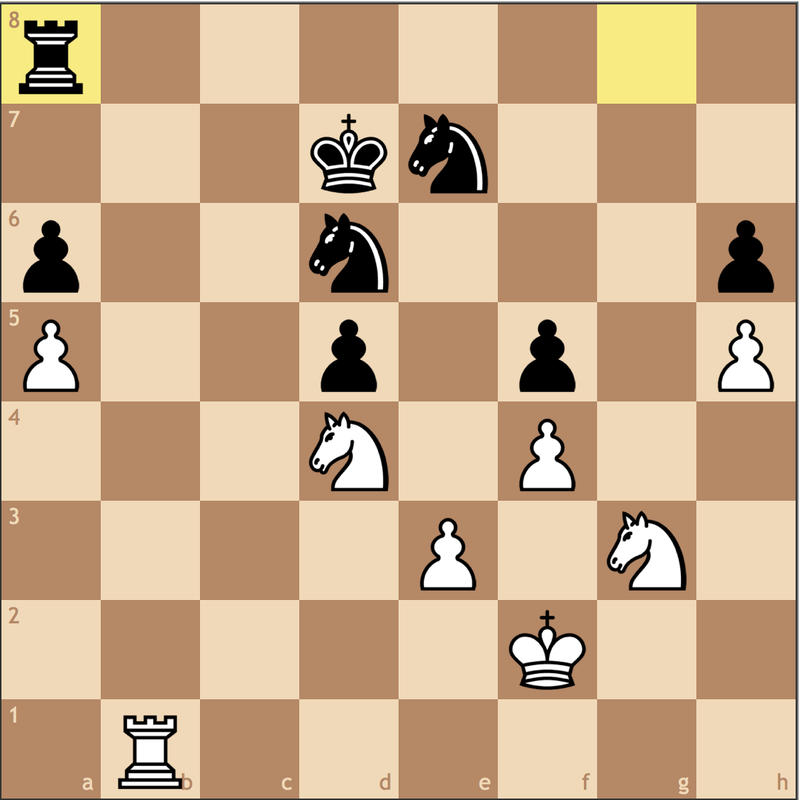 With simplification being the only real option, Anand confirmed what we knew four moves ago. Our next example offers a little more material for each side, but once again, the better-placed rook is the deciding factor! Already we can see that Carlsen has succeeded in making Leko’s life difficult, but even with some minor piece restriction, there’s still a little work to do. 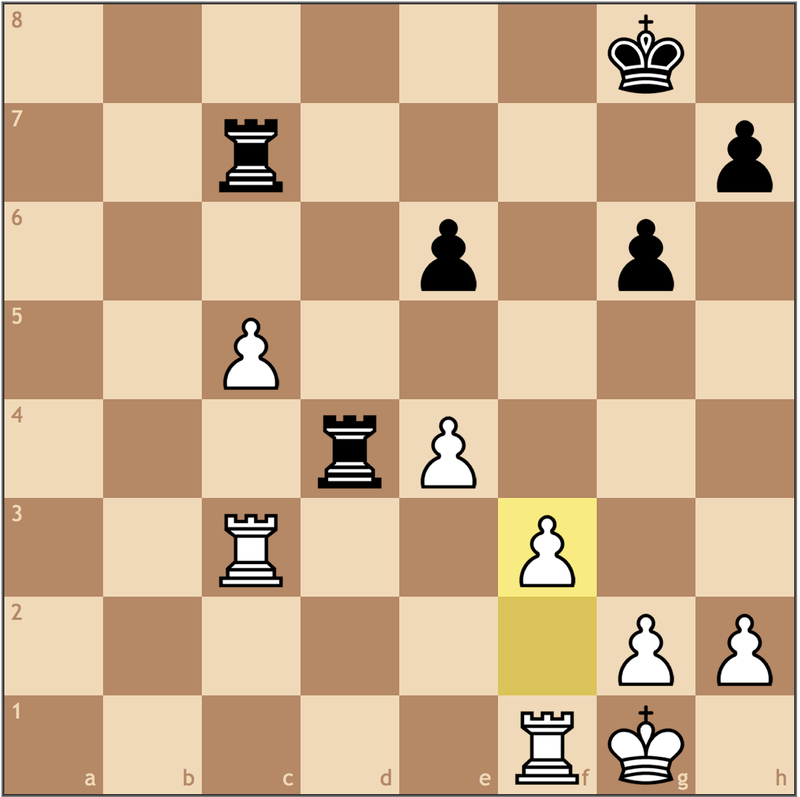 As you may have guessed, White will try to win Black’s d5 pawn to gain two queenside passed pawns. 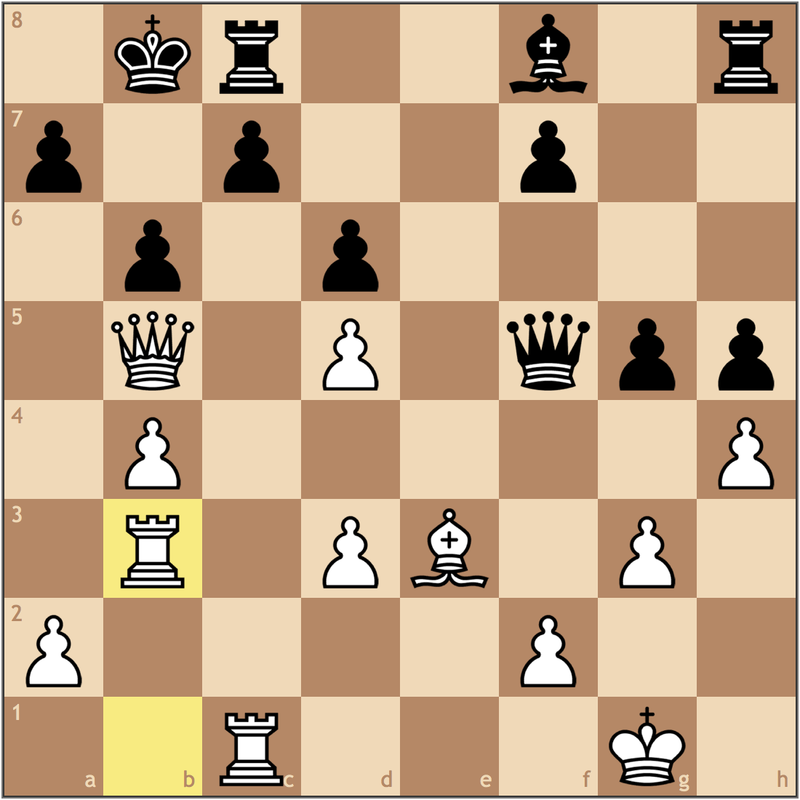 If Black tries to do too much with 47… Bf8, we reach the theme of paralysis once again with the move 47. Re2!, the idea being to infiltrate the 7th rank from a7, and all the sudden Black has to defend himself from ugly mating threats. 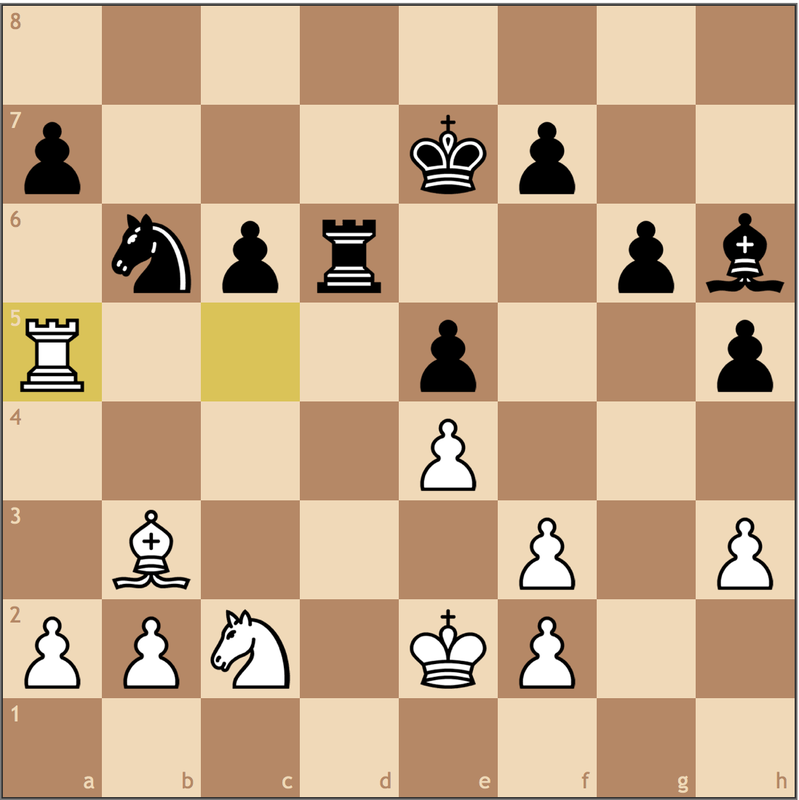 So instead, Leko gives Magnus the pawn in the hope of putting up some resistance. Classic Carlsen. As we’ve come to learn in these last two posts, it’s extremely important to improve your position as much as possible before going forth with a winning plan. 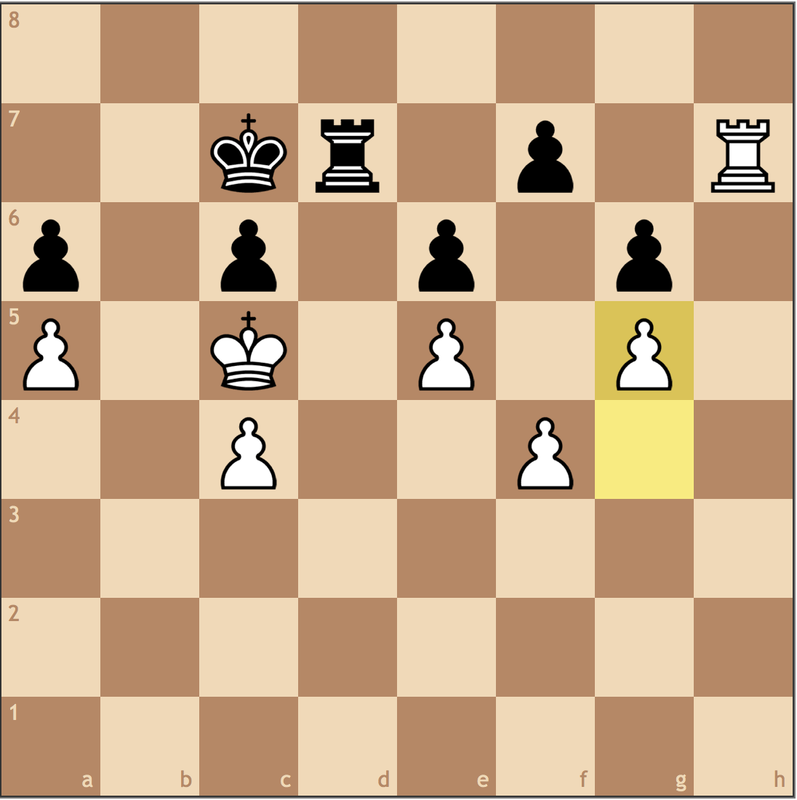 This move offers an example of consolidation while offering the King’s resources to the attack. And now the position doesn’t seem so difficult to convert. 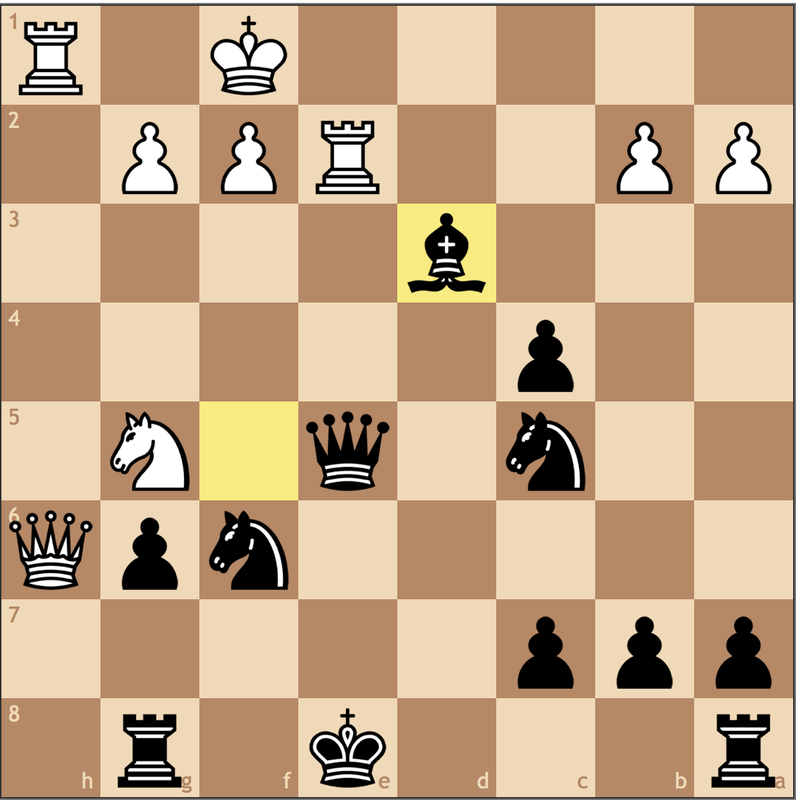 From c6, the Black rook doesn’t really offer any function, while the e3 rook cuts off Black’s king. It would be an exaggeration here to say that Black’s defenses are stretched here, but his inability to create counterplay is Leko’s biggest burden. 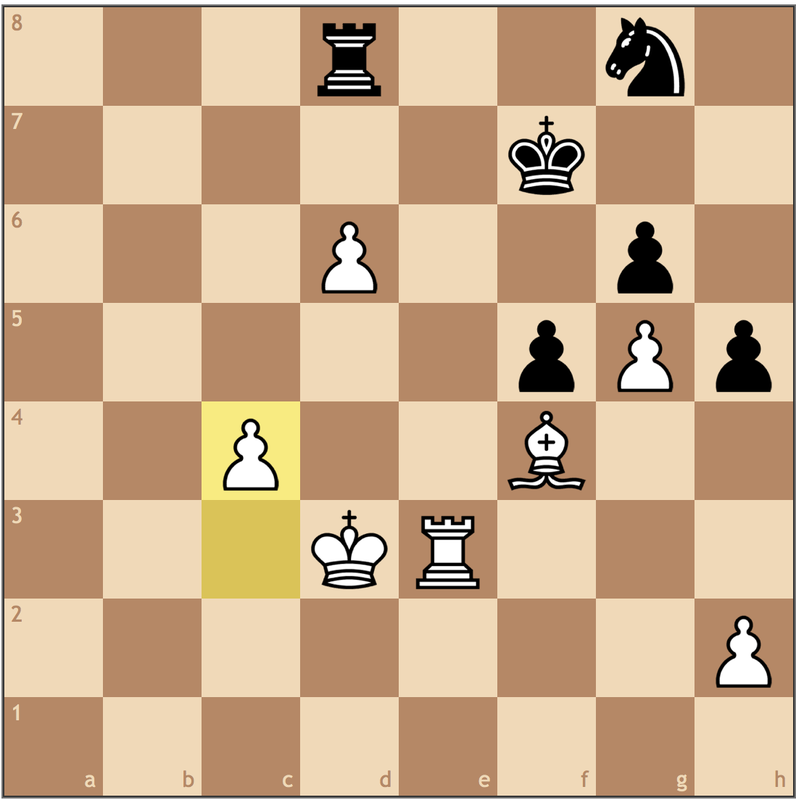 Carlsen decides to gain some tempi at the expense of Black’s passivity. 52…Rc4 53. d6 Rc6 54. Nxf8! 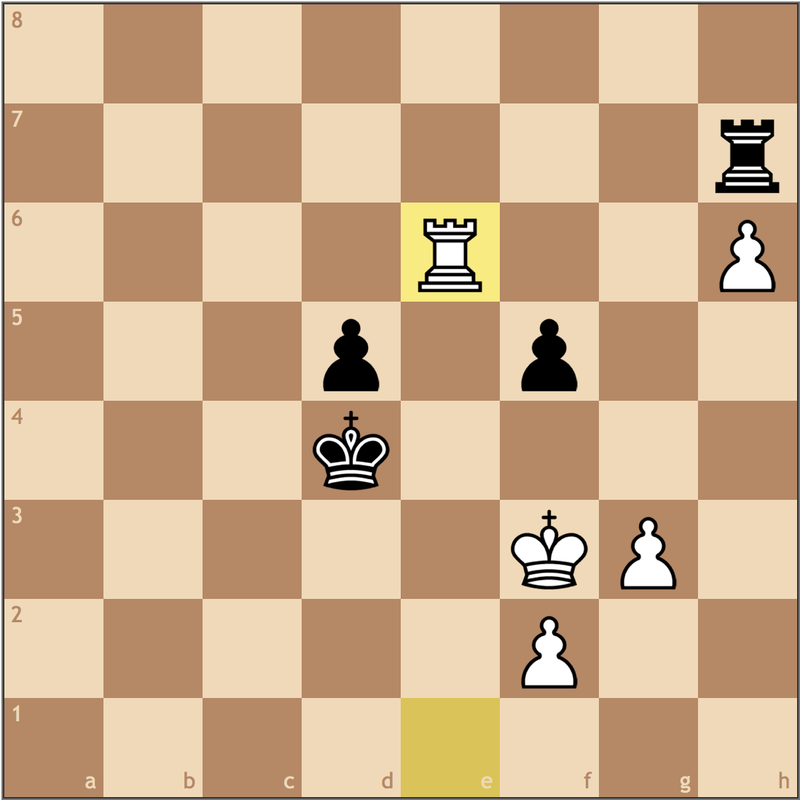 An important trade, as Carlsen eliminates one of Black’s best “defenders”. 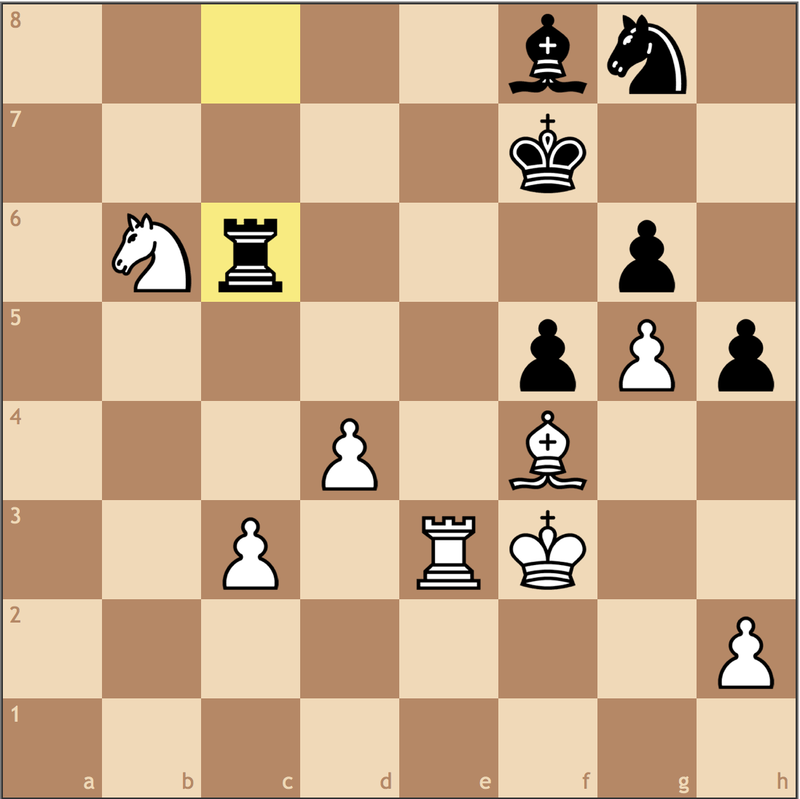 Now the knight on g8 is trapped forever, and White will have as much time to improve his position as he needs. Watch how Carlsen refuses to push the d6 pawn until his c-pawn is advanced and his king is in the game. Leko resigns as Carlsen’s intentions are clear. 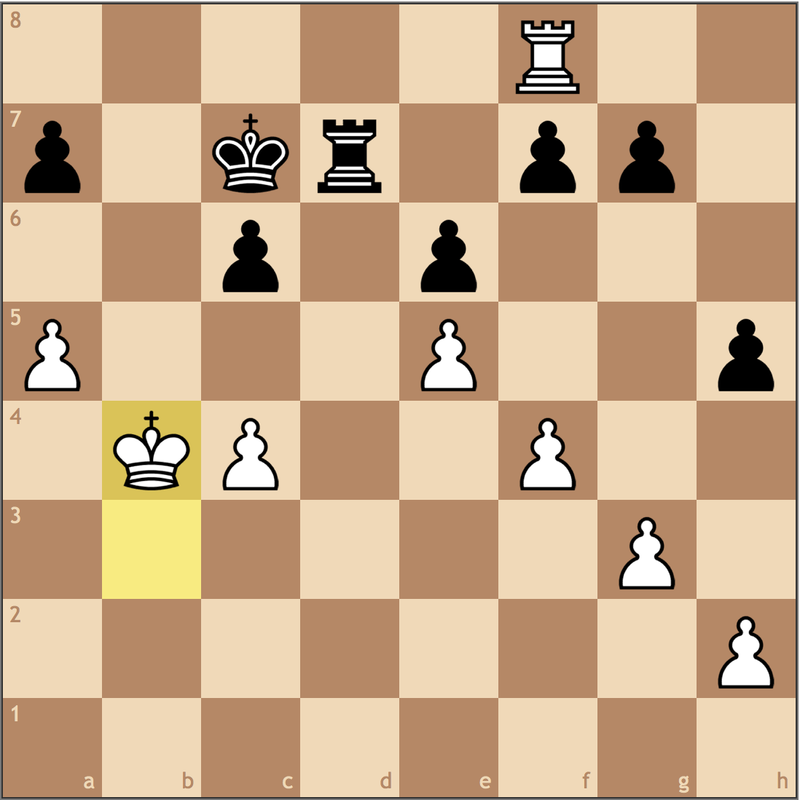 White’s king will march to d5, along with the c-pawn, which will quickly make way down the board. For Carlsen, I’m sure this endgame didn’t pose much of a problem, but from a technical point of view, it shows the overlap between better-placed pieces and limiting activity. If we can cramp our opponent’s pieces, we in turn have better pieces to stretch out their defenses. 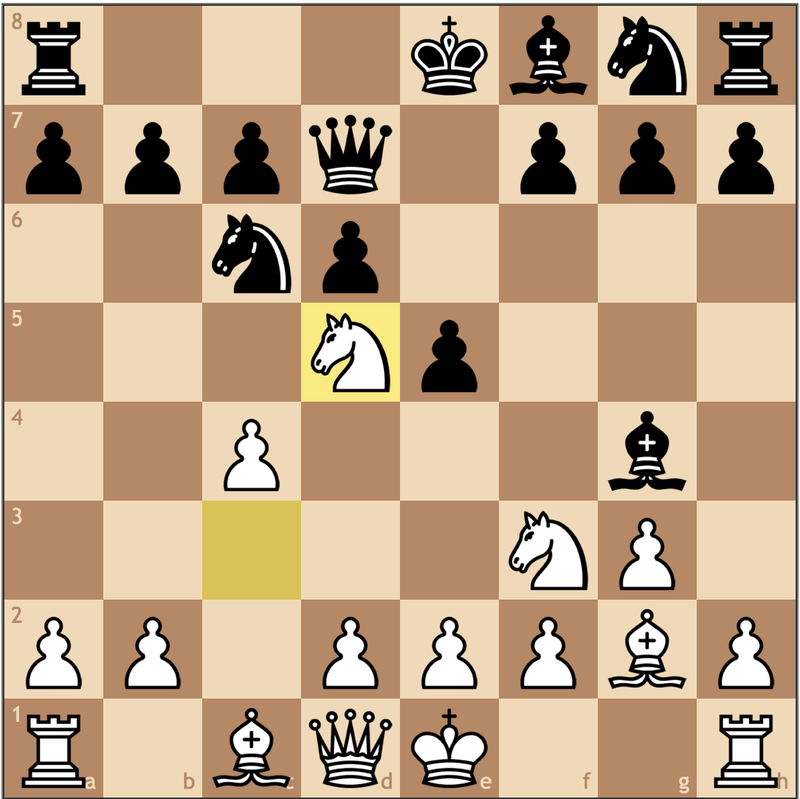 Should we stretch out the opponent, we can often limit their hand and thus dominate the board. Of course, chess isn’t so linear, but it’s always important to ask ourselves 1) how can we stop our opponent’s counterplay? and 2) how can I improve my position? While these are important questions to ask in each phase of the game, the endgame demands that we take these into consideration since timing is extremely crucial. 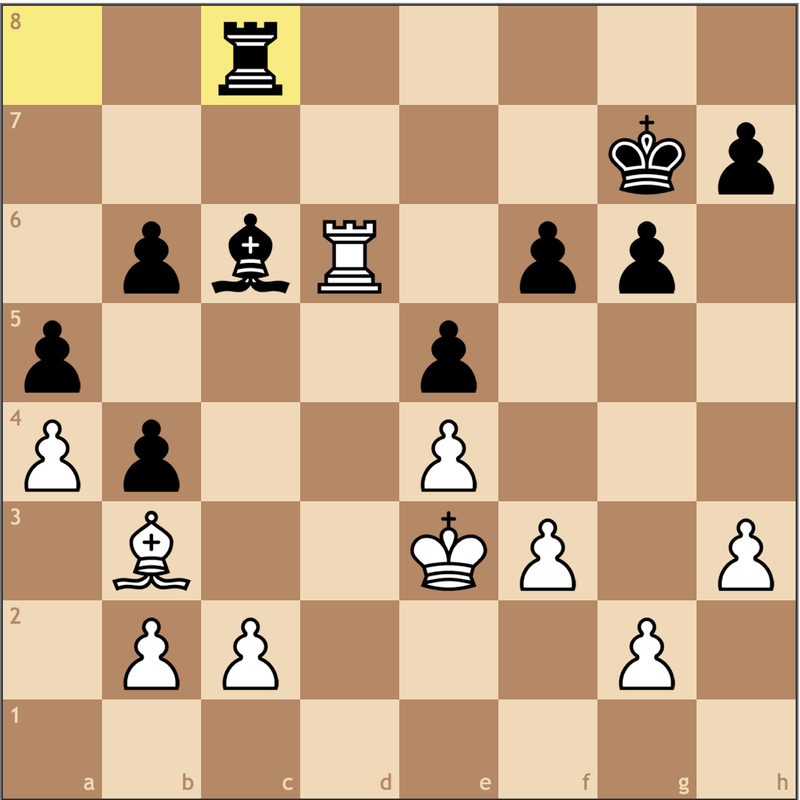 White is two pawns up, but it’s not so easy to convert. 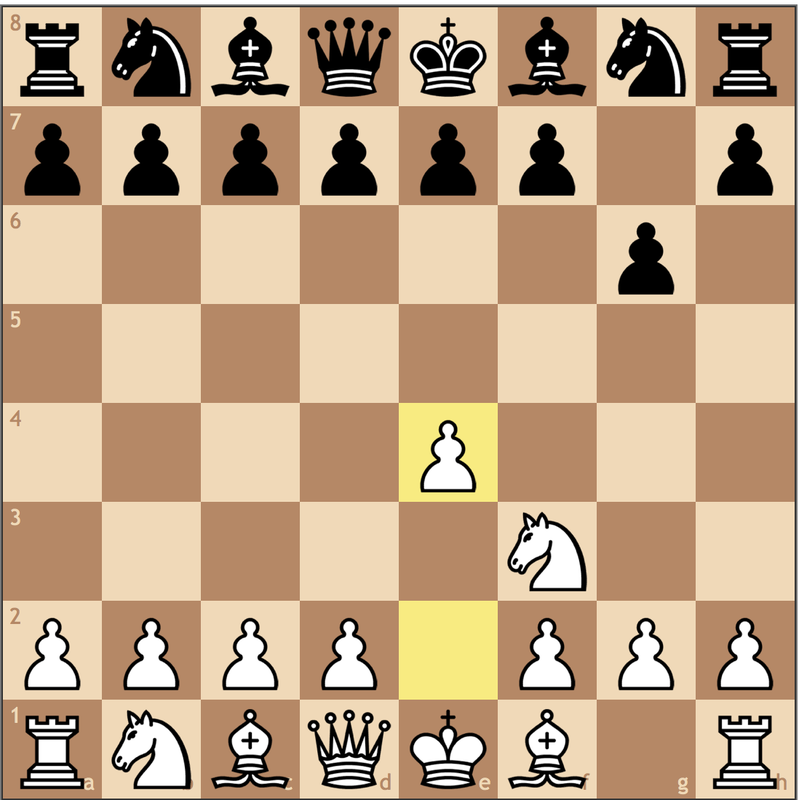 As you may know, a 4 v 3 pawn and rook endgame is a famous theoretically drawn position, and here it’s not so clear how the added c-pawn will help with each side possessing a pair of rooks. 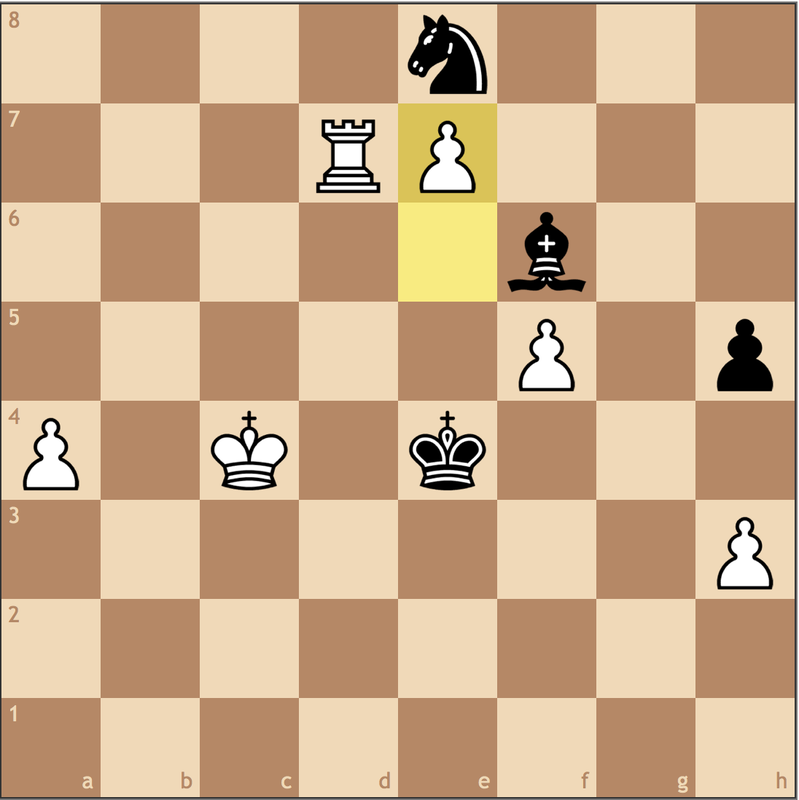 Carlsen makes the practical decision to weaken Black’s structure. I’m sure Carlsen recognized that without the c-pawn he can’t win, but he needed more weaknesses to make the c-pawn more valuable. In the starting position, White couldn’t hope to queen his passed pawn against Black’s forces, and the f7-g6-h7 structure was too solid to really find a breakthrough. 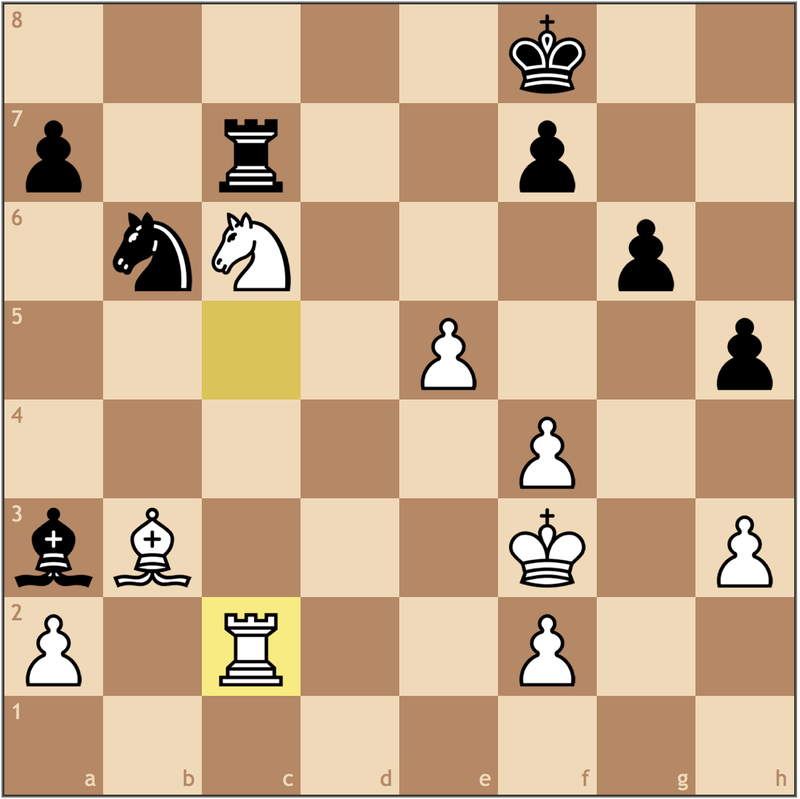 By trading on e6, White causes structural damage and hopes to execute the principle of two weaknesses. Carlsen cannot win by force, so he intends to do so by stretching Eljanov’s rooks to the defense of the e6 pawn and preventing the c-pawn’s promotion. Are the two weaknesses far enough? This is the debate for the next ten moves. 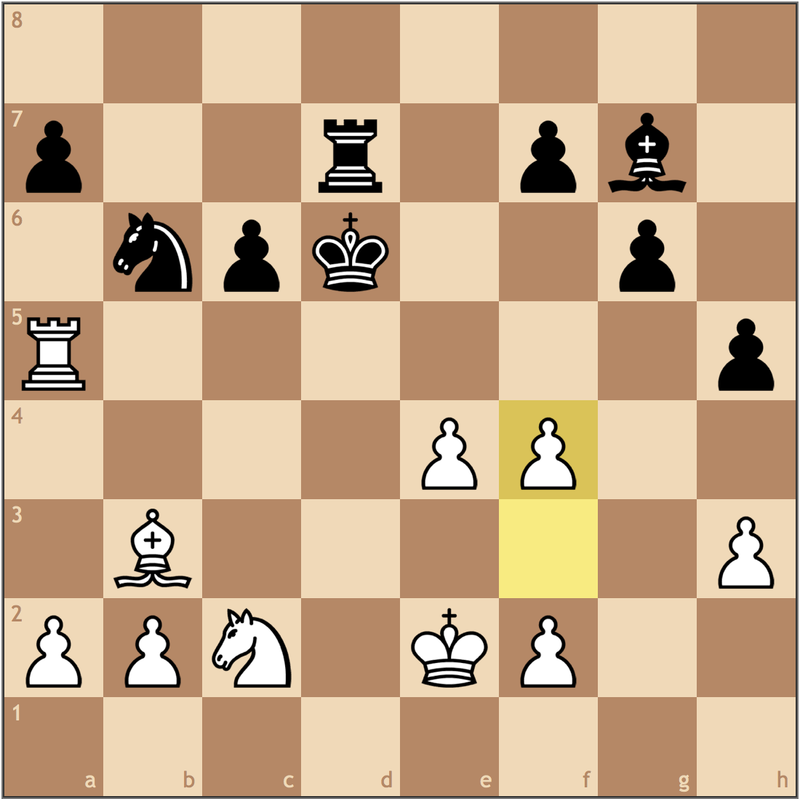 This move opens a route for Carlsen’s king, as well as offers potential kingside play with h4-h5 ideas. When trying to play against two weaknesses, it’s important to bring in as many pieces as possible to exert the most pressure. 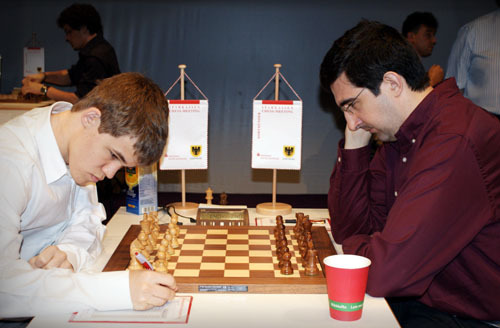 Before running to h2, Carlsen forces Eljanov’s rook on to a more passive square. 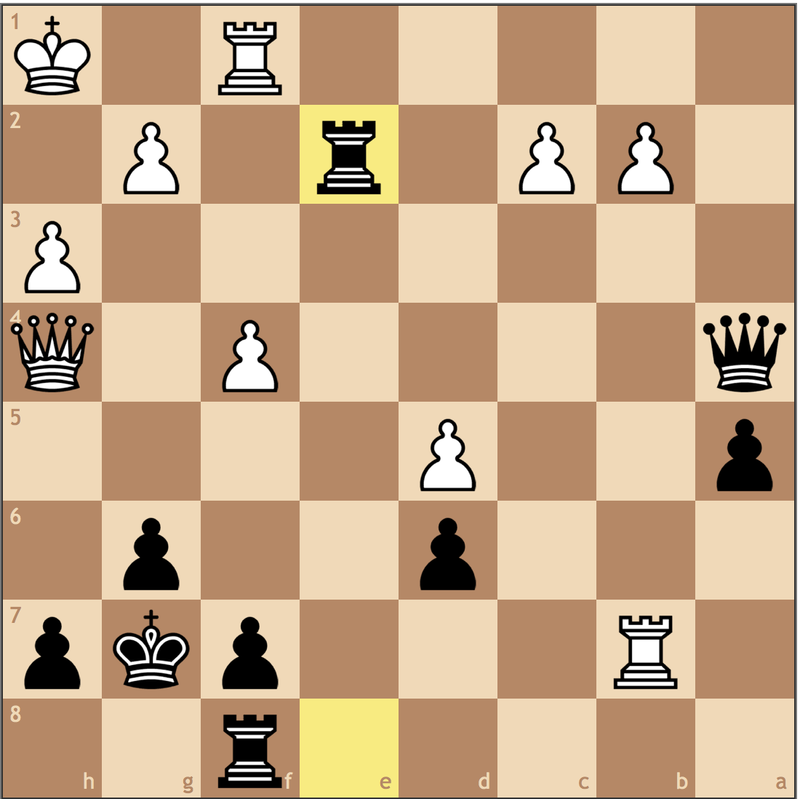 From d2, Black could put pressure on g2 as well as control the d-file. This tempo costs White nothing, and in turn Black’s rook does much less on d1. White still has an advantage, but it’s extremely slight. 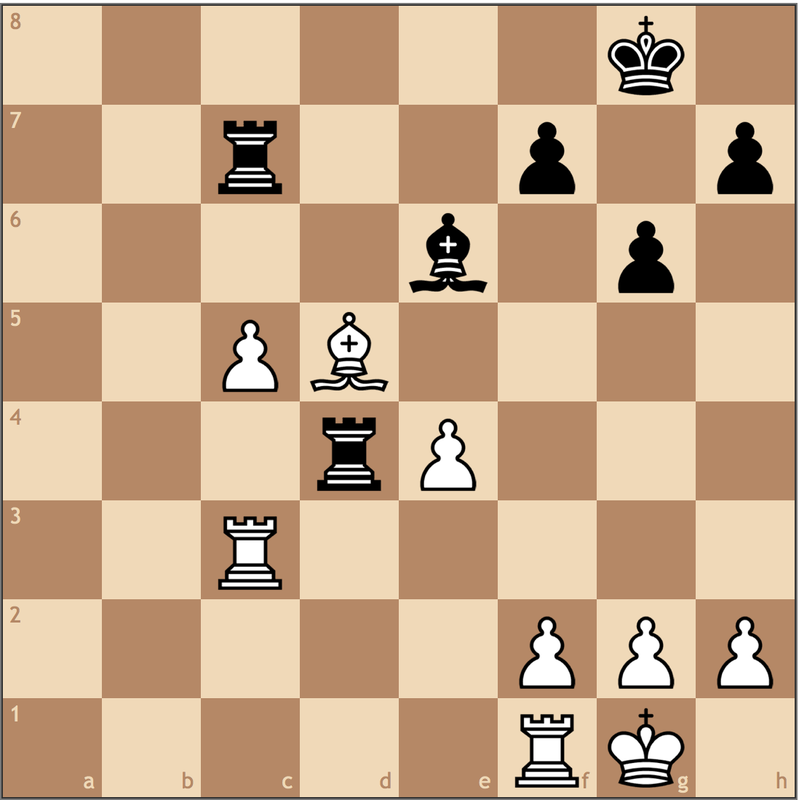 Eljanov has done well to defend the two weaknesses, so White must continue to find ways to improve the position. Here Carlsen finds a superior square for the rook on f2, where it now has the ability to play down the board. It doesn’t seem like much, but three moves ago, this rook was doing nothing on f1, now it’s the best rook on the board! 40. Kg3 Rb5 41. Rd3! Perhaps the two weaknesses were too close for Carlsen to make the most out of them, but without having done so, he would not have had the opportunity to trade weaknesses! It’s clear that the c-pawn is going nowhere, so Carlsen gives it up to pursue a weak king. 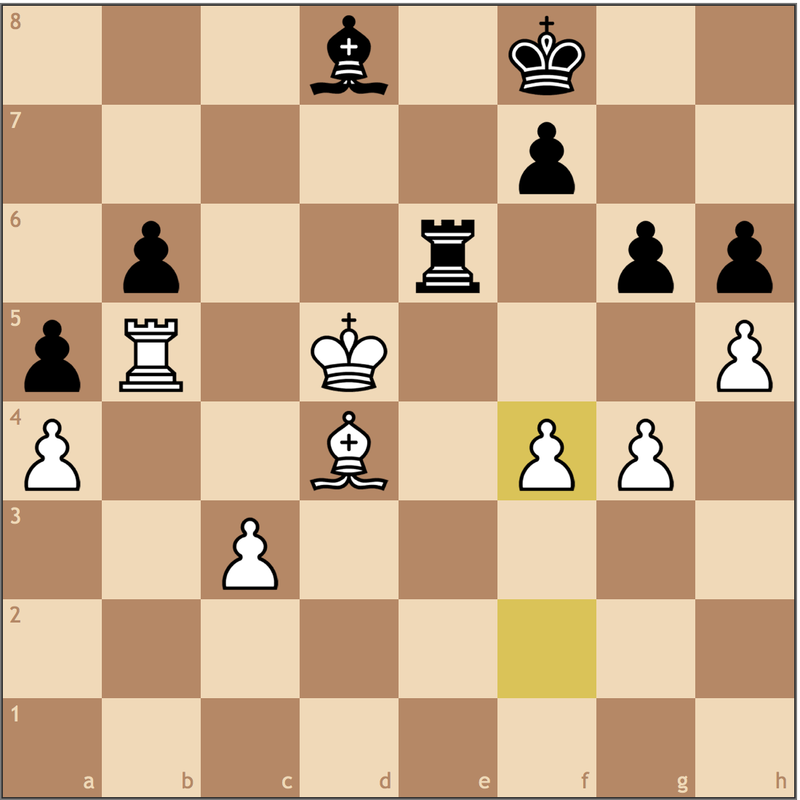 Another way to consider this move is that it activates White’s last rook. Since our analysis began, White has not been able to effectively use this rook because it’s been tied to the pawn. Just as I mentioned last post, activity can be more important than material, and here’s just another case. Meanwhile, Eljanov’s rooks are doubled on the c-file, pointing nowhere. With the threat of mate, White lures Black’s king back to f6, allowing Carlsen to fully regroup and take Black’s kingside pawns with him. 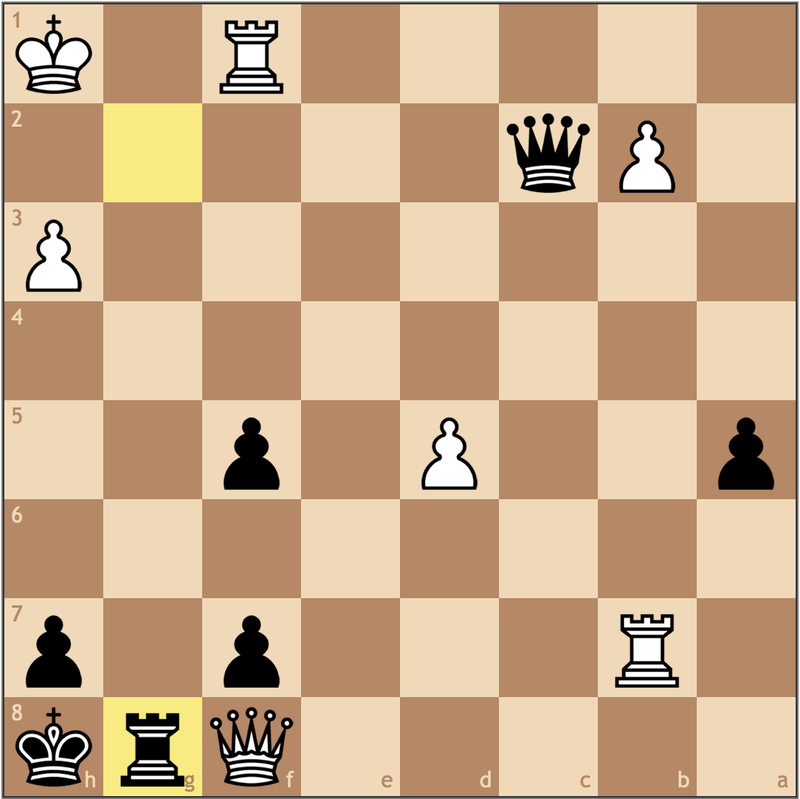 Black cannot save the kingside from falling apart, and all resulting endgames will be lost. This was a particularly impressionable endgame, because Carlsen managed to win by finding minor improvements along the way, particularly focusing on the placement of rooks. 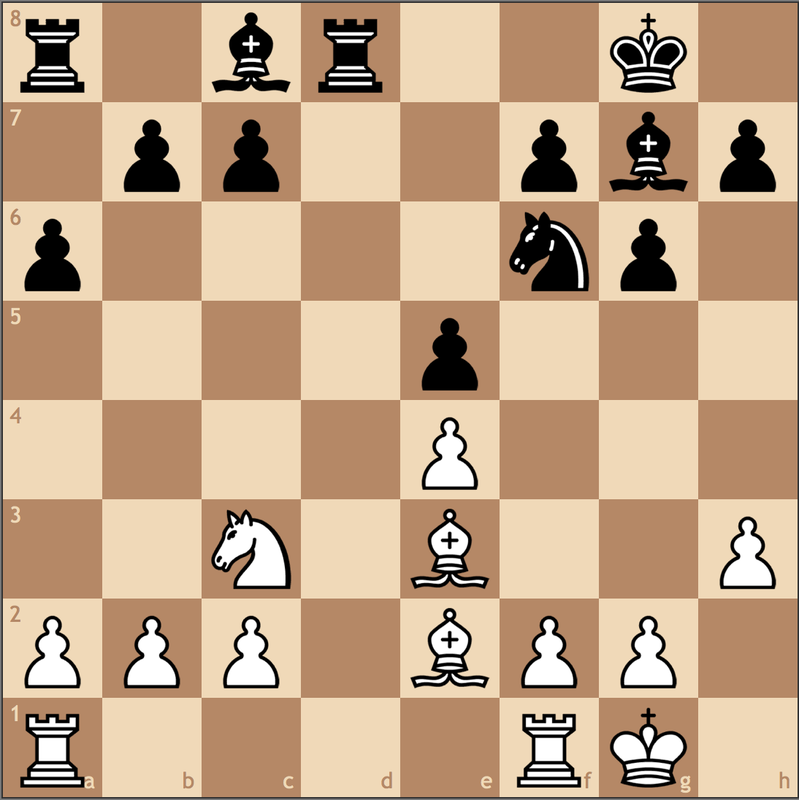 Through the use of the principle of two weaknesses, Eljanov was stretched just enough to create a third, which is just enough to have a decisive position. 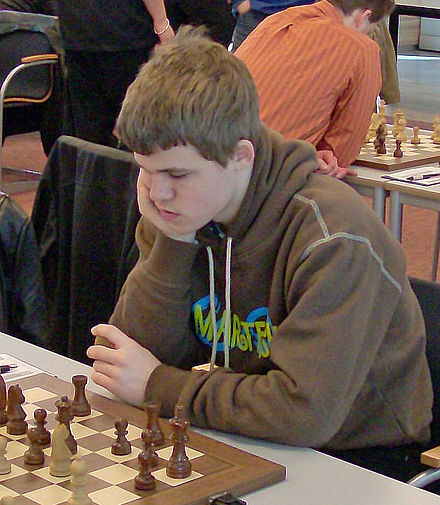 By 2009, Carlsen had already captured the attention of most of the chess world and was only years out from his first World Championship. For our last position, I wanted to share a case where better-placed rooks offer pleasant tactical simplifications into won endgames. 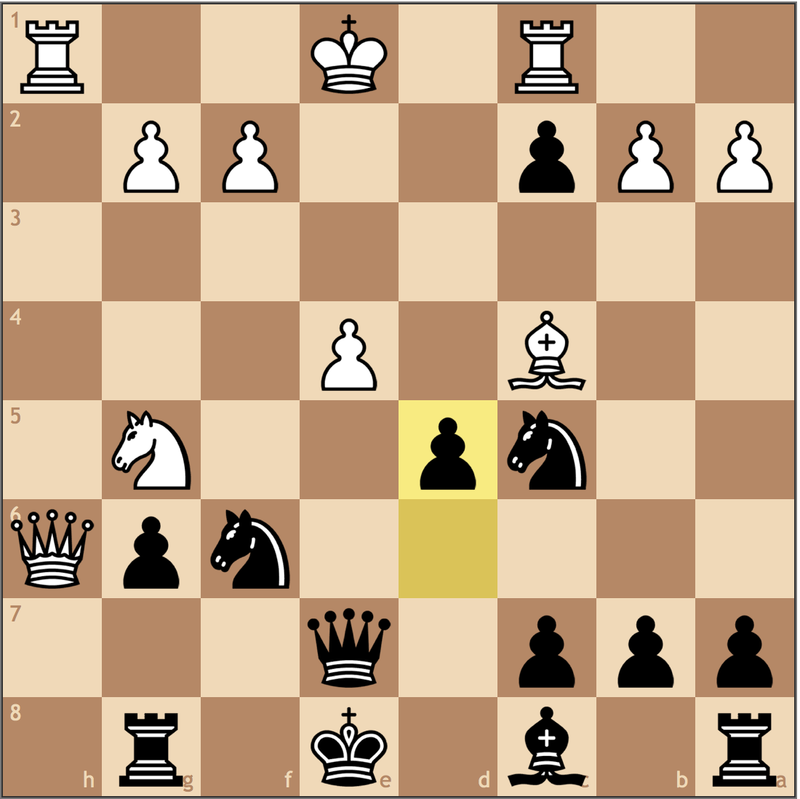 Well, you can probably predict what I’m going to say here – Black’s rooks are extremely passive, especially the rook on b8, chained to the b7 pawn. 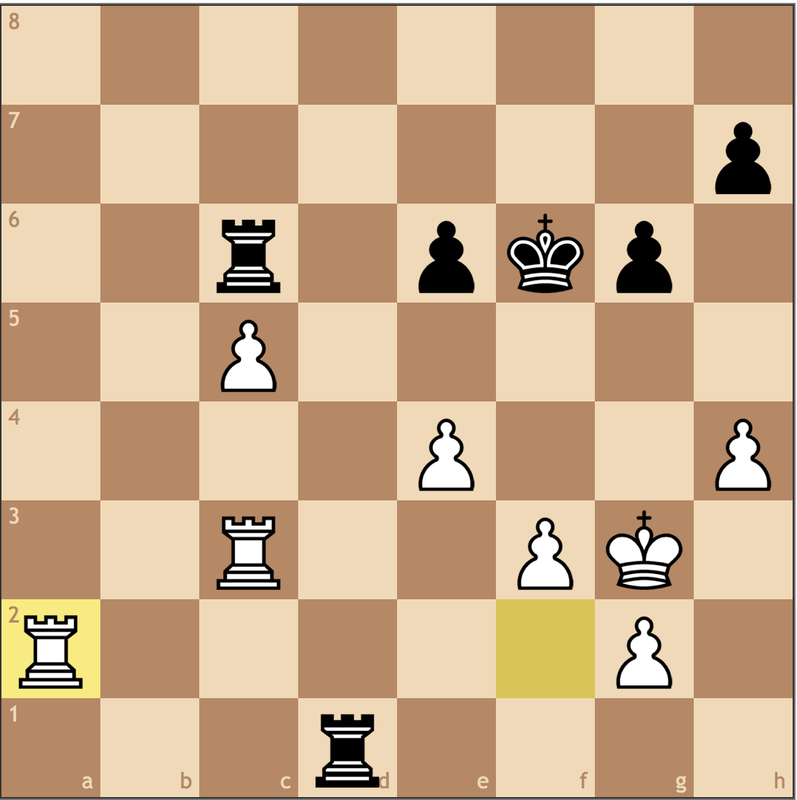 That being said, can you find the tactical solution Carlsen found to take this advantageous position into a winning one? 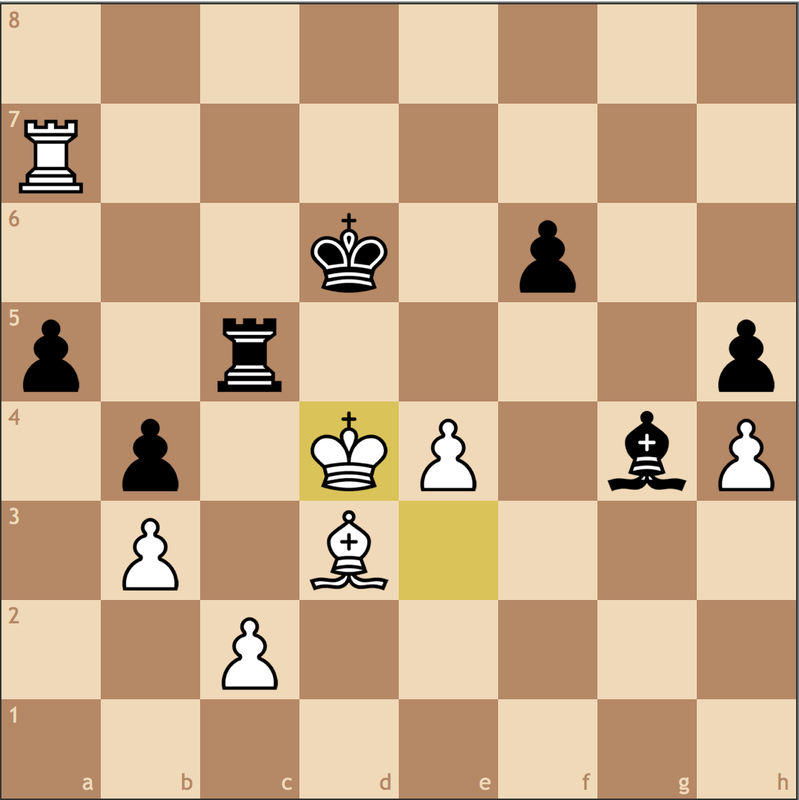 Even if Carlsen wasn’t guaranteed his material back, the exchange sacrifice was enough to damage Black’s position beyond repair. Given a choice between allowing a fork on f6 or giving back the exchange on b8, Grischuk desperately tries to find counterplay. Sure, the position has opposite-colored bishops but given the advances of White’s queenside majority and Black’s displaced b8 rook, that doesn’t matter now. How did Carlsen put this game away? 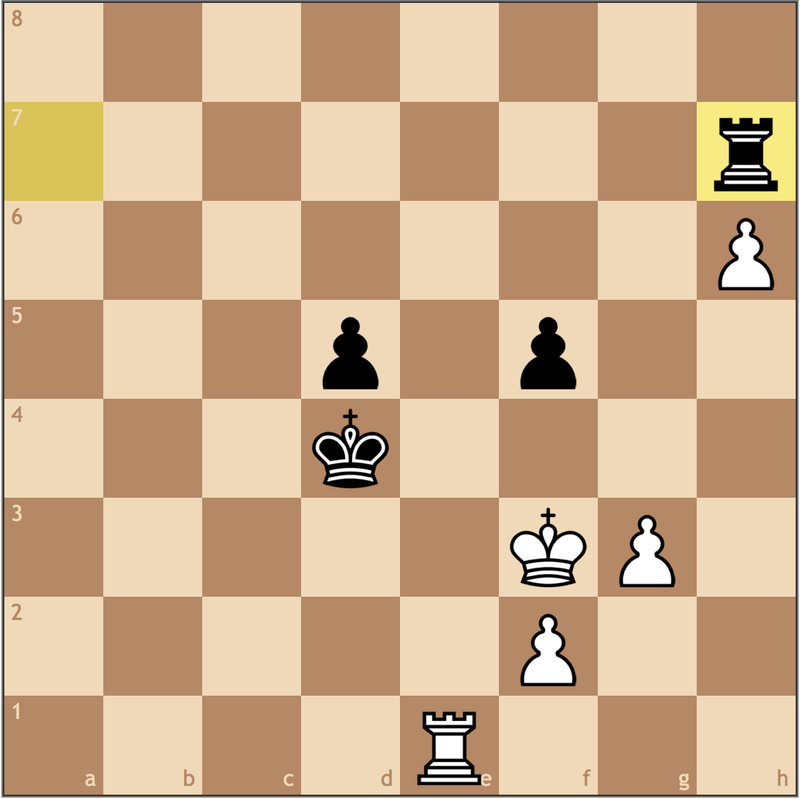 Black doesn’t have time to take the bishop since White’s pawns are moving too quickly. As Grischuk was to discover, however, the bishop has to be taken at some point. As goes the general rule, two passed pawns beat a rook. 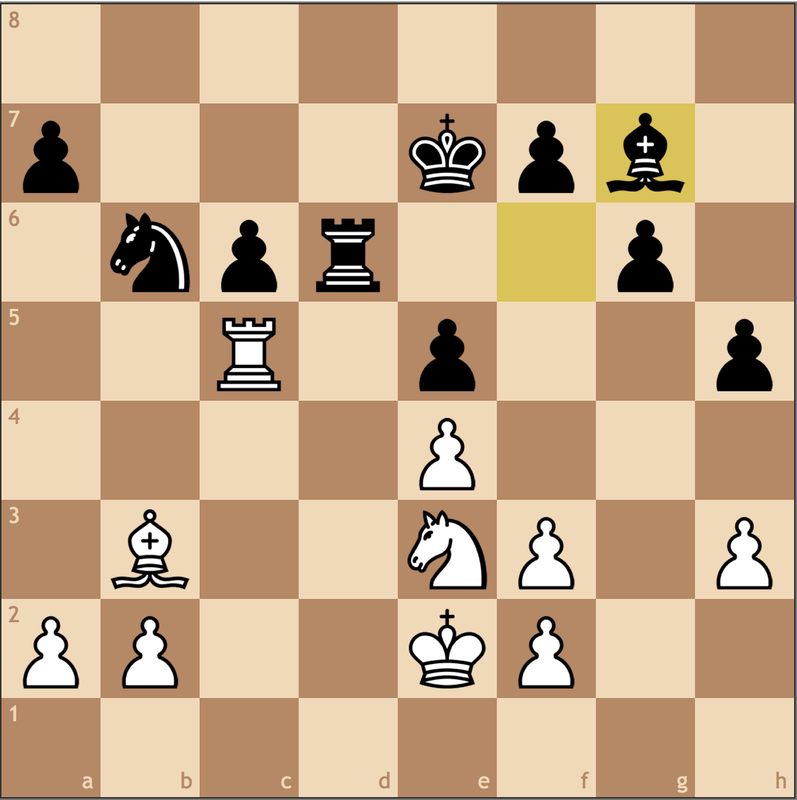 Here, with a rook on d1, Carlsen shows that the added f6 bishop doesn’t help Black’s cause. An important insertion, as 36. c7? would allow 36… Rc6! and Black is holding. 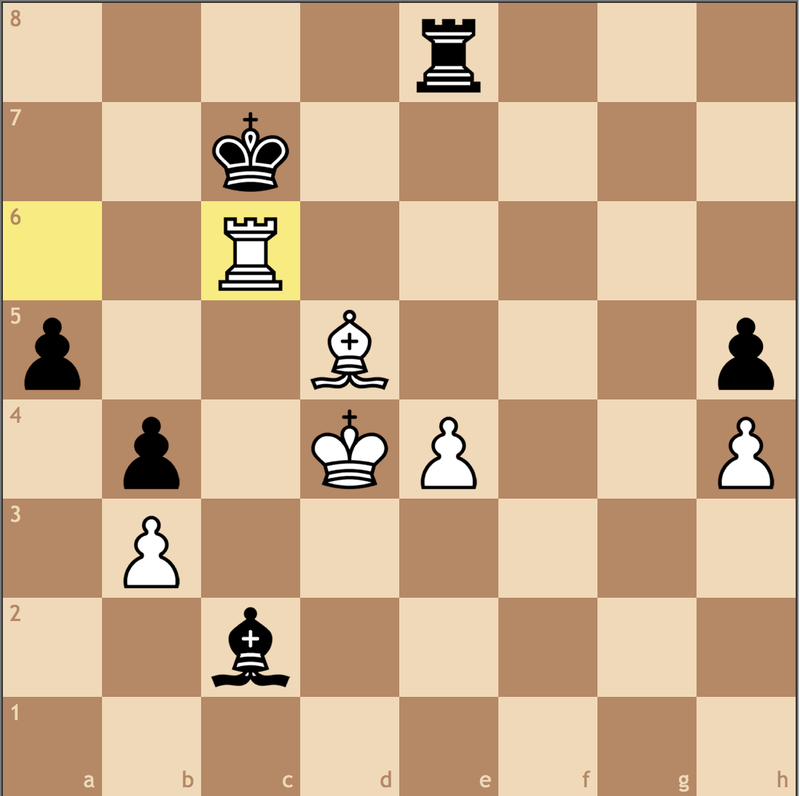 A nice way to end the day’s lesson, as White’s rook places itself better than Black’s one last time. And Grischuk understandably resigns here. A nice tactical display by the future World Champion! I hope these last two posts have given you all a lot more insight into active endgame play. In each case, Carlsen found ways to maximize his advantages by either limiting his opponent or stretching them across the board. While the two can overlap, they aren’t necessarily interchangeable, and one must be used as a means of achieving the other.